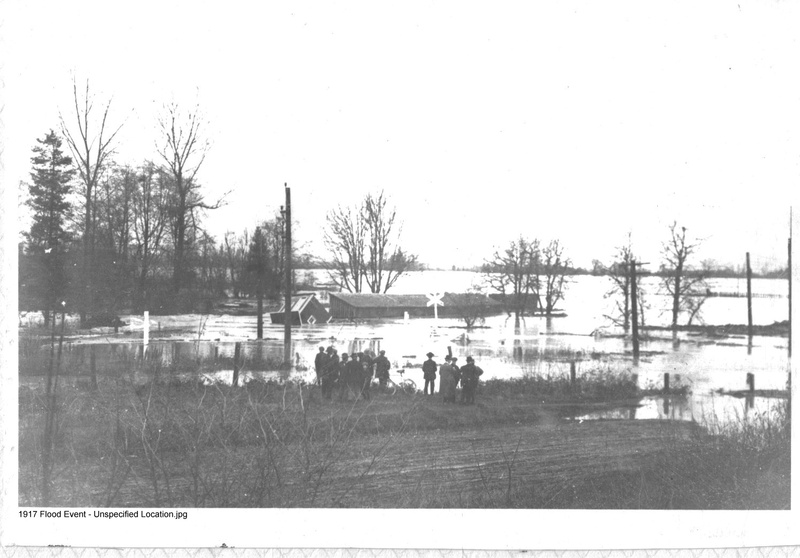 For the story behind the pictures - please go HERE and search our document & historical newspaper archives. 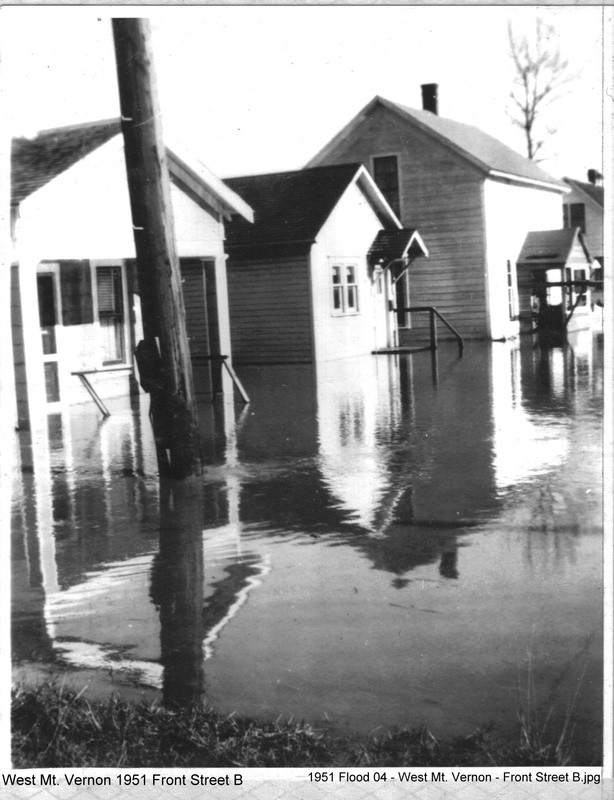 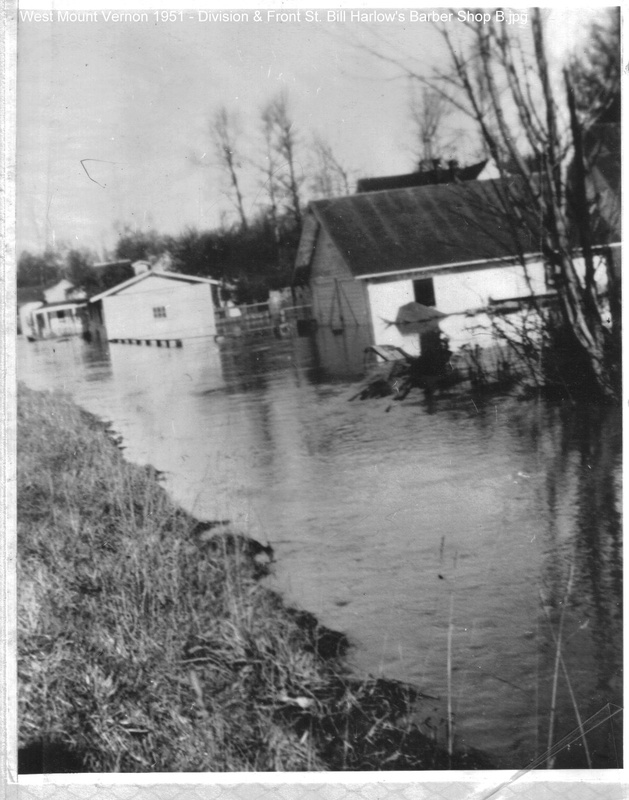 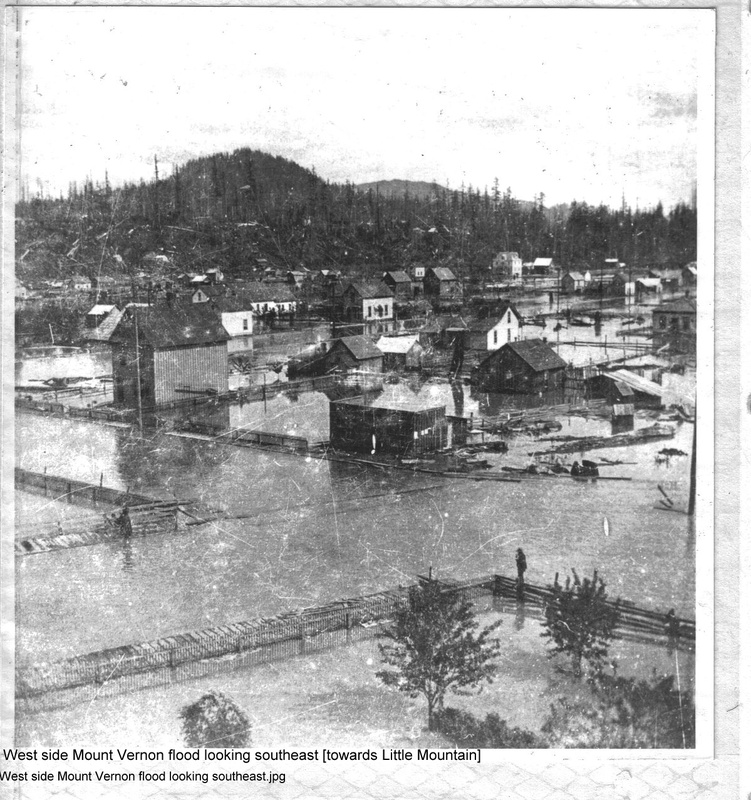 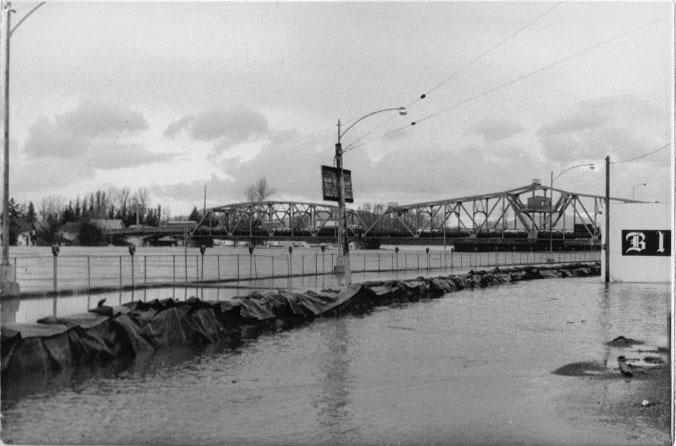 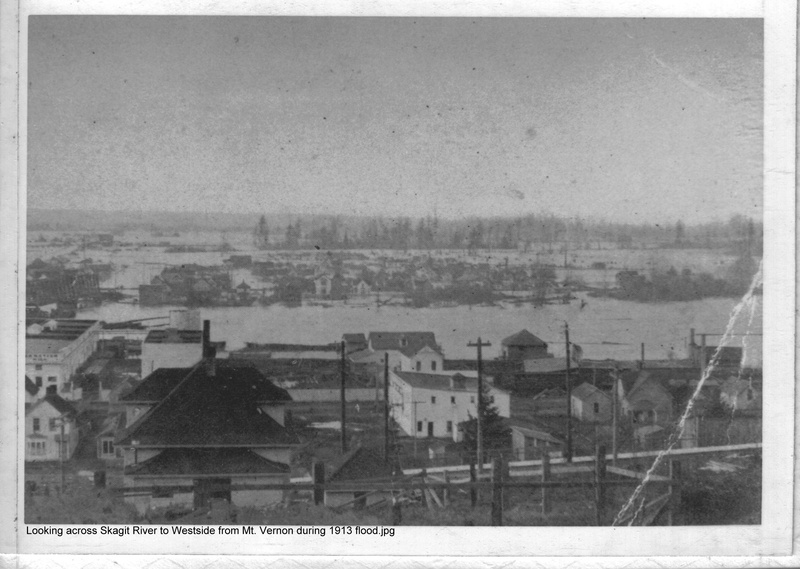 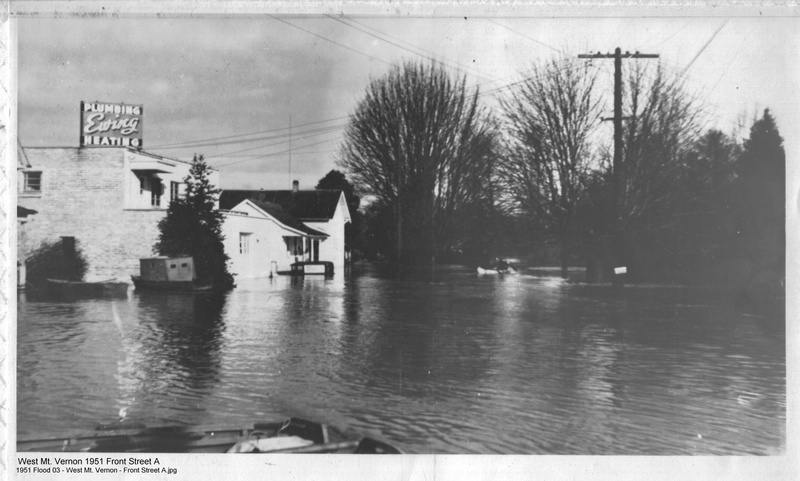 1951 Flood - West Mount Vernon - Division & Front St. Bill Harlow's Barber Shop 1951 Flood - West Mount Vernon - Division & Front St. 1951 Flood - West Mount Vernon - Division & Front St.
Ct. House (Matheson Bldg) 1st. 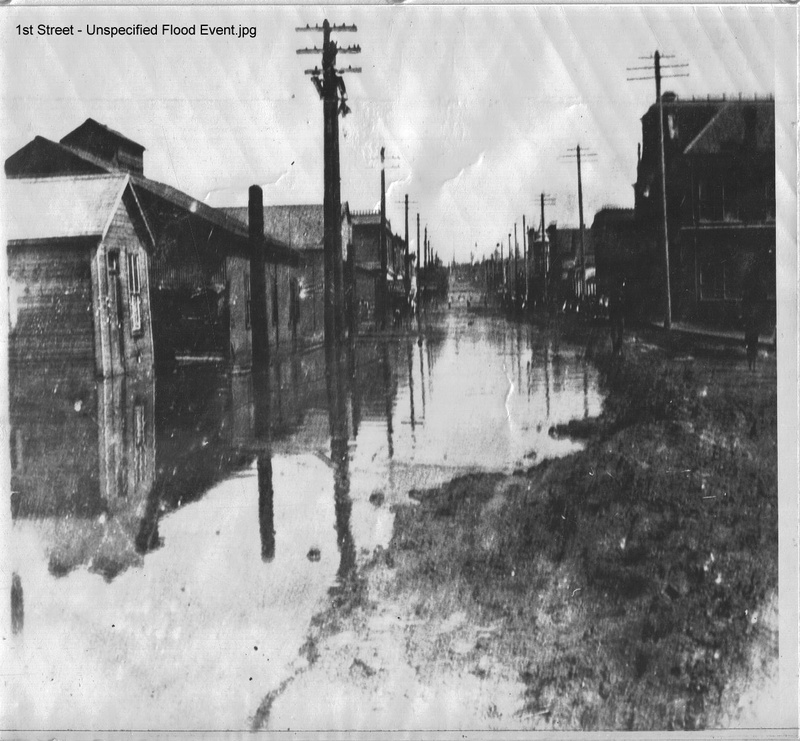 St. - Unspecified Flood Event Looking down from 9th St. Lincoln Hill at Rt. 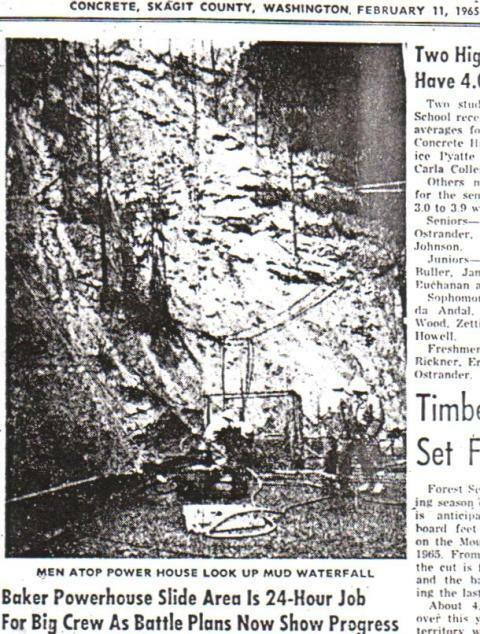 See 1935 articles: 1/25/35 MVDH, 1/26/35 MVDH, 1/31/35 Argus, 1/31/35 Argus, 1/31/35 CT, 1/31/35 C.H, 1/31/35 C.H. 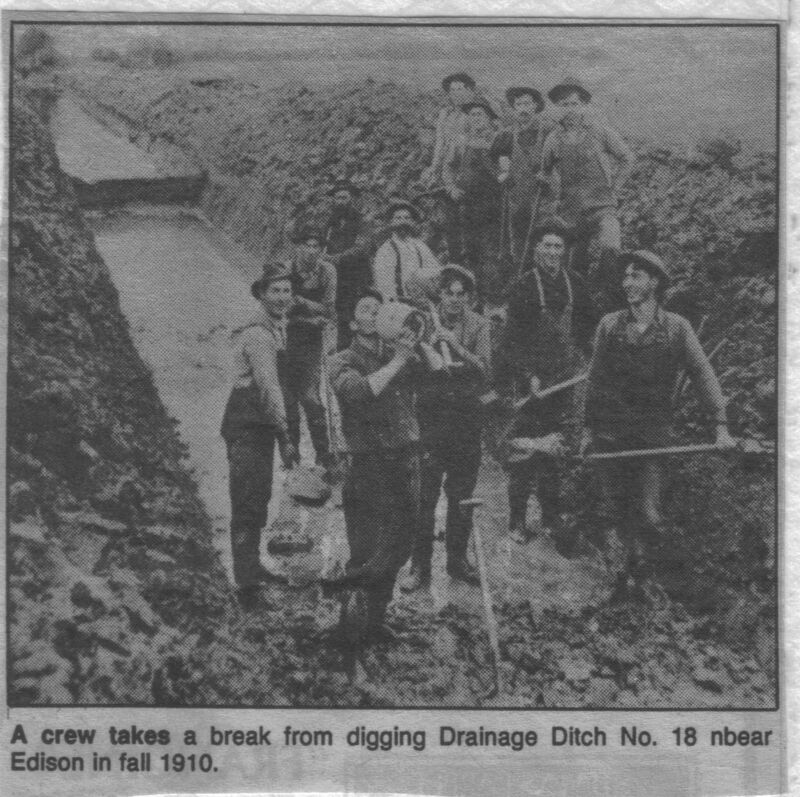 For more information - please go HERE and search our archives. 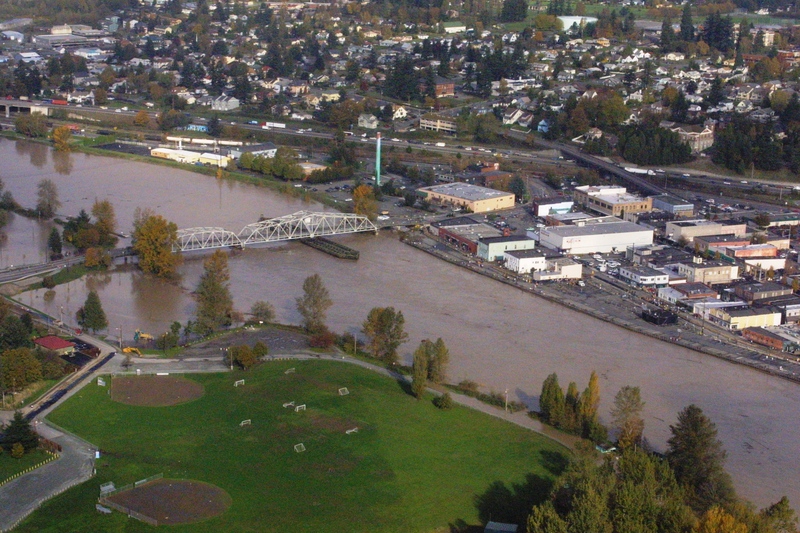 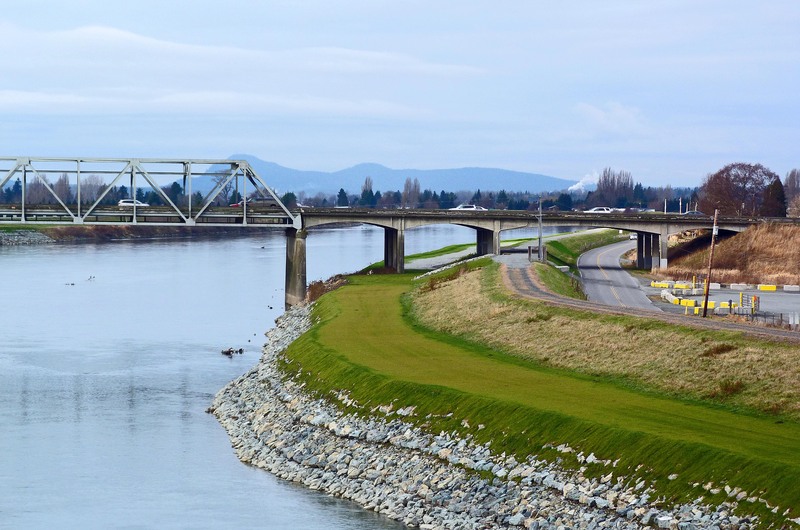 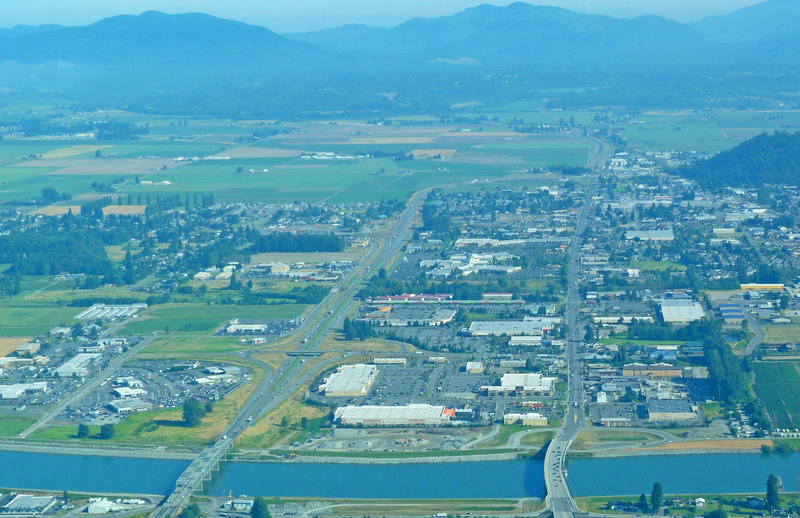 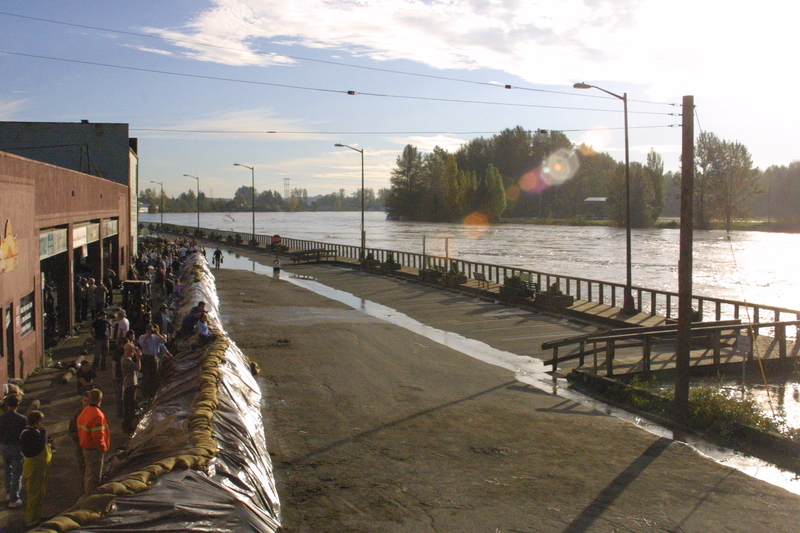 Skagit River Jam Memorial Panorama from Eaton's Books to Division Street Bridge looking southwest, Skagit River at 29' elev. 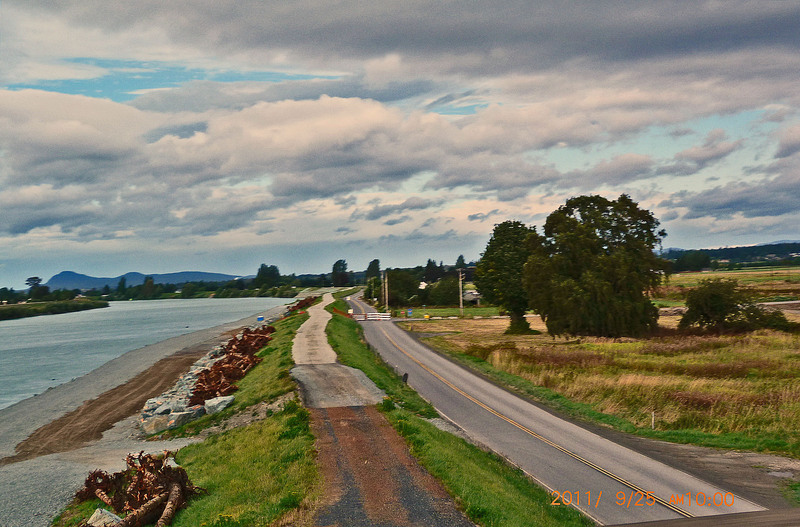 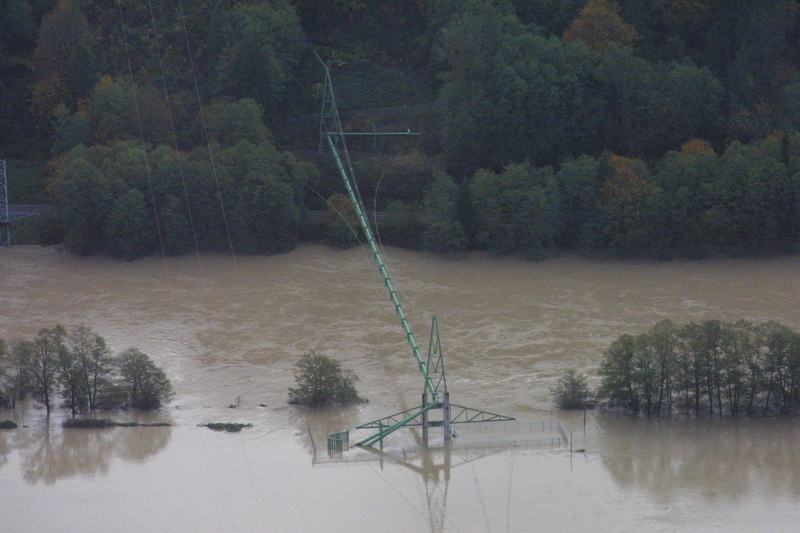 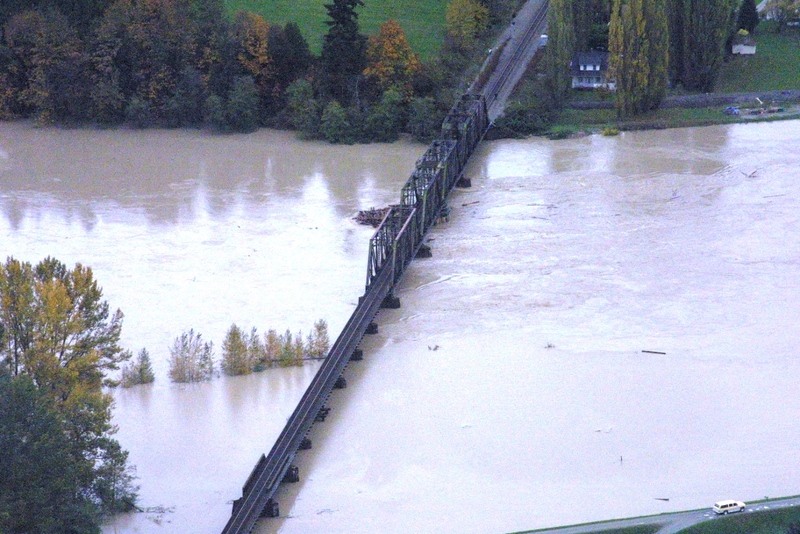 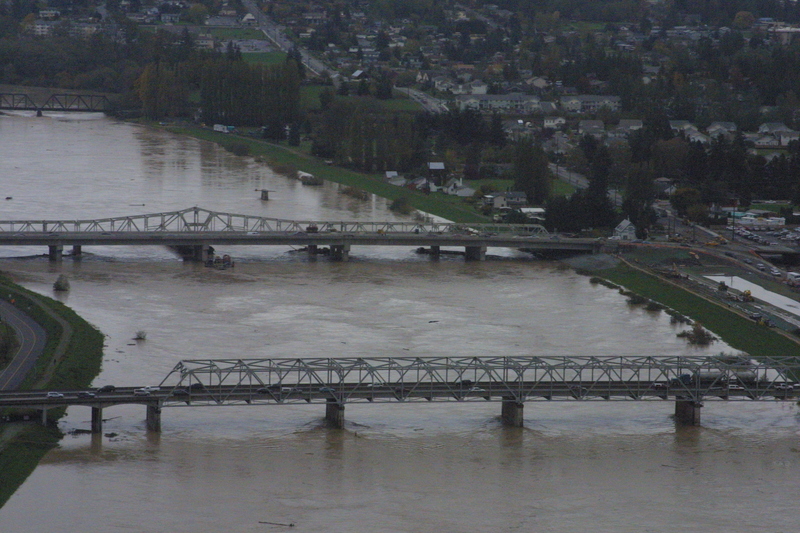 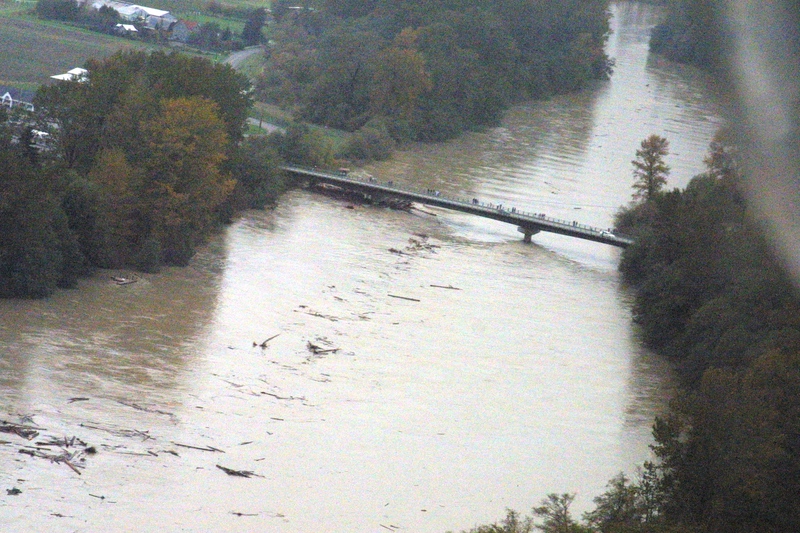 Photo taken 9:15 AM from Division Street Bridge, Skagit River at Mount Vernon at 29.260' elevation. 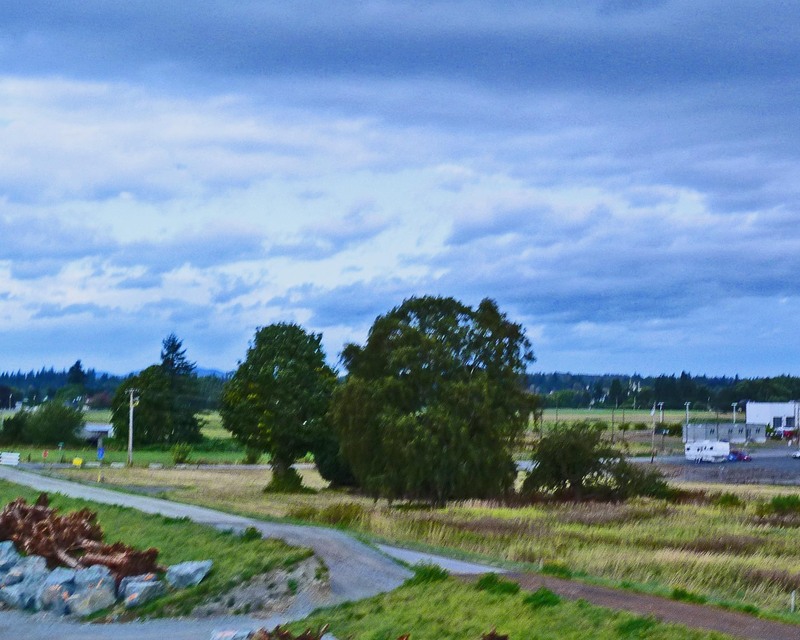 Looking between Hwy 99 Bridge to the north & I-5 Bridge to the South Big rocks waiting to be placed south of the I-5 Bridge on the Burlington bank. 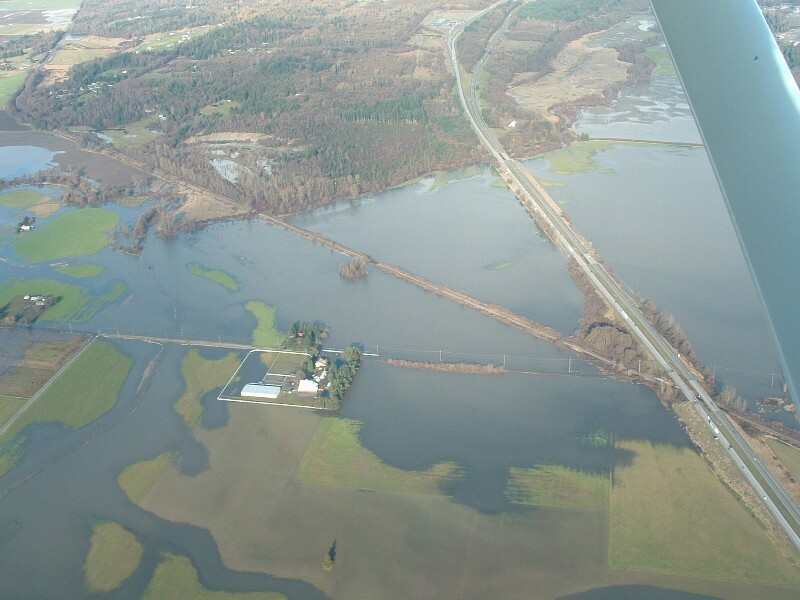 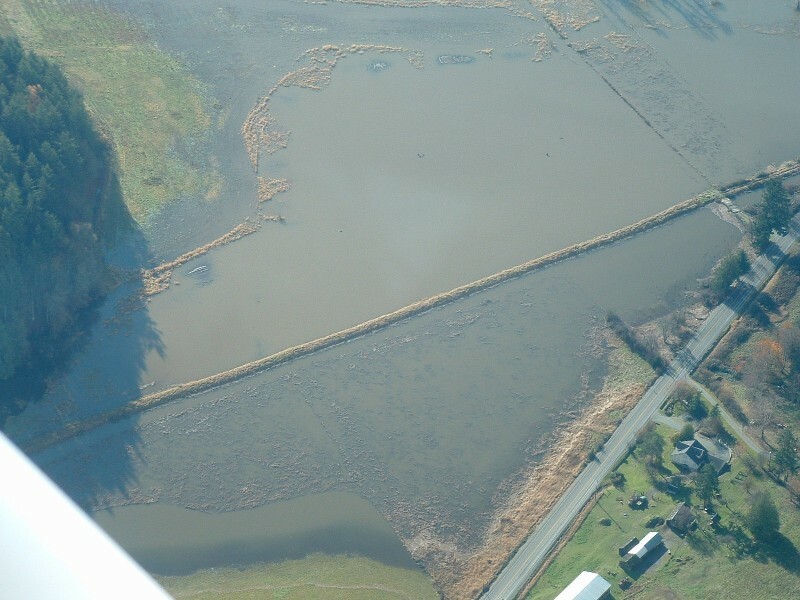 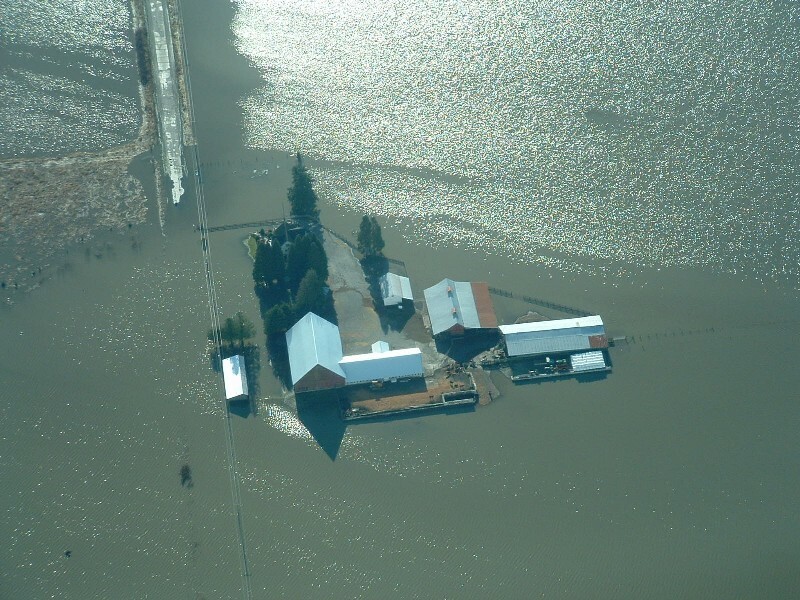 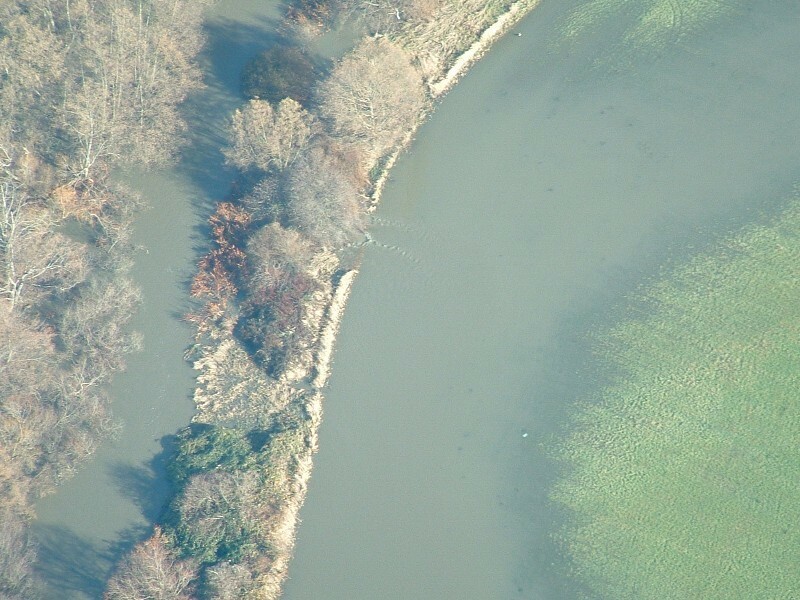 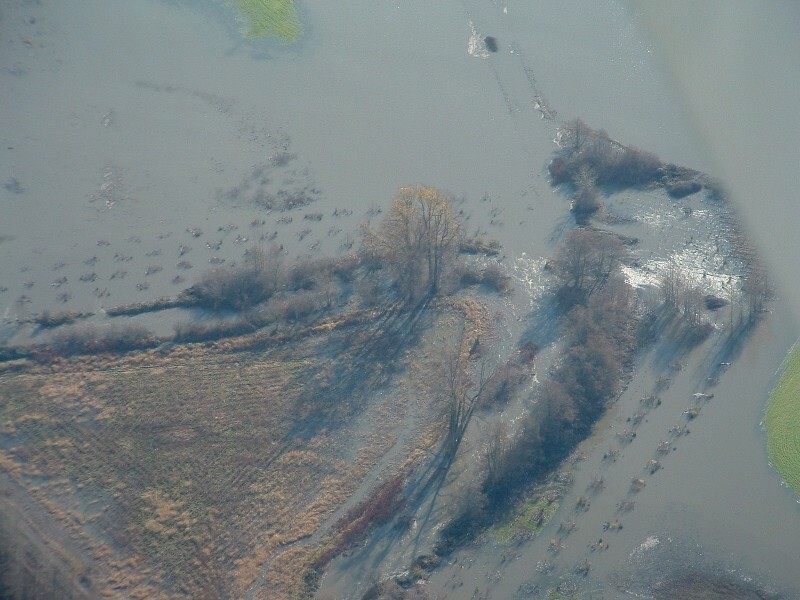 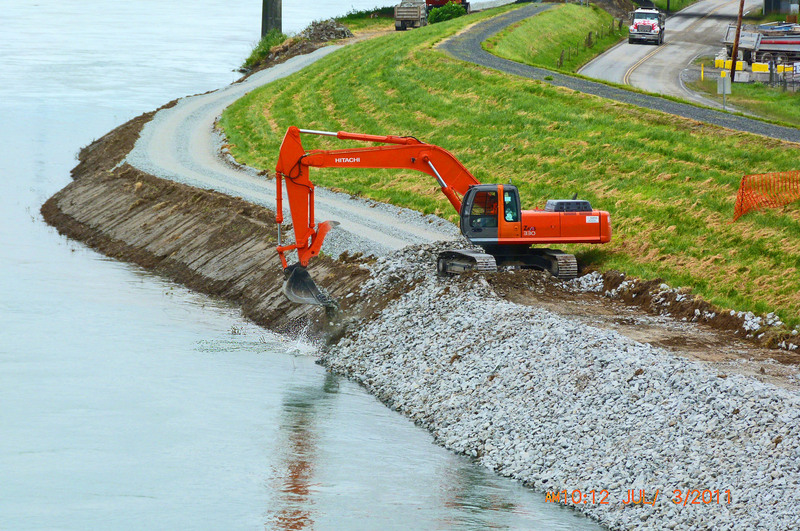 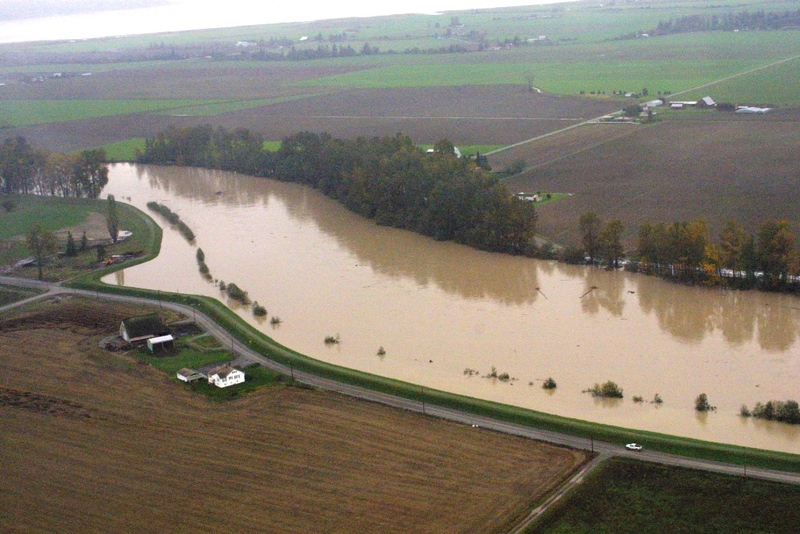 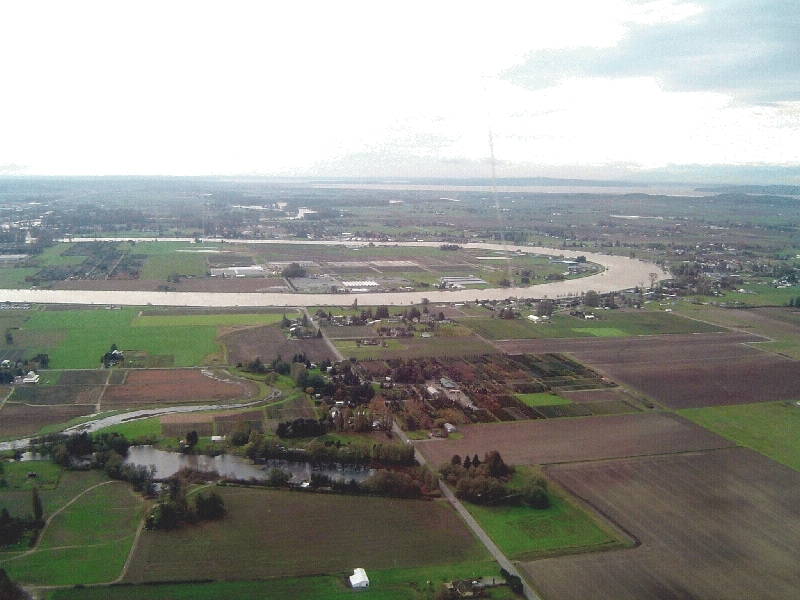 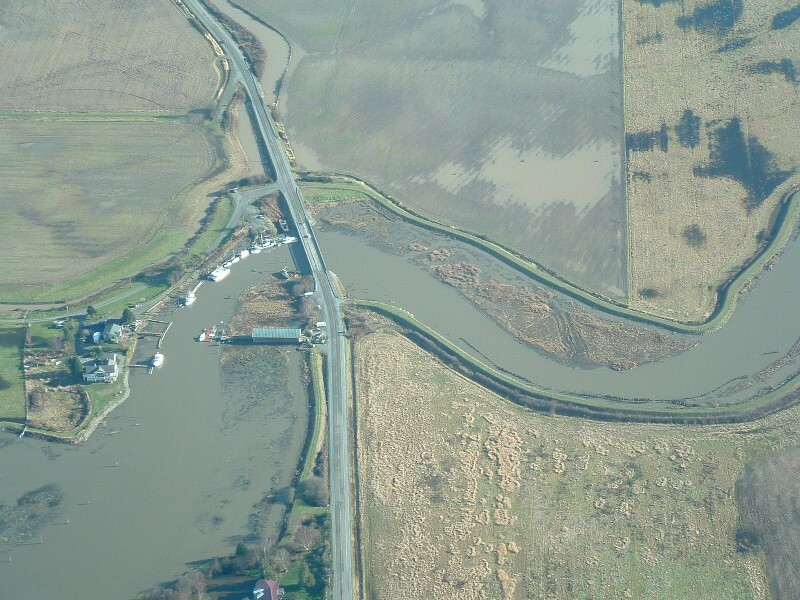 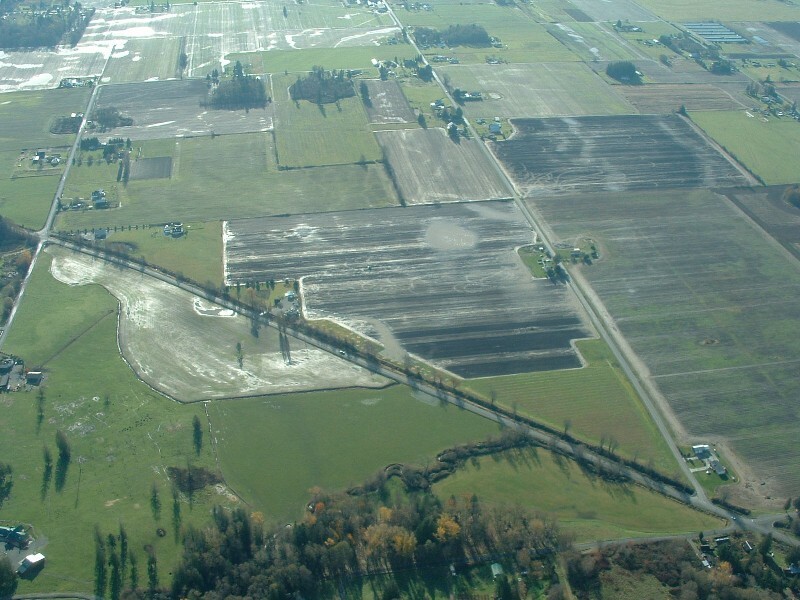 Aerial photo of Dike District 12 levee work north of Hwy 99 Bridge. 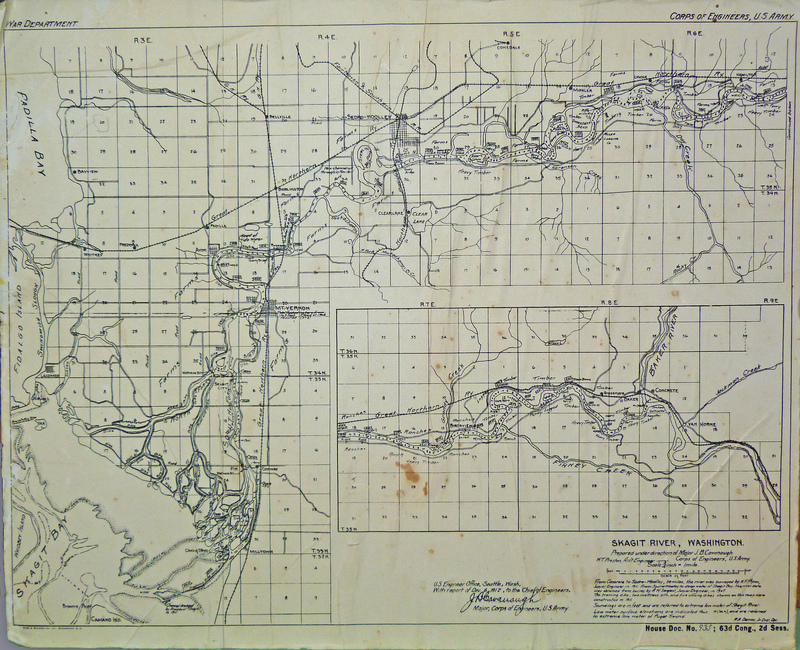 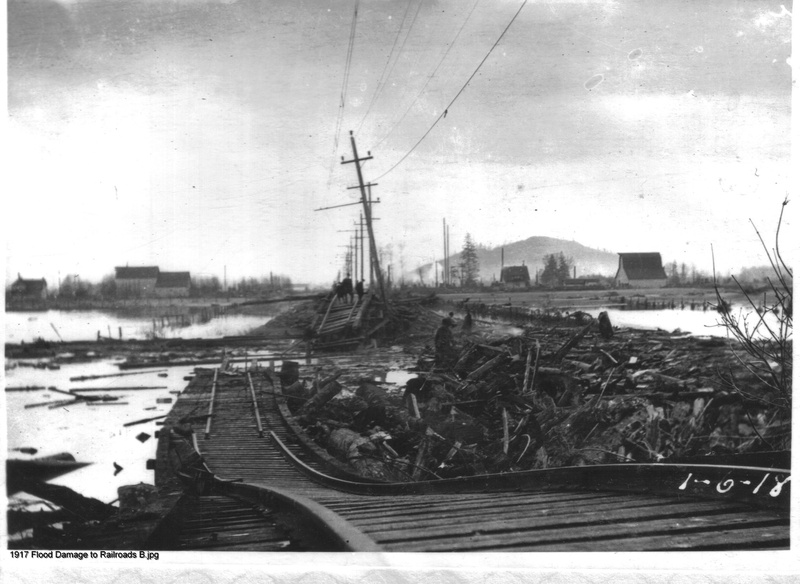 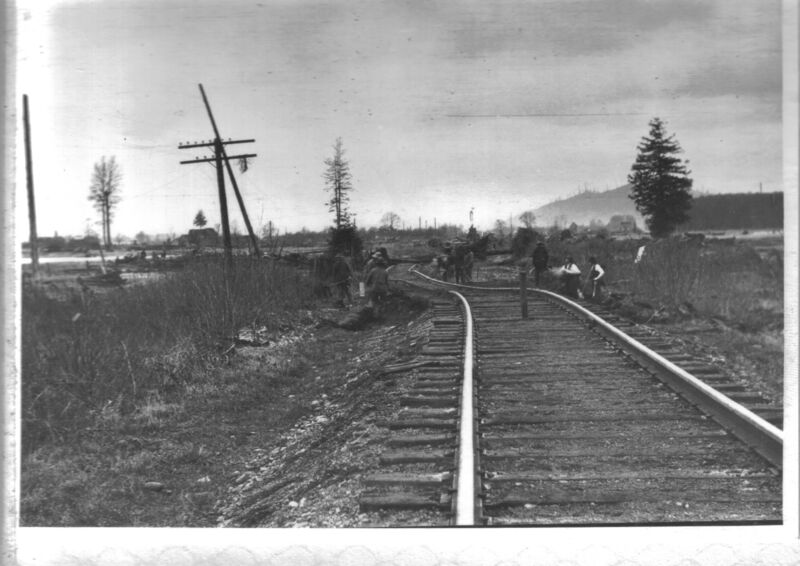 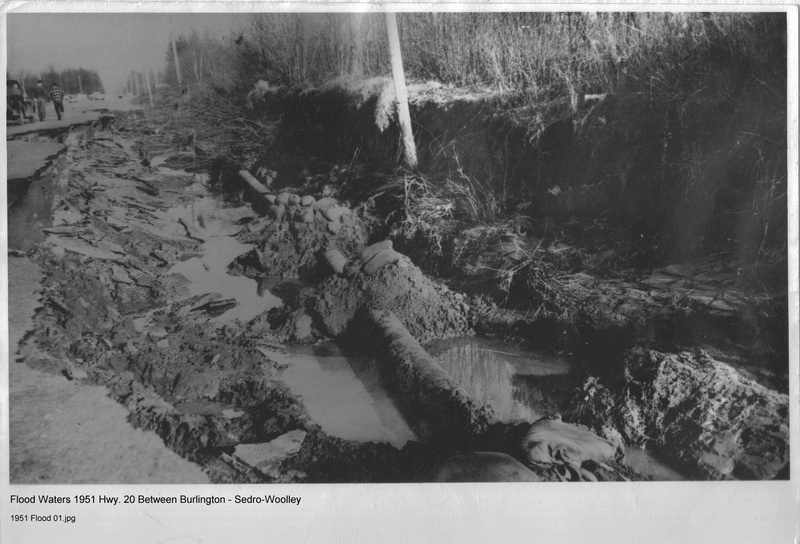 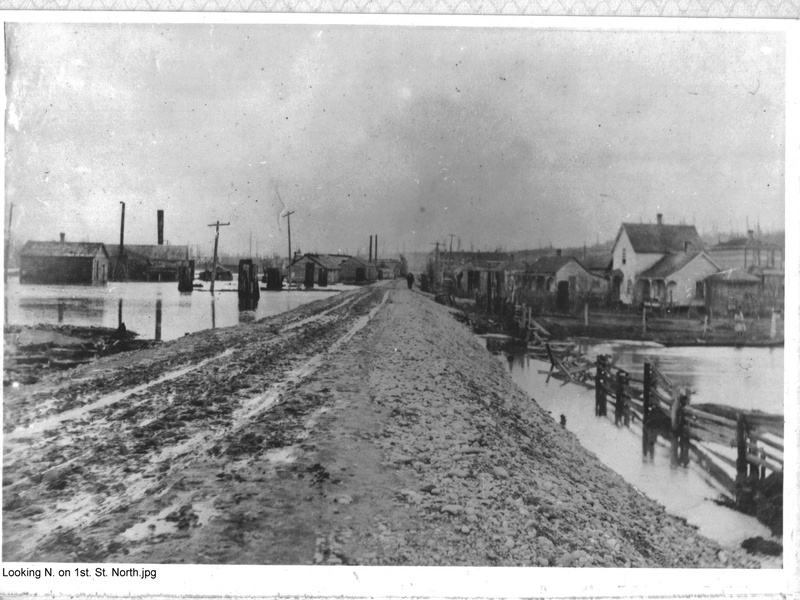 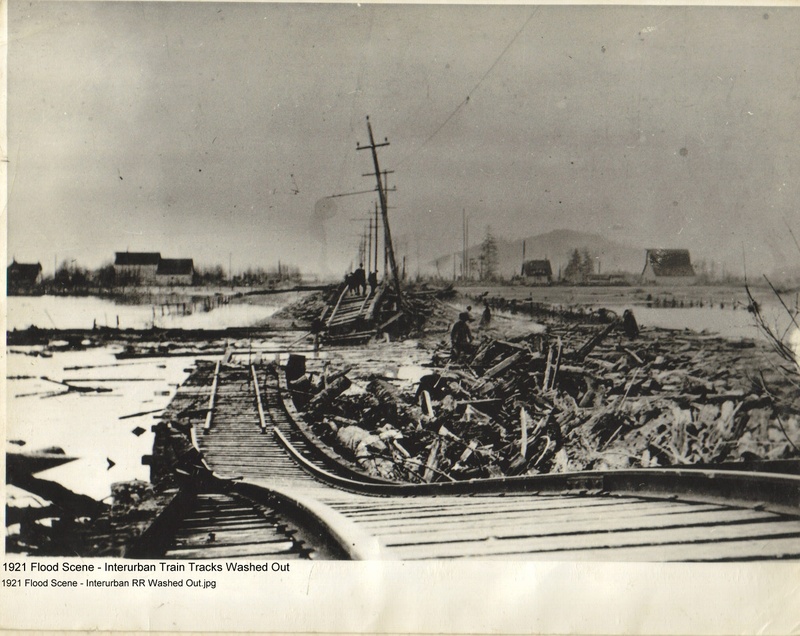 11x17" of Burlington looking north Dike District 12 hard at work 3 Bridge Corridor & Vicinity. 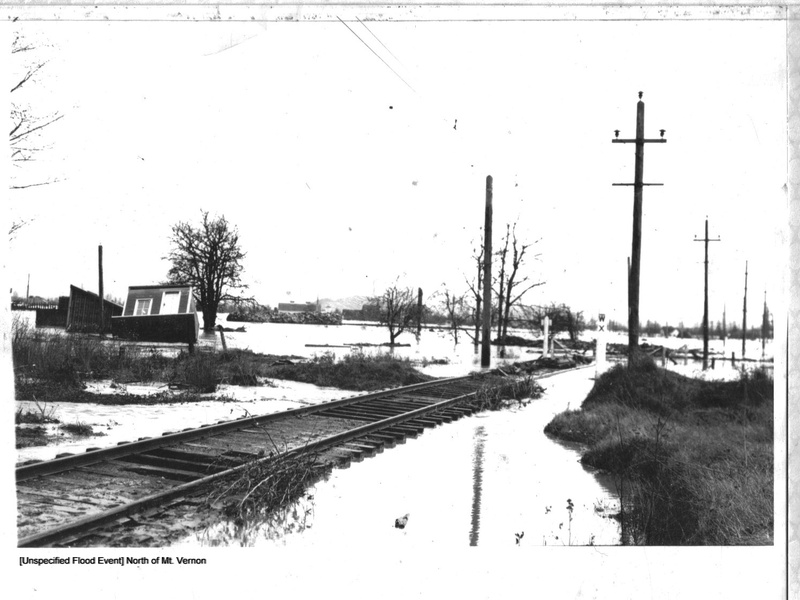 Looking west towards Avon & points beyond. 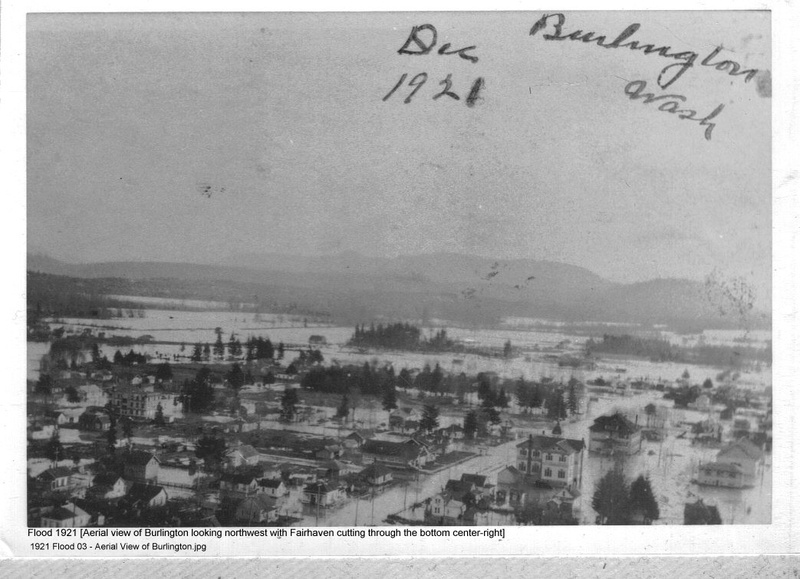 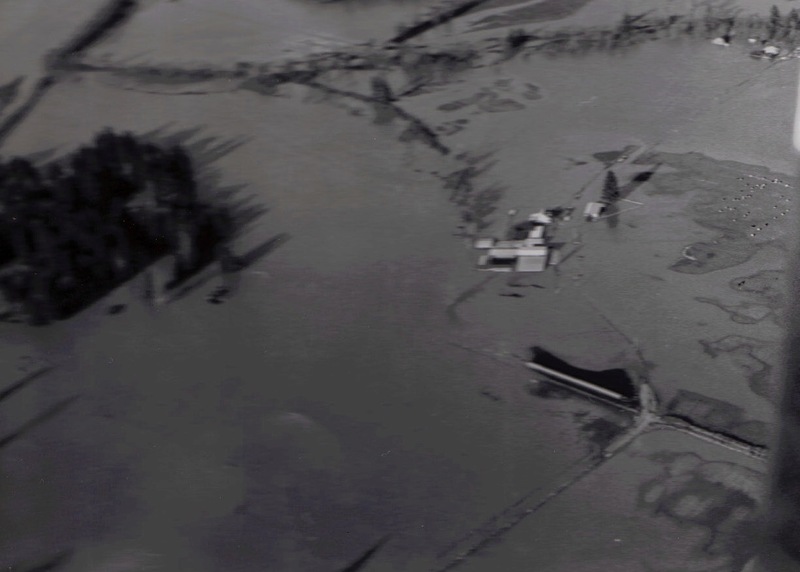 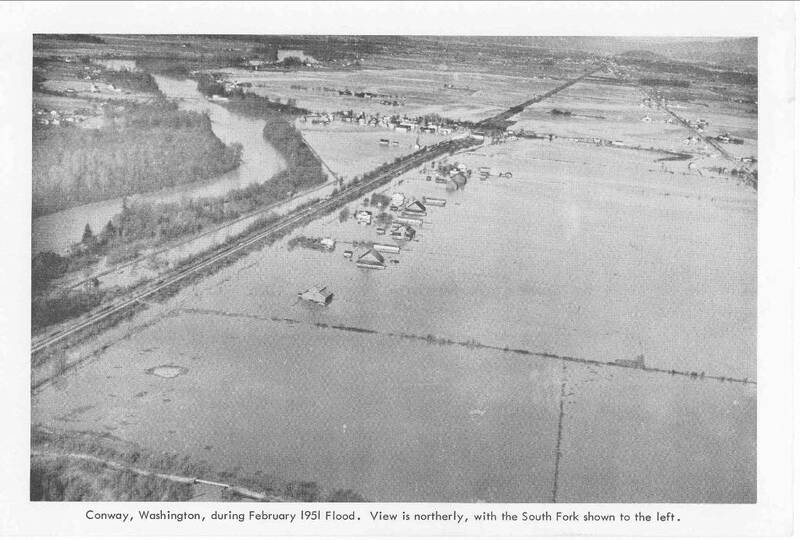 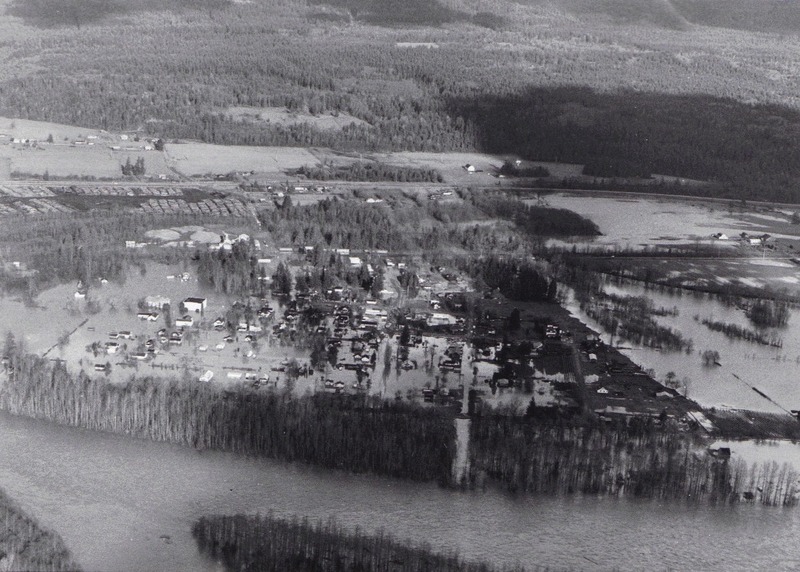 Skagit County Government iMap Aerial Photograph of the Dalles, 1937 Skagit County Government iMap Aerial Photograph of the Dalles, 2001 February 1951 flood photo of Conway, South Fork of Skagit to the left. 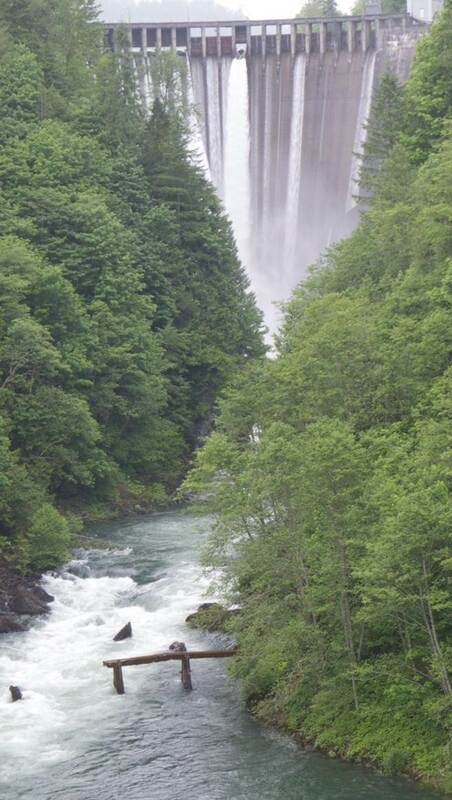 Courtesy of Granddaughter Mary Alice Basye. 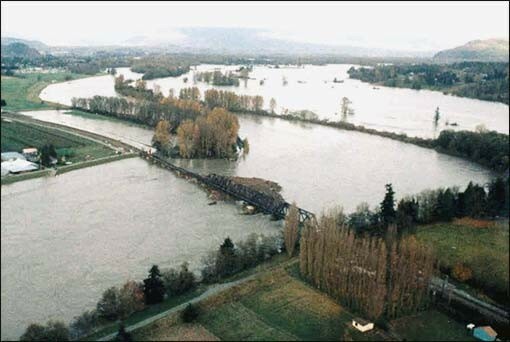 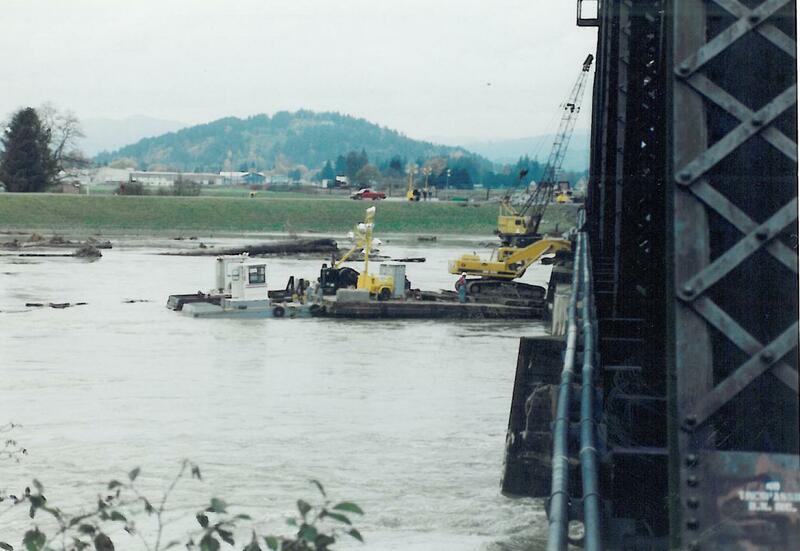 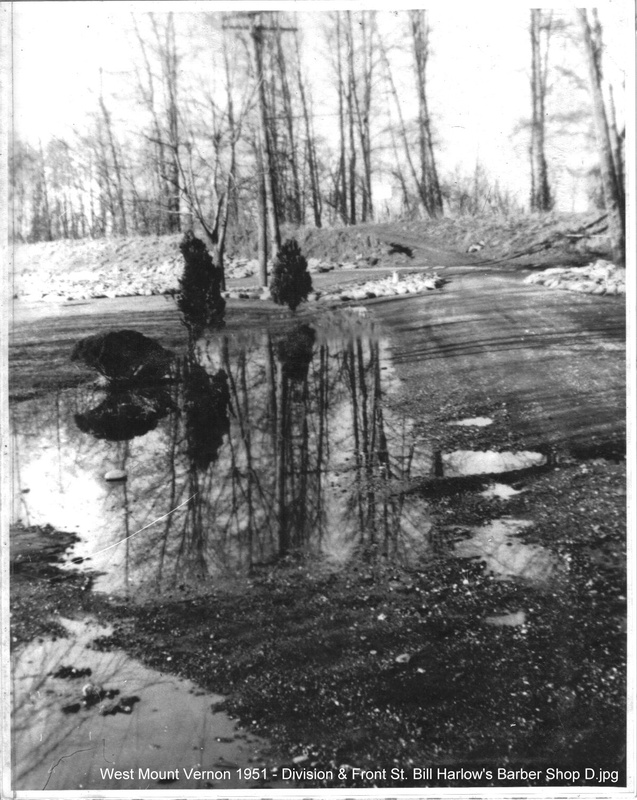 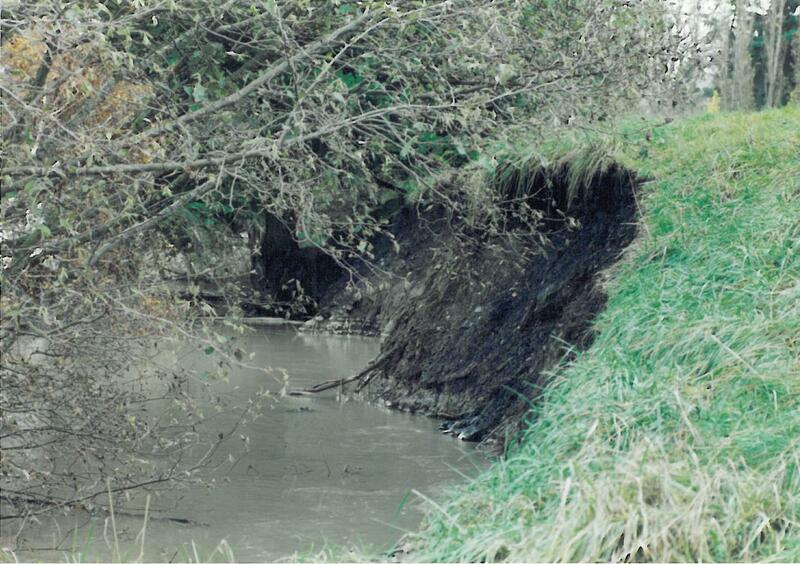 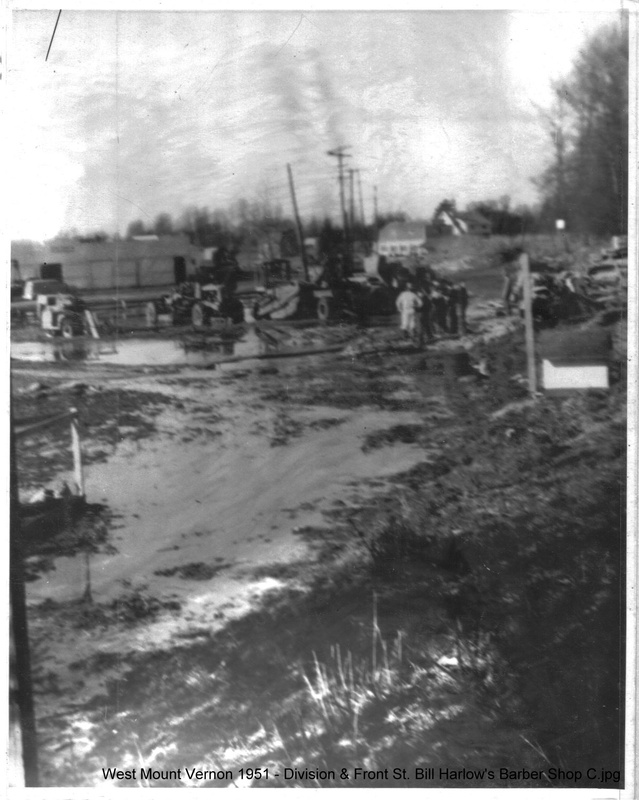 Snohomish River 1995 levee break at Marshland - no overtopping levee. 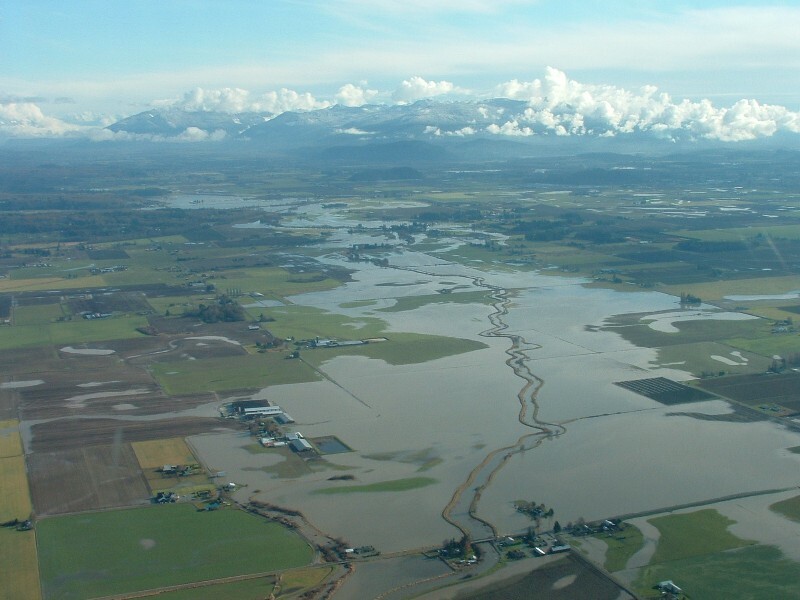 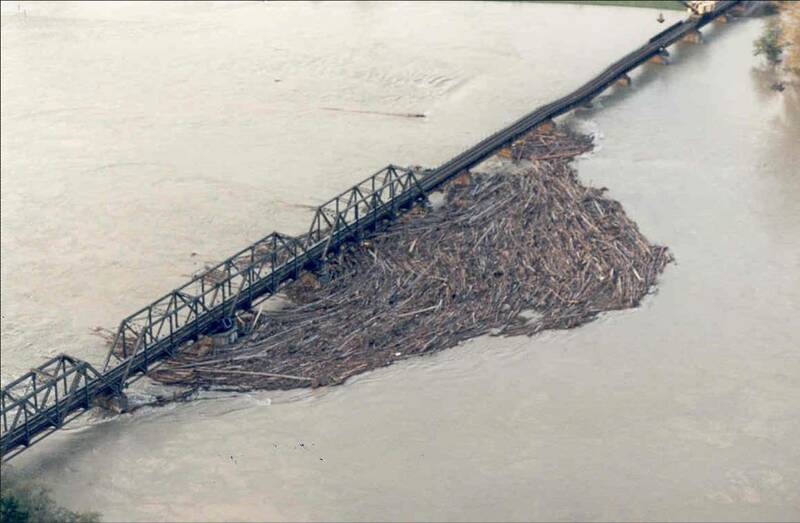 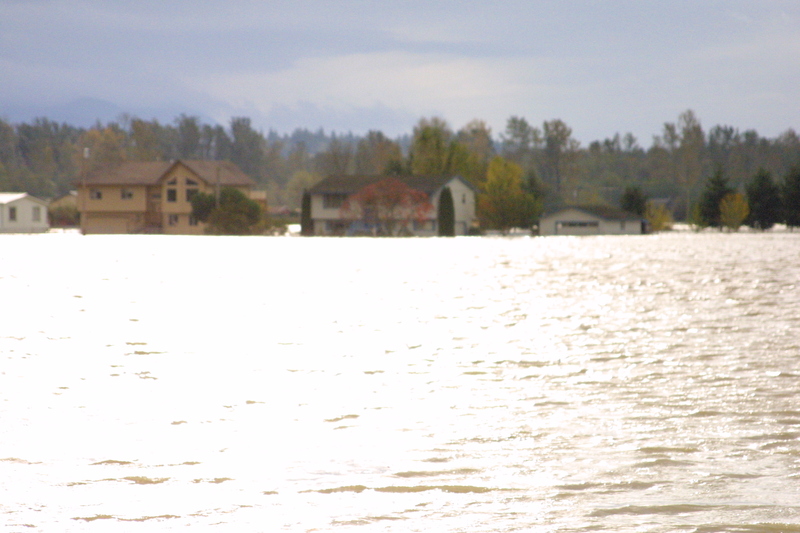 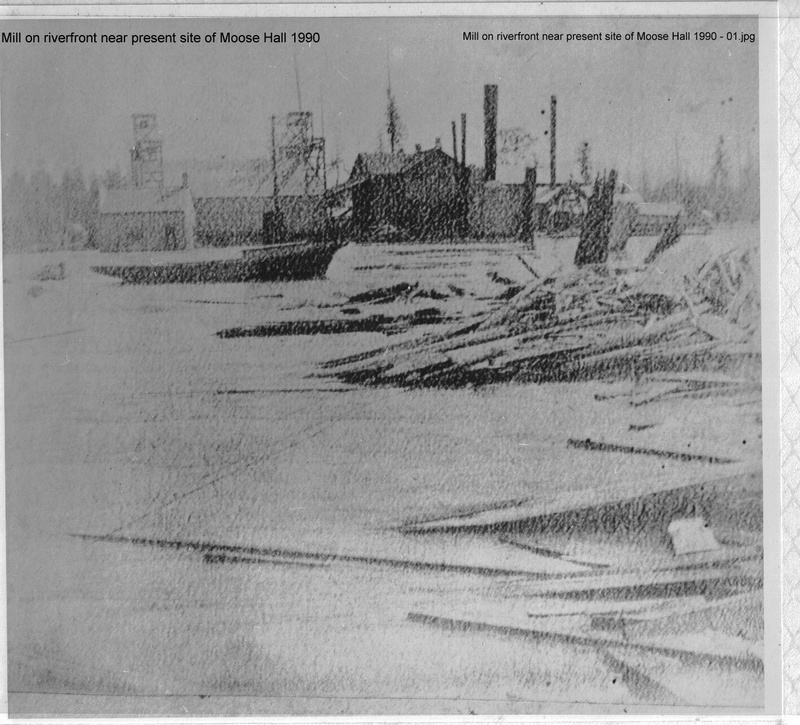 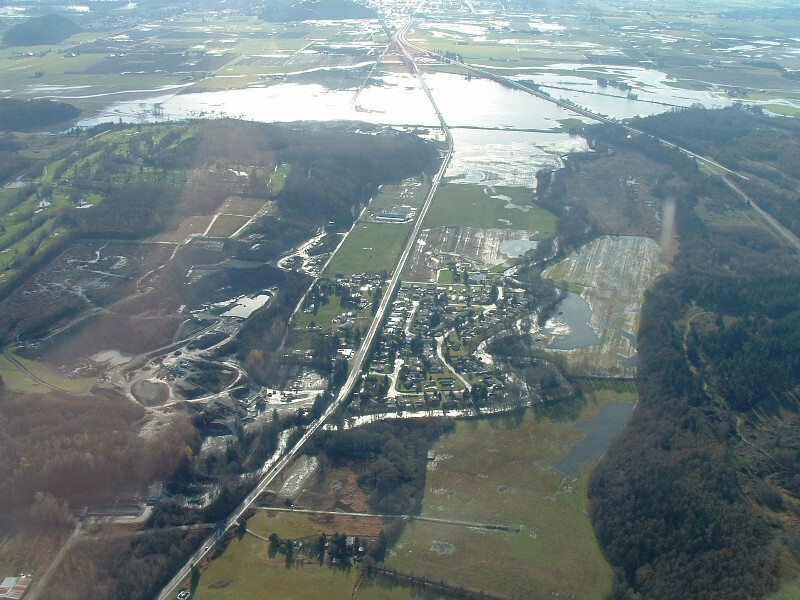 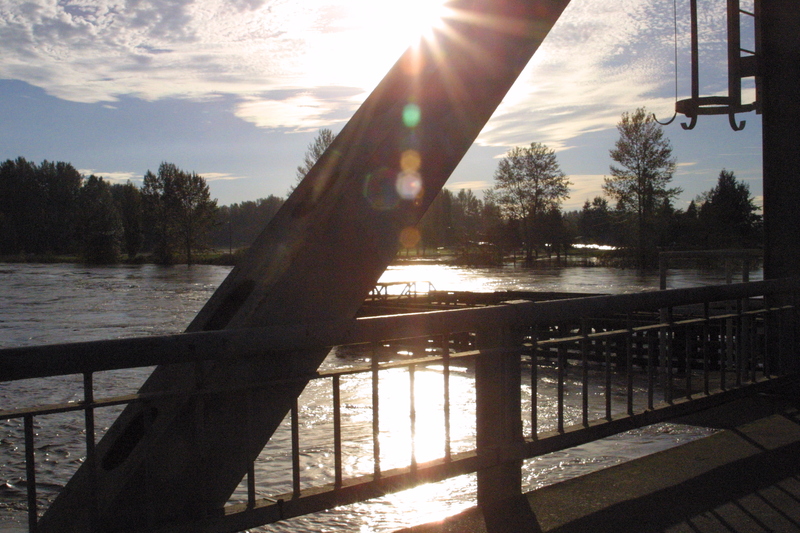 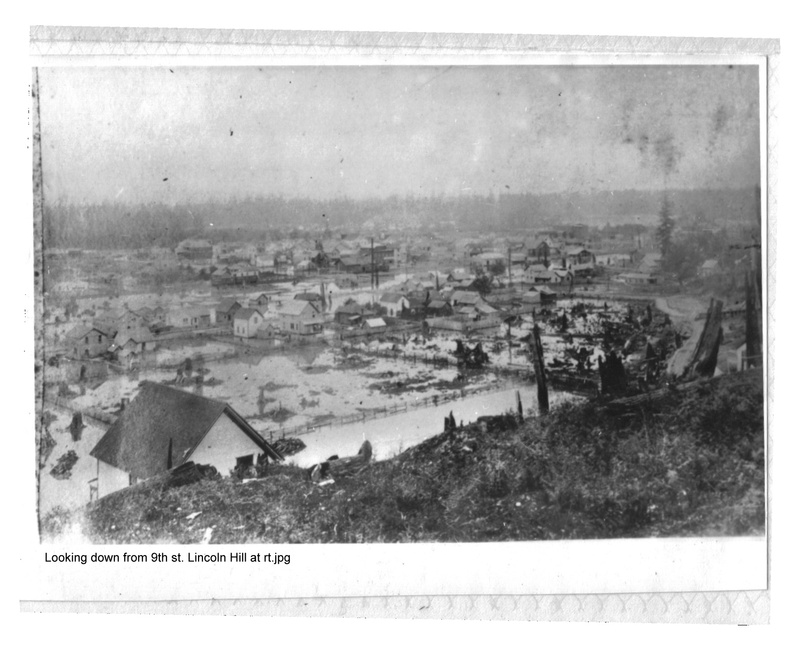 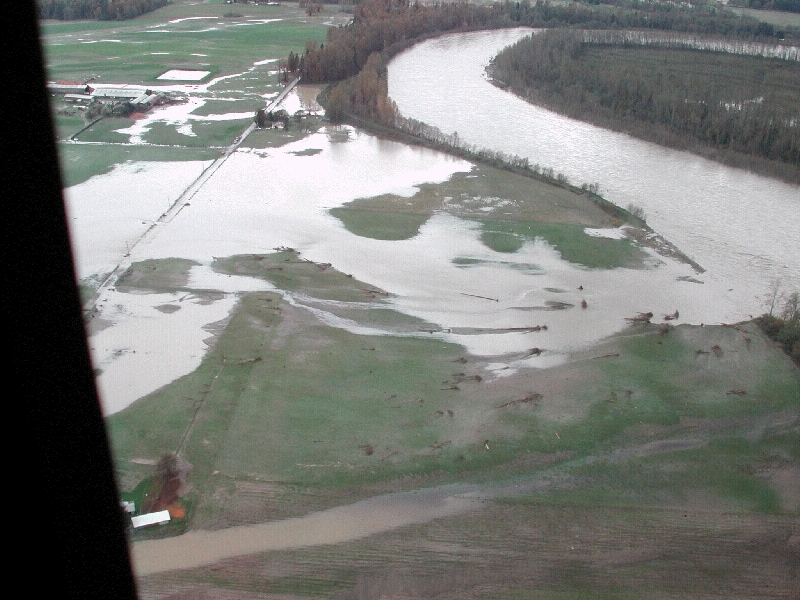 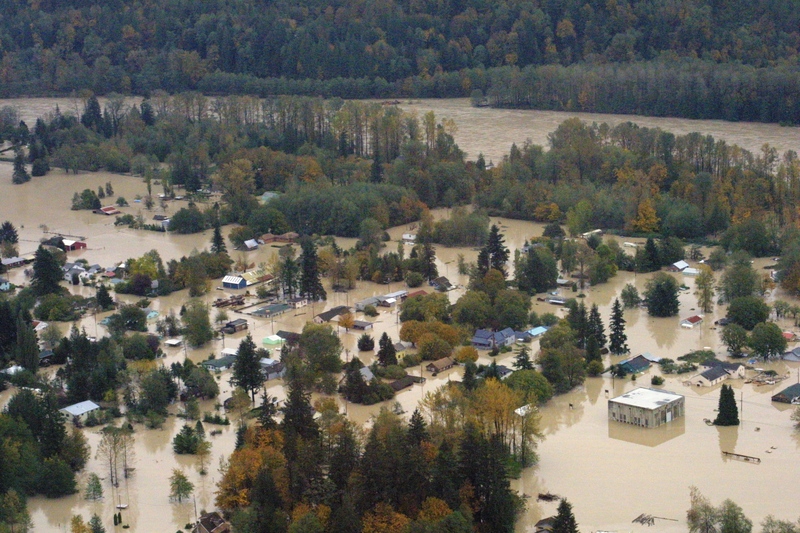 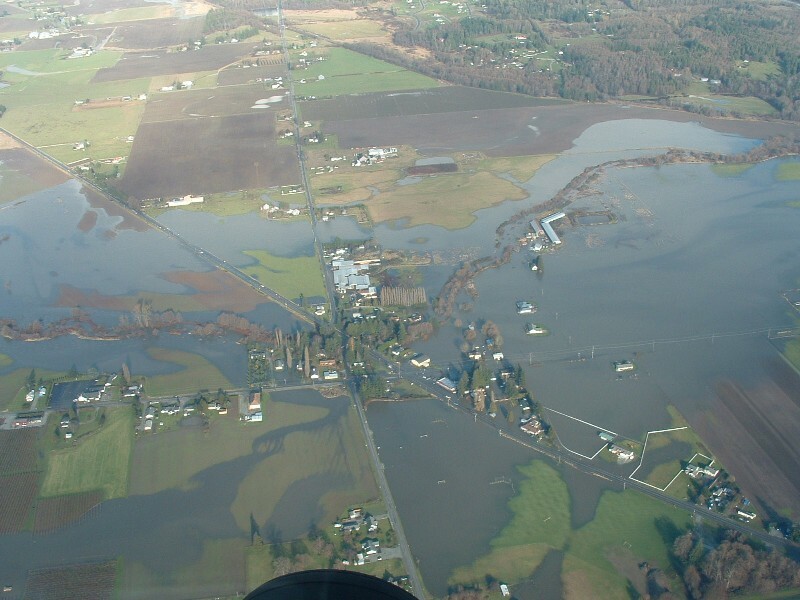 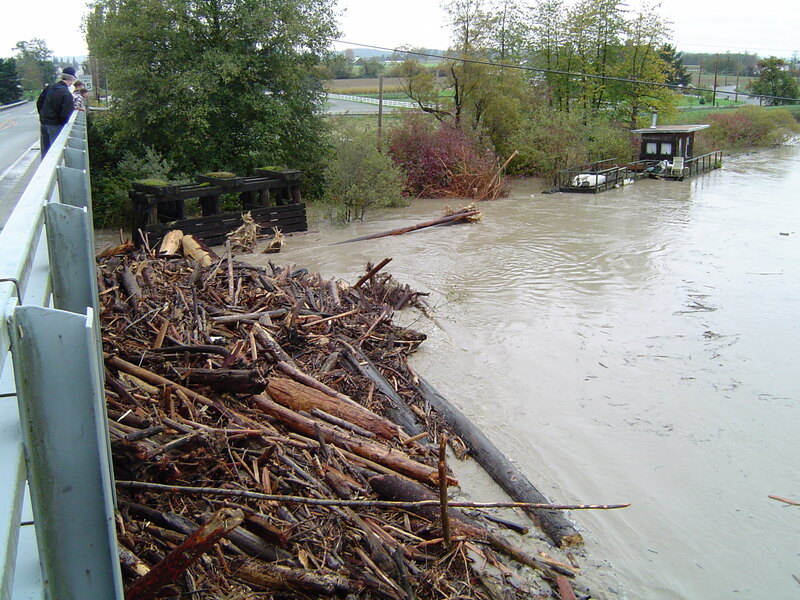 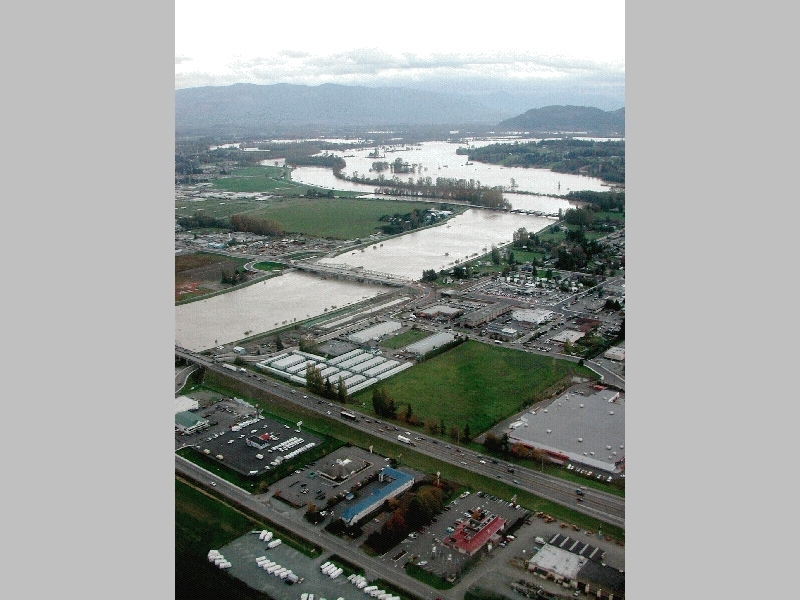 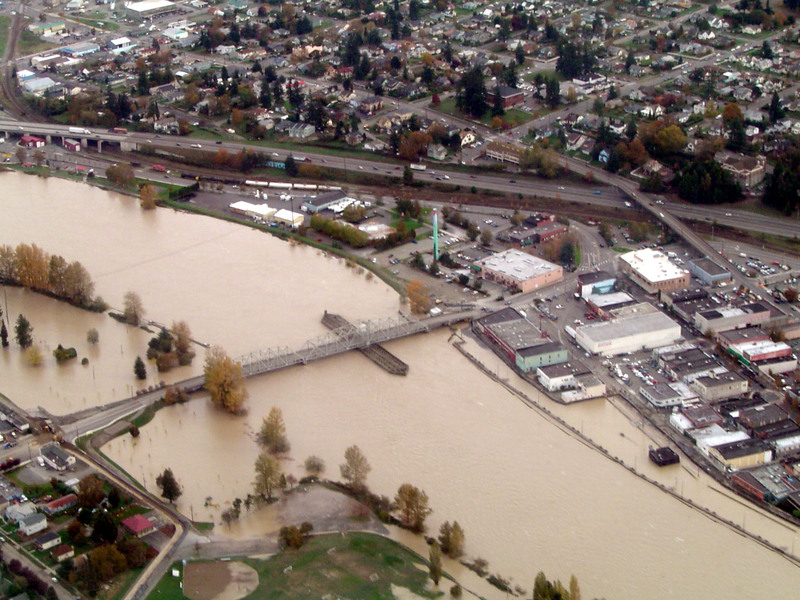 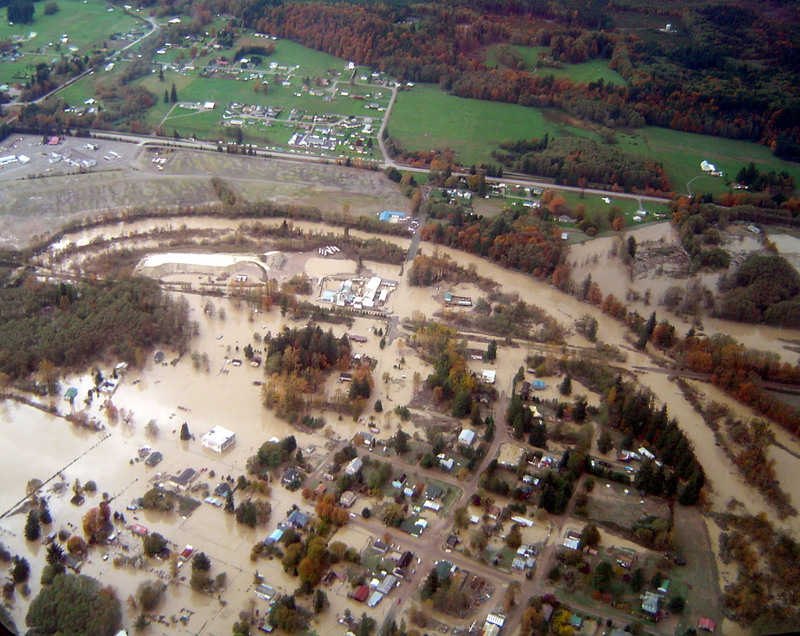 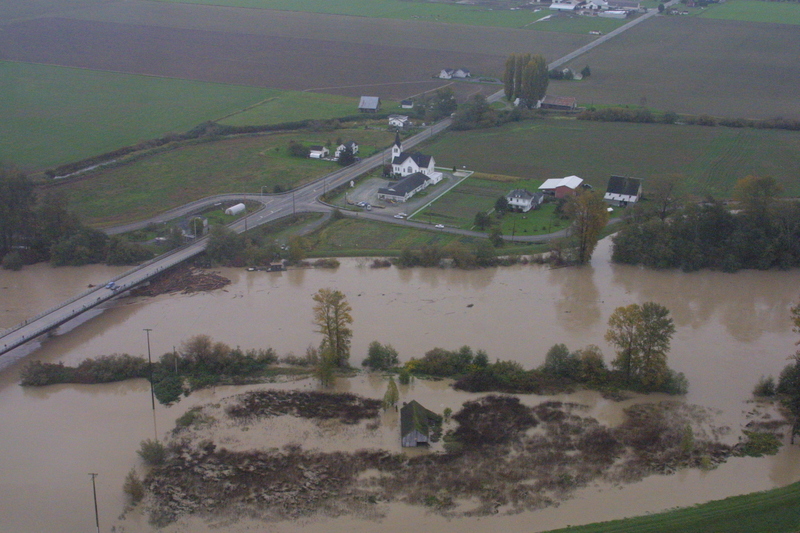 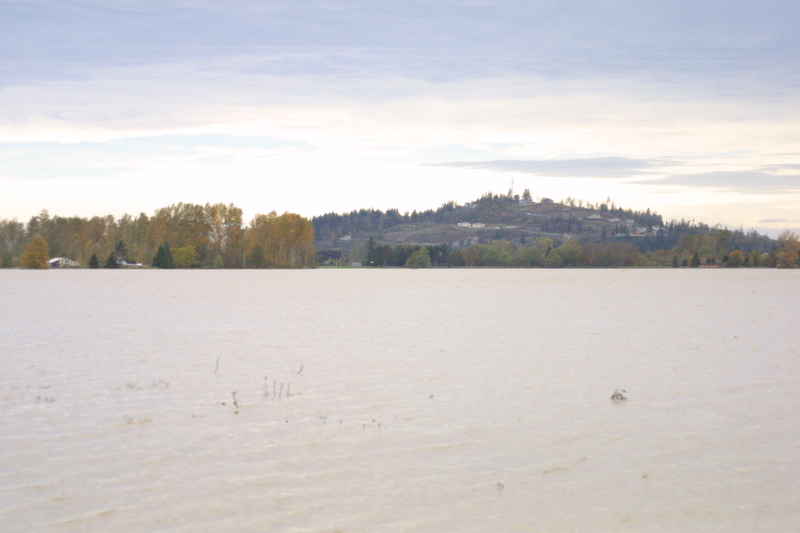 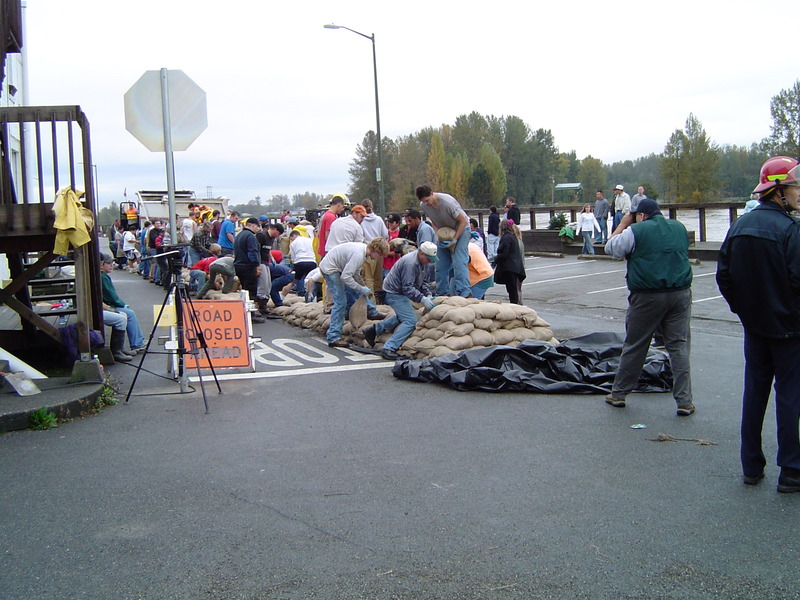 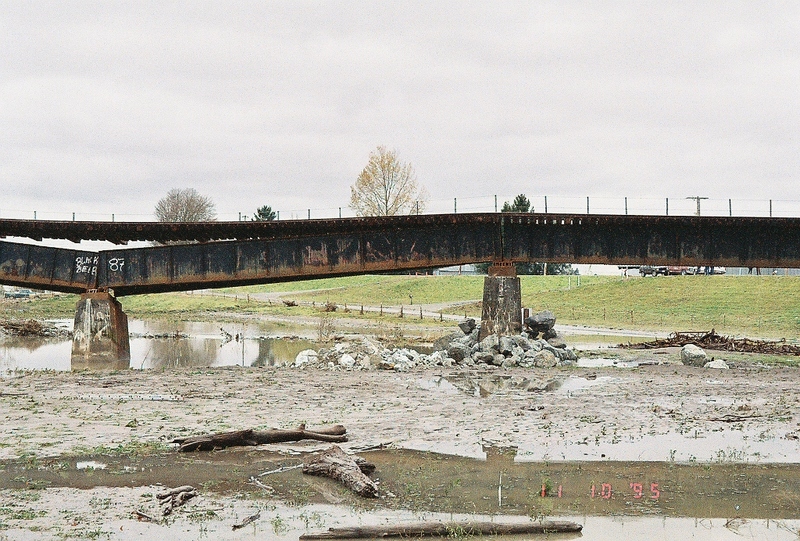 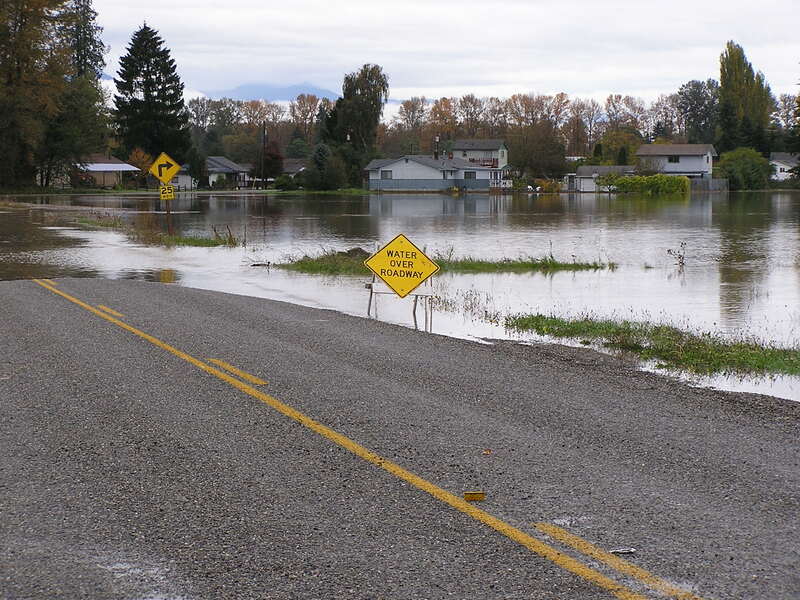 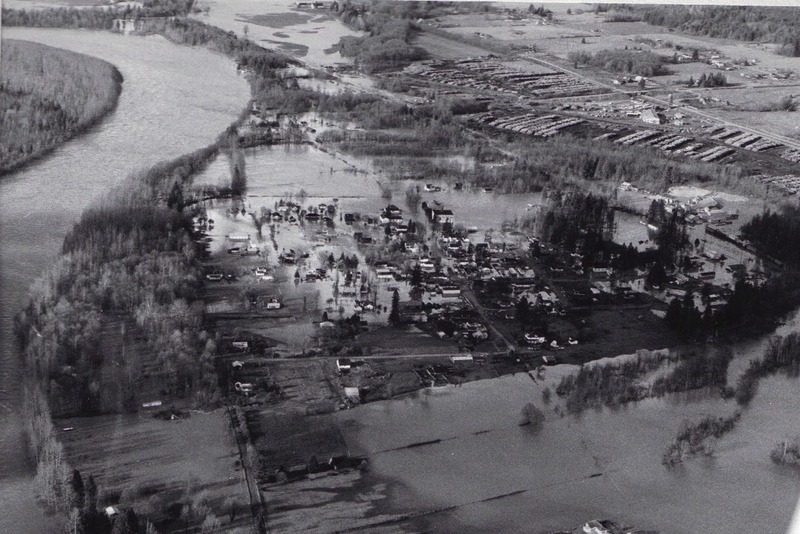 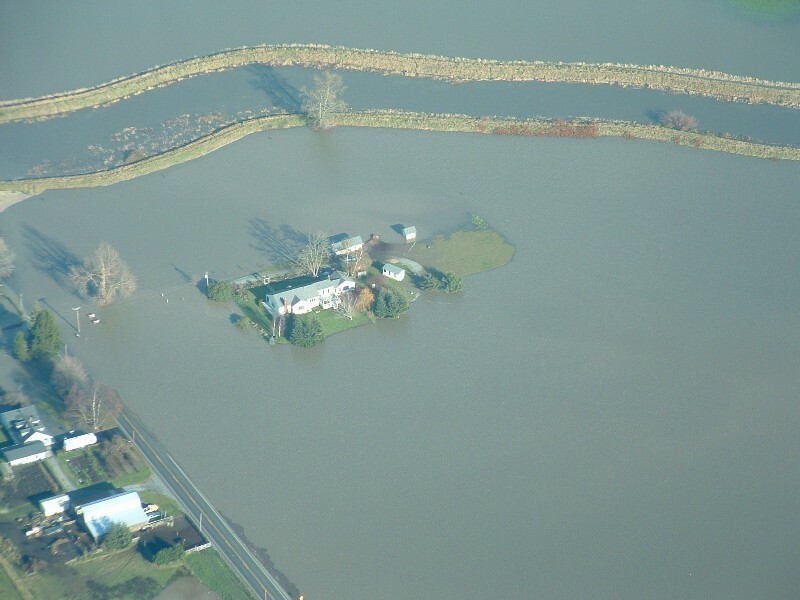 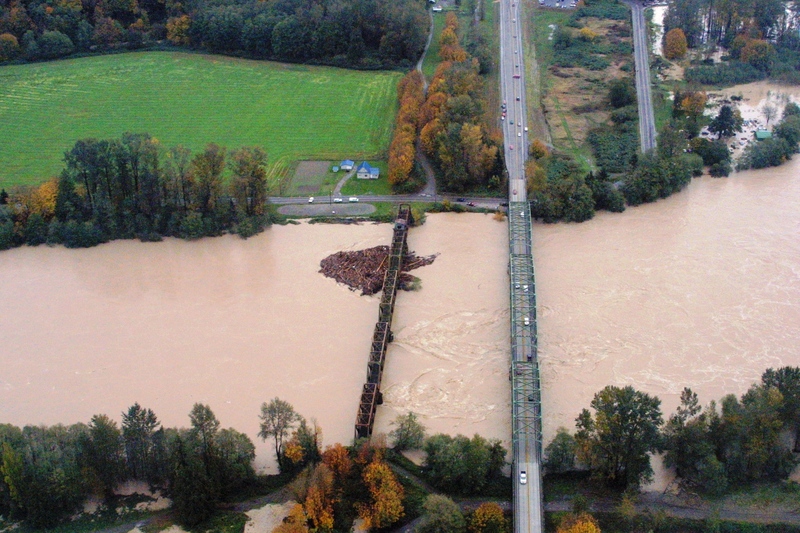 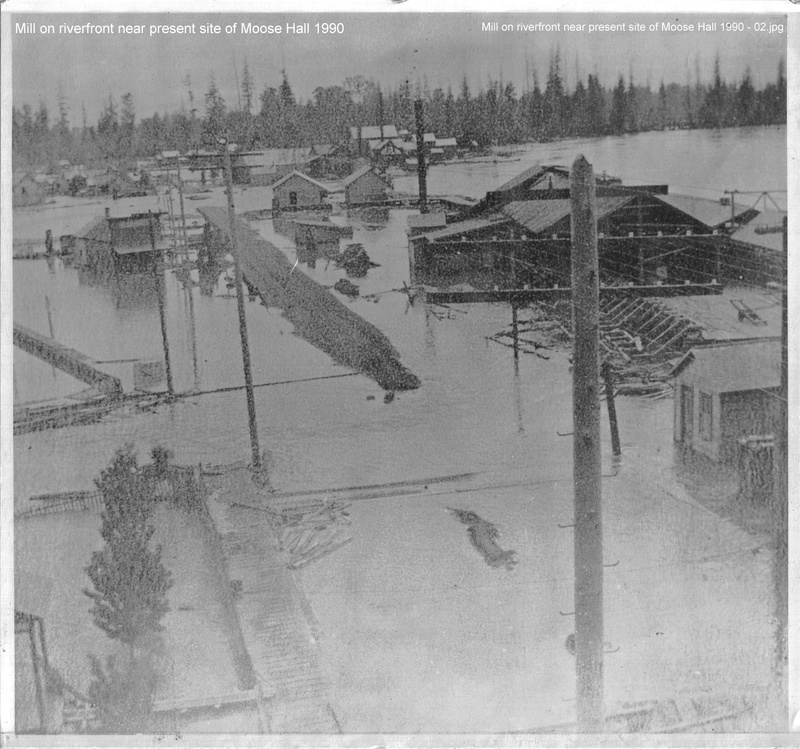 Snohomish River 2006 flood at Marshland- according to The Everett Herald, overtopping levees did not fail. 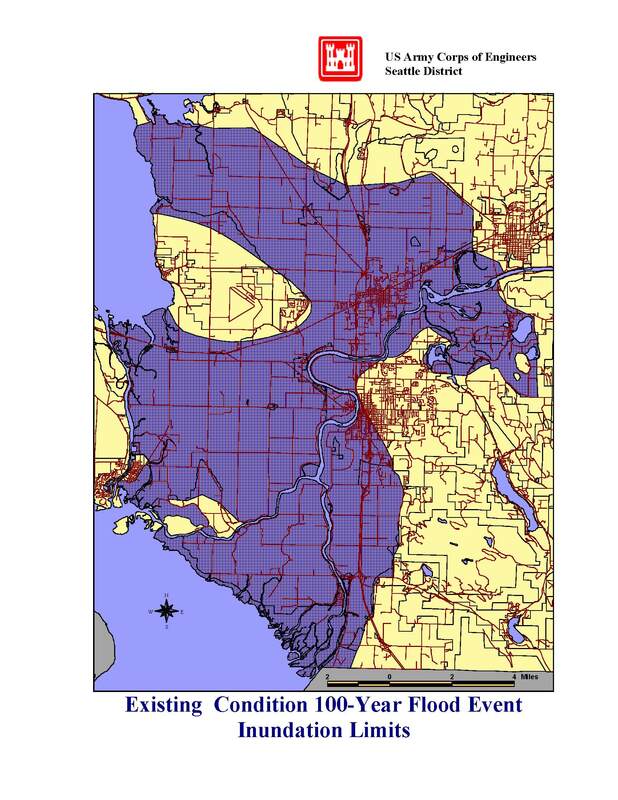 USGS Hydrograph showing that overtopping levees can serve as a cap on river elevations as was the case in 2006 on the Snohomish River. 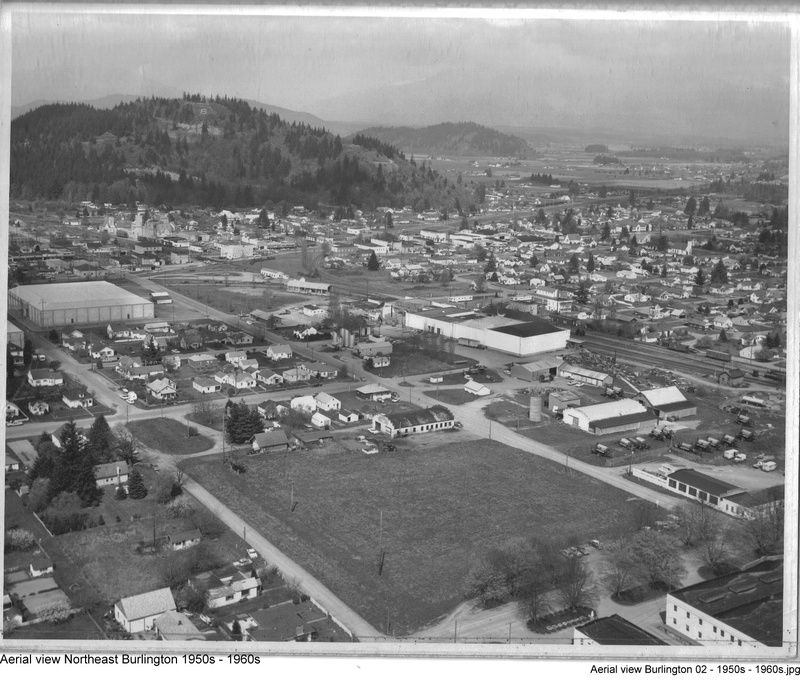 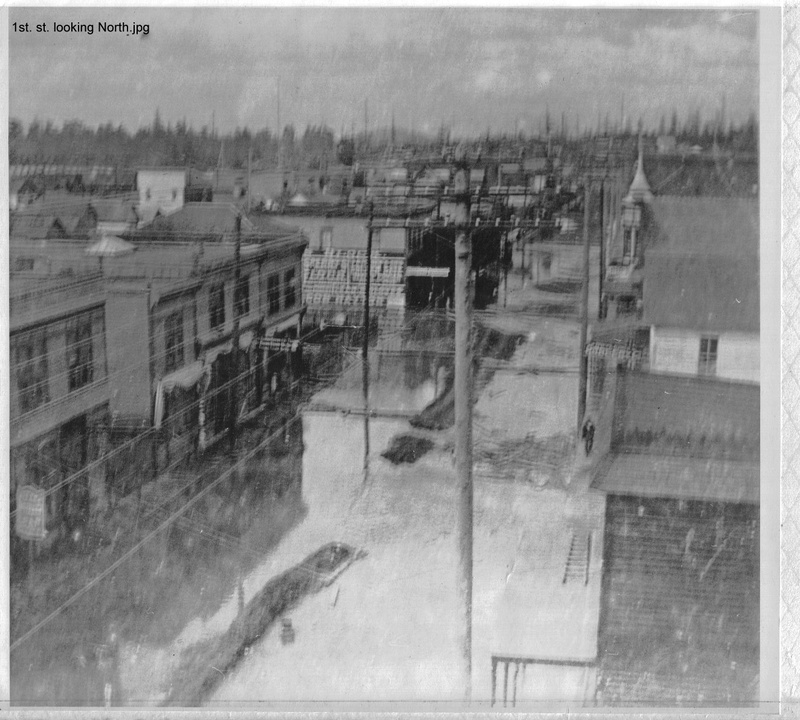 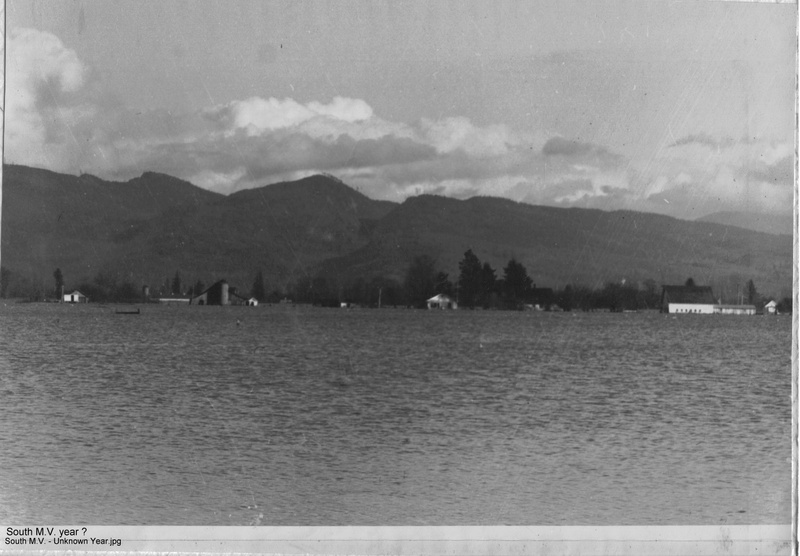 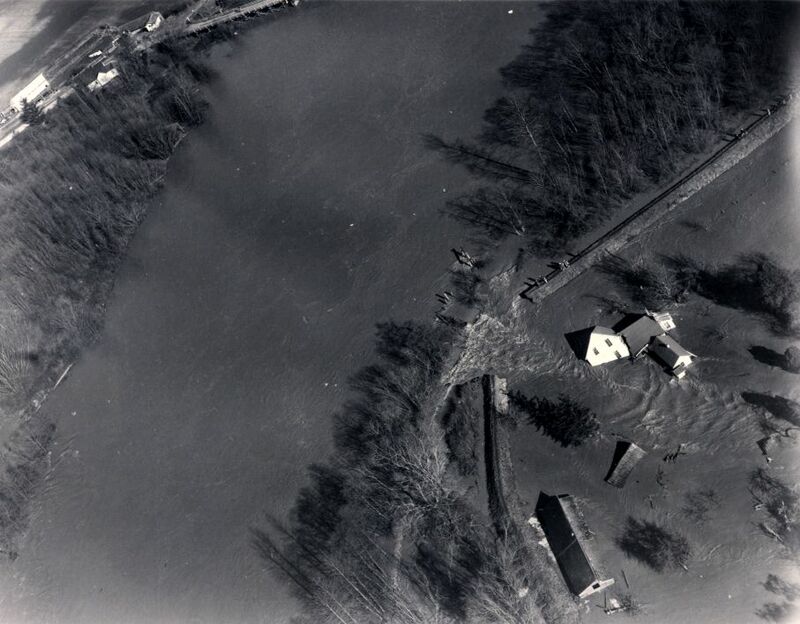 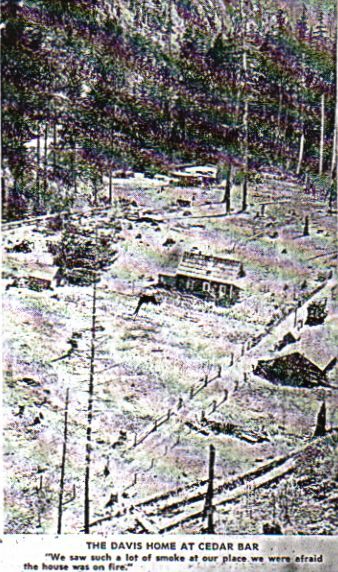 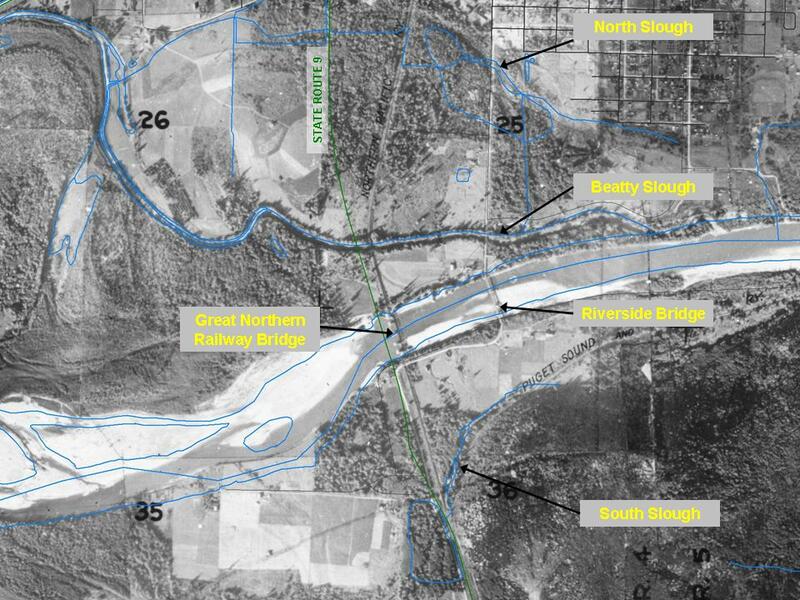 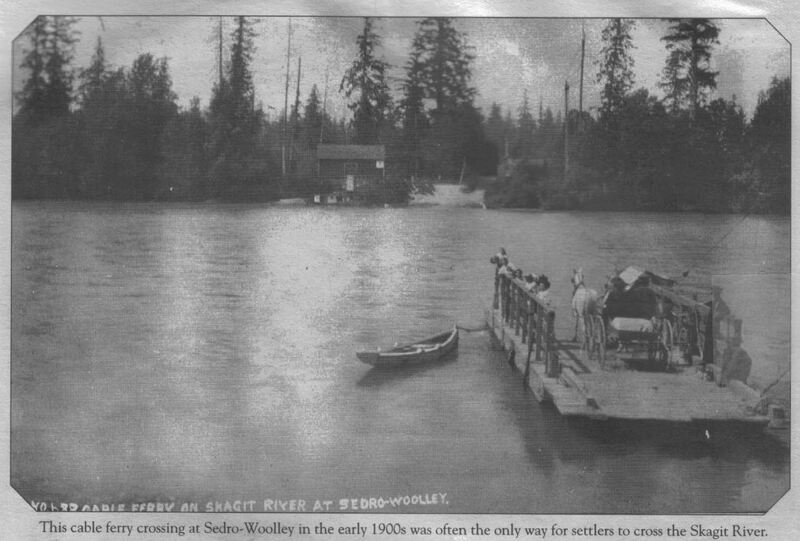 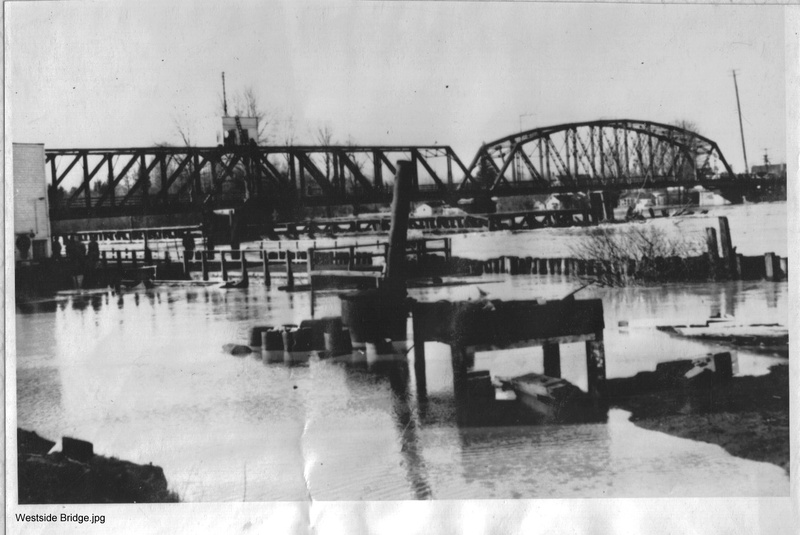 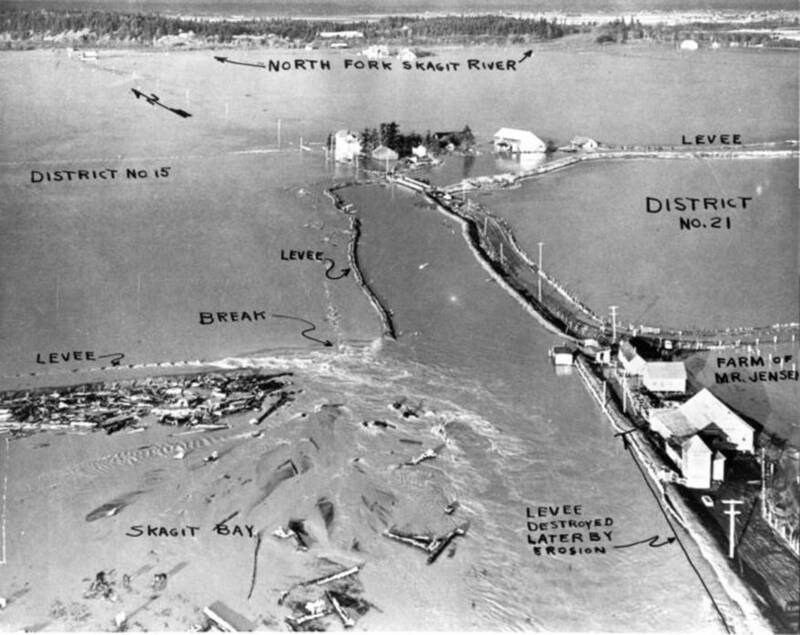 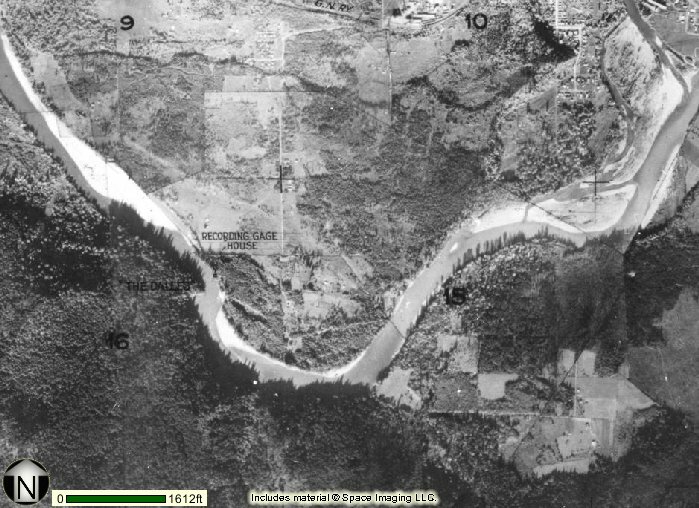 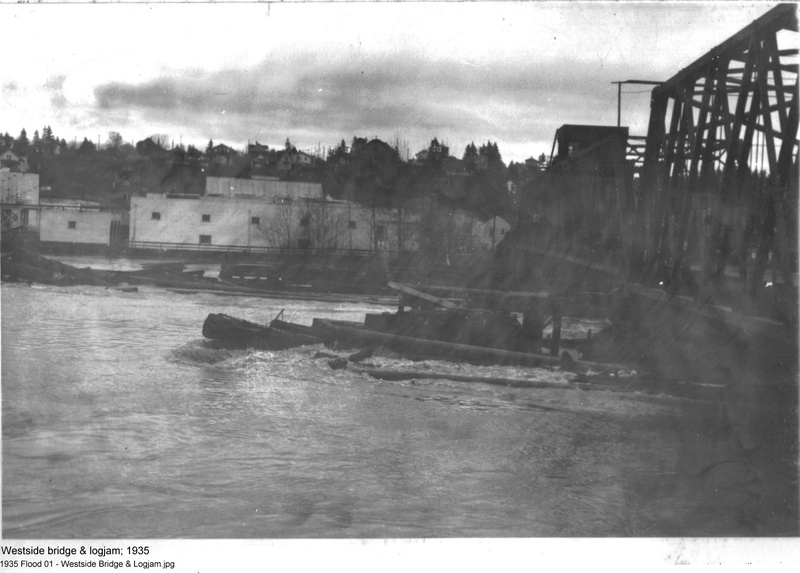 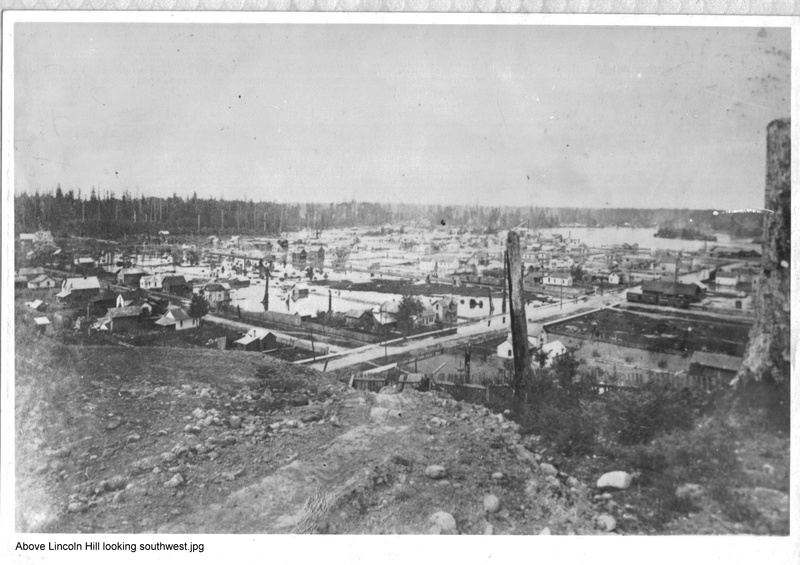 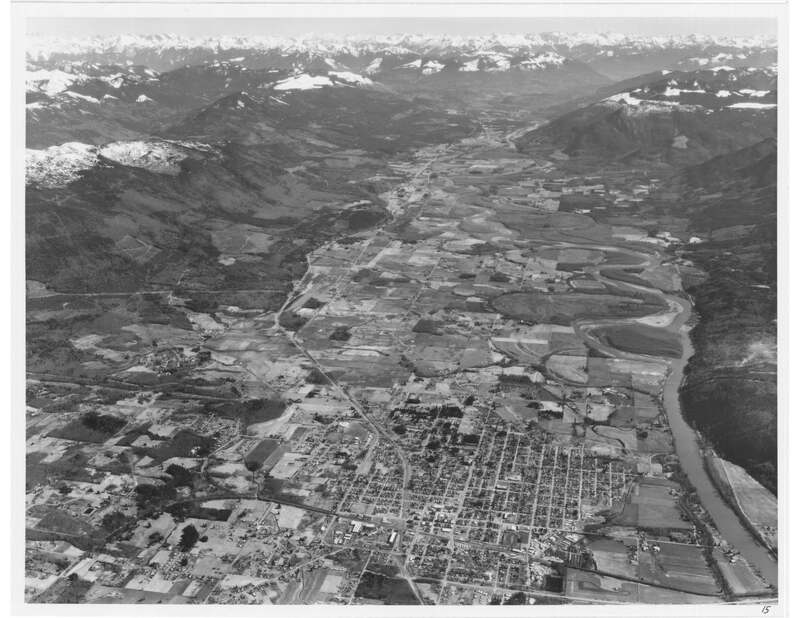 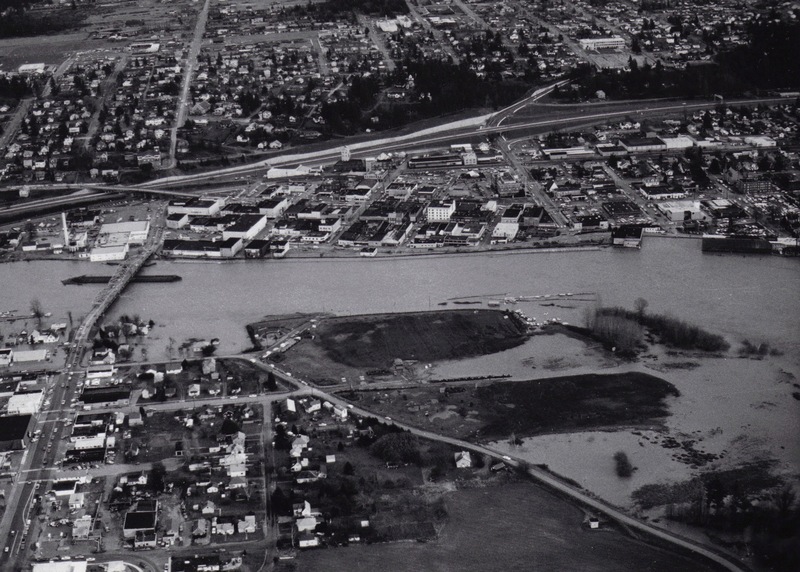 1932 aerial photo depicting old location of Sedro-Woolley bridge upstream of Great Northern Railroad Bridge. 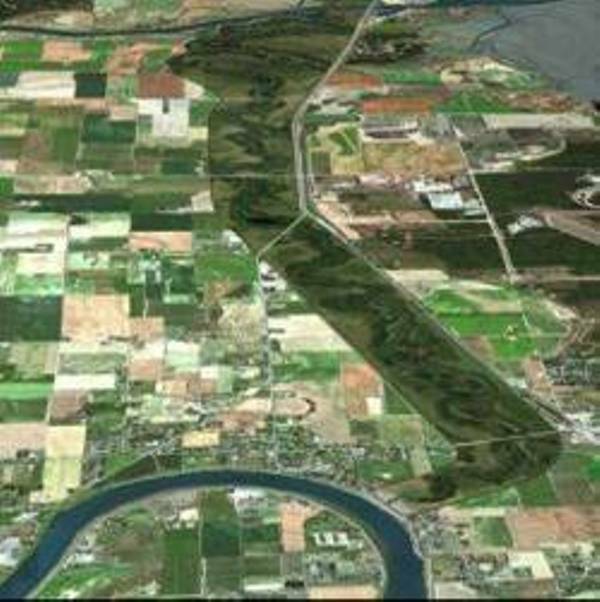 Also shows location of old sloughs. 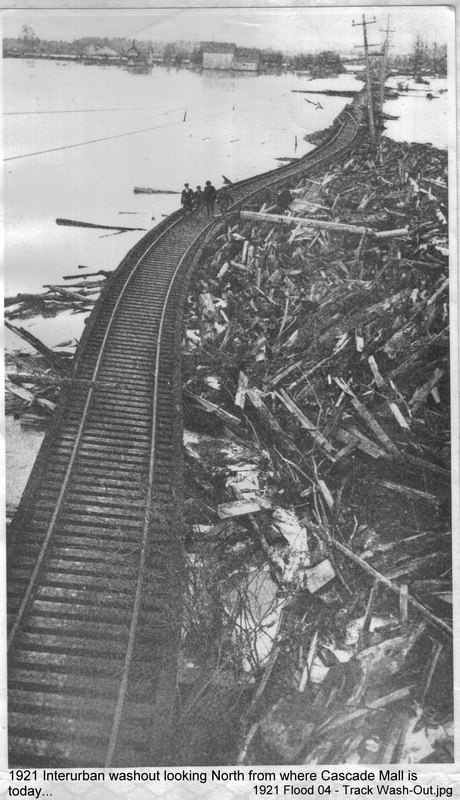 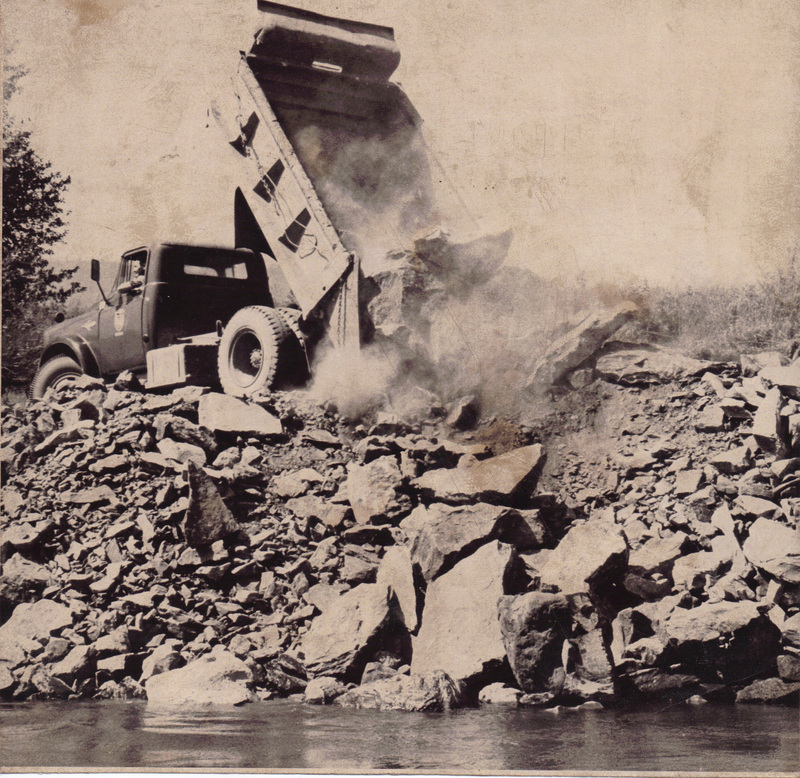 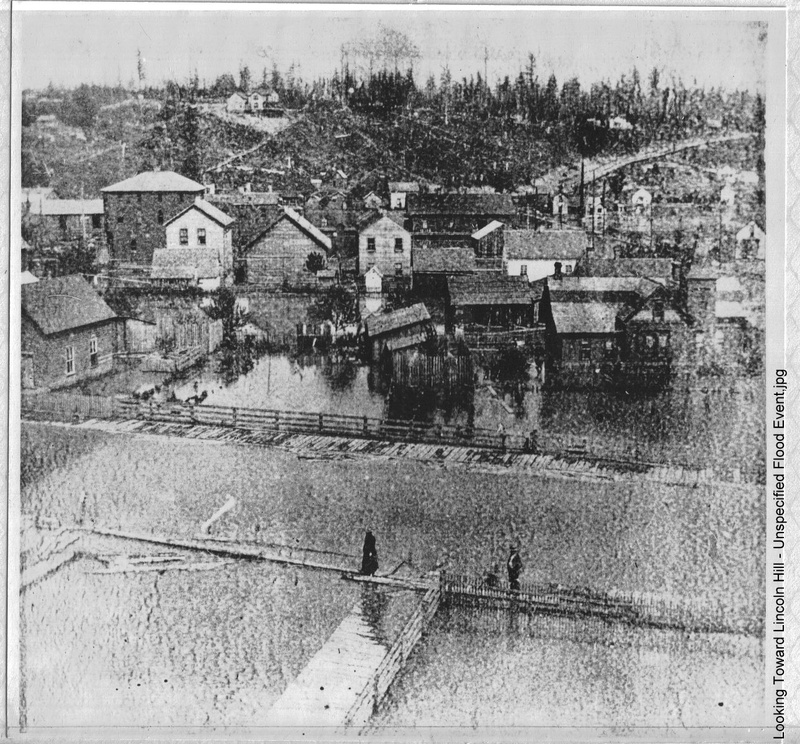 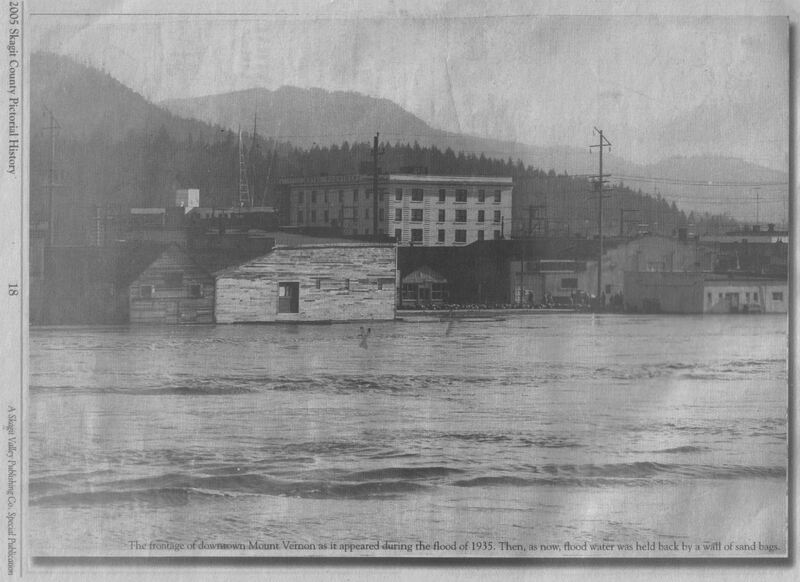 Sterling Dam, which failed in the 1909 and 1917 floods. 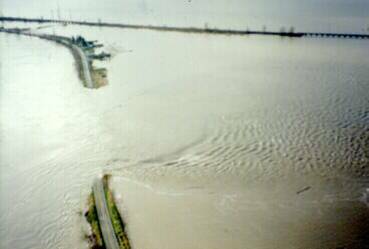 Constructed to keep floodwaters from filling up Gages Slough. 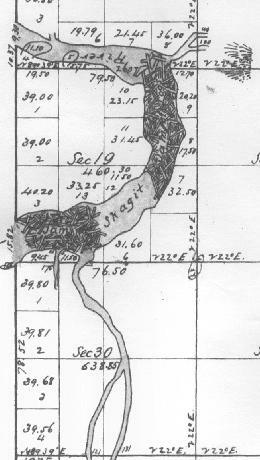 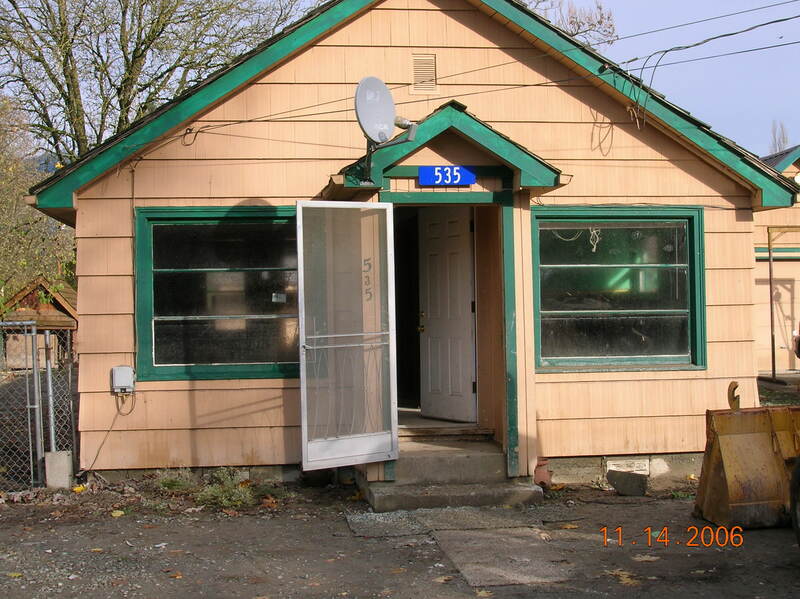 "Progress"
*NAVD 88 is a particular datum used in calculating elevations. 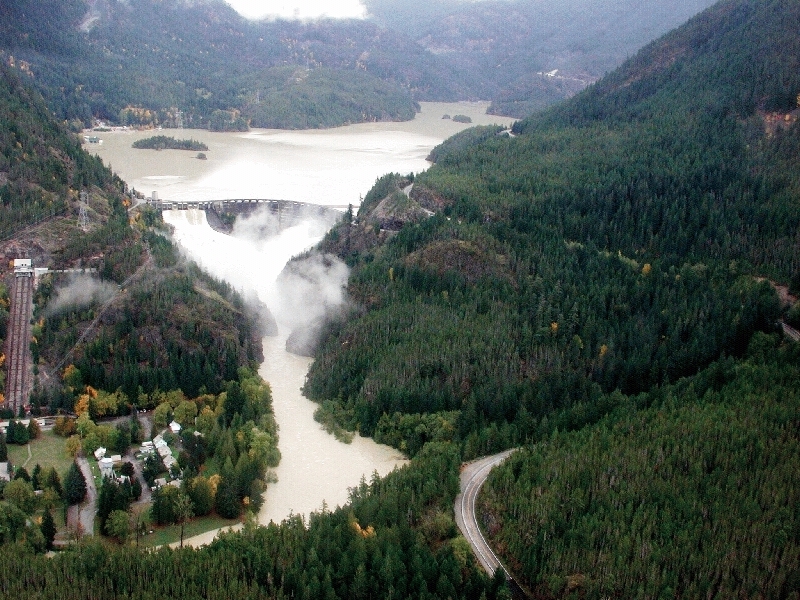 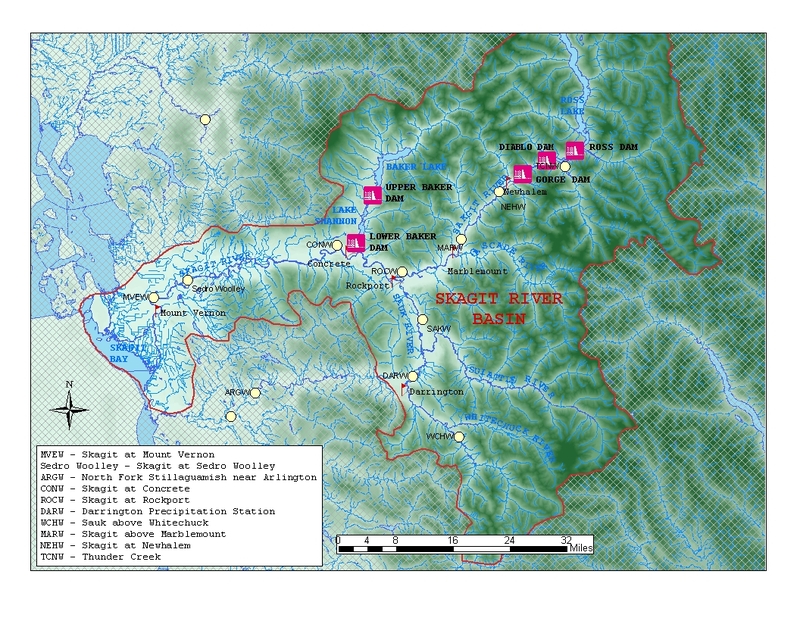 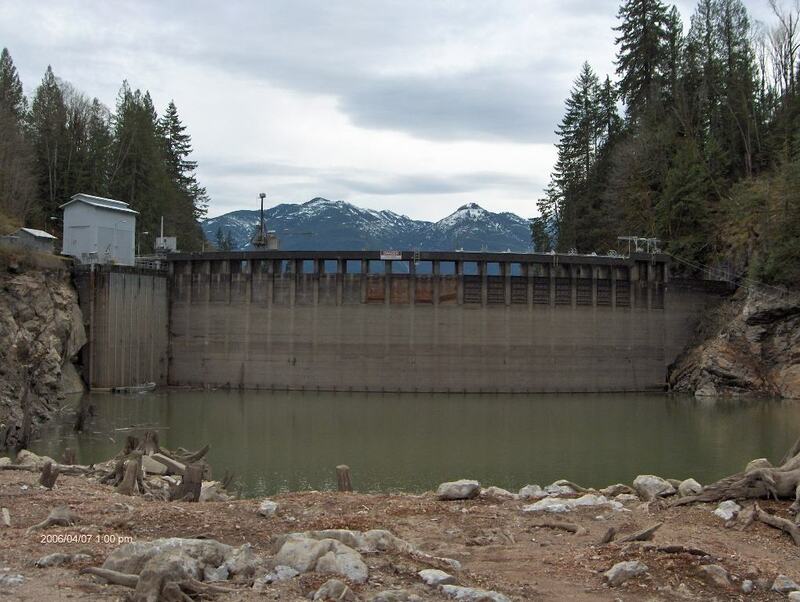 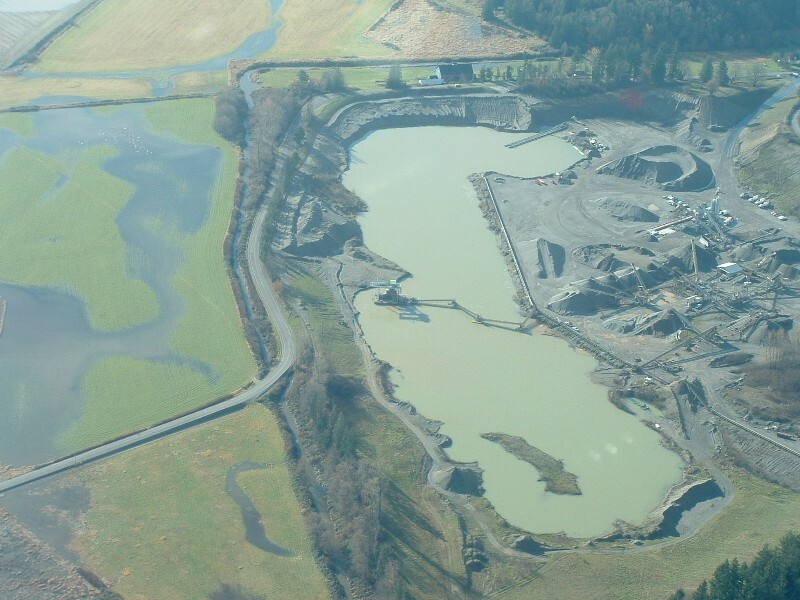 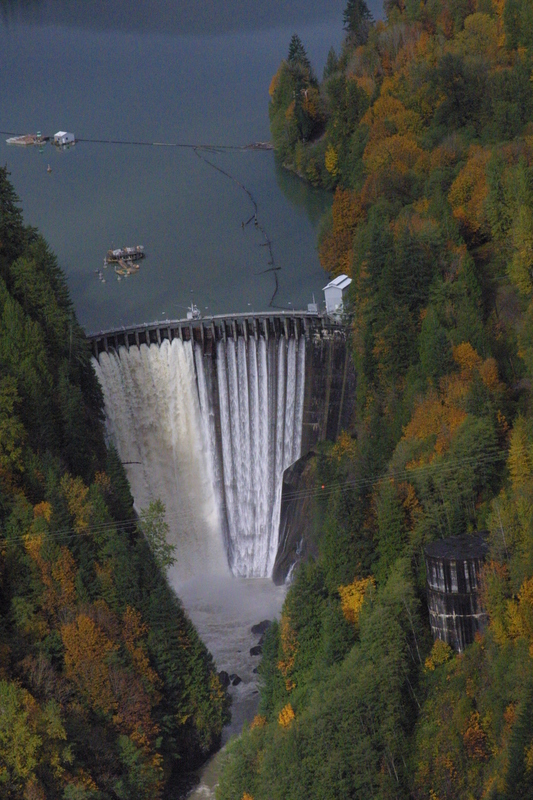 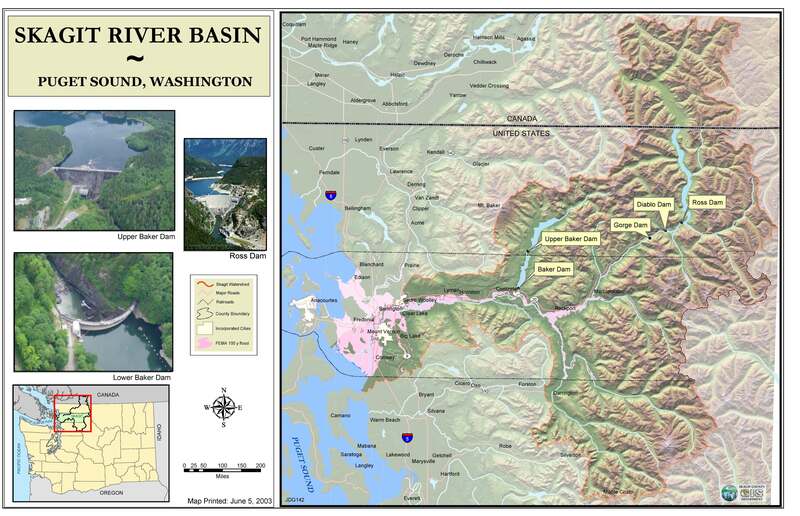 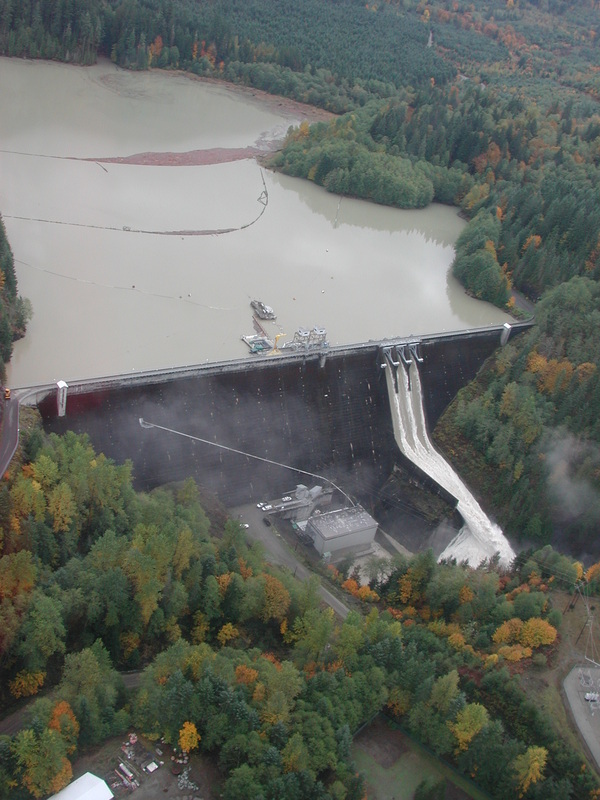 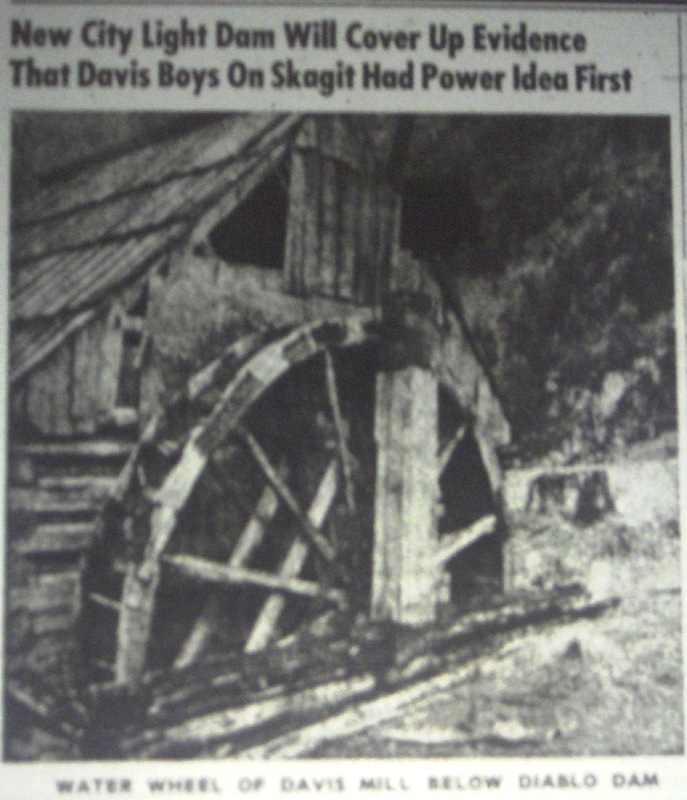 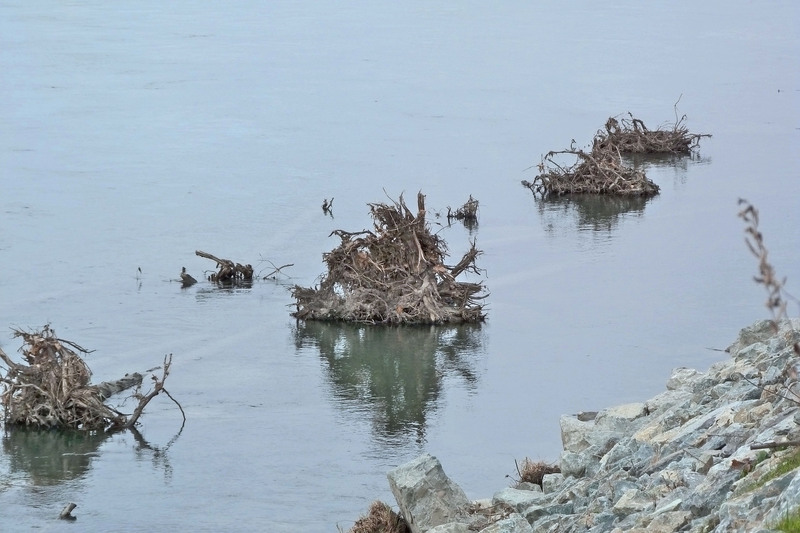 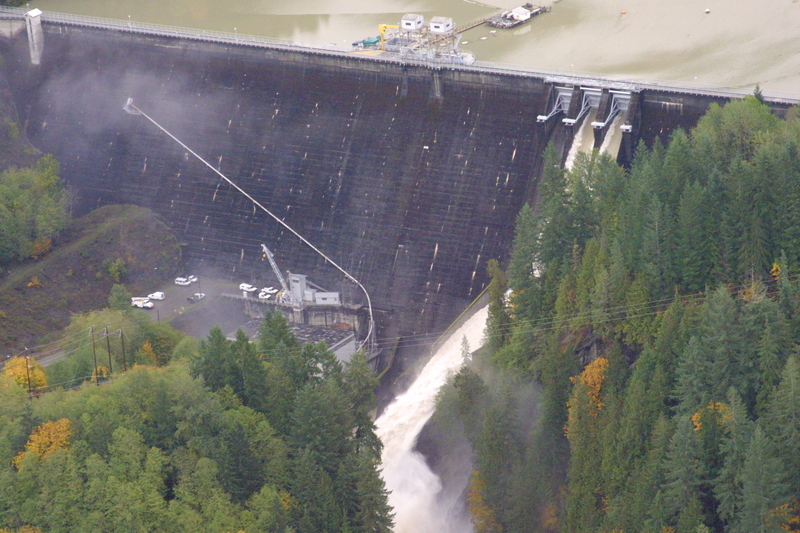 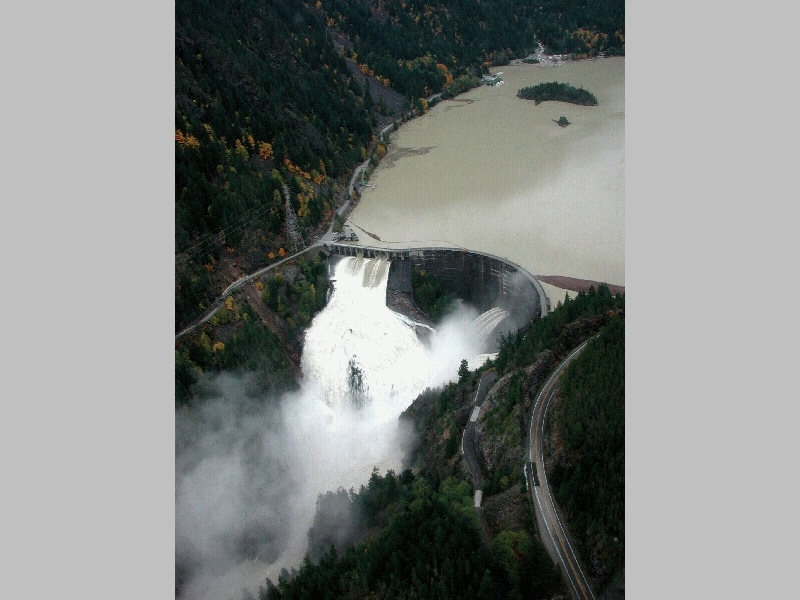 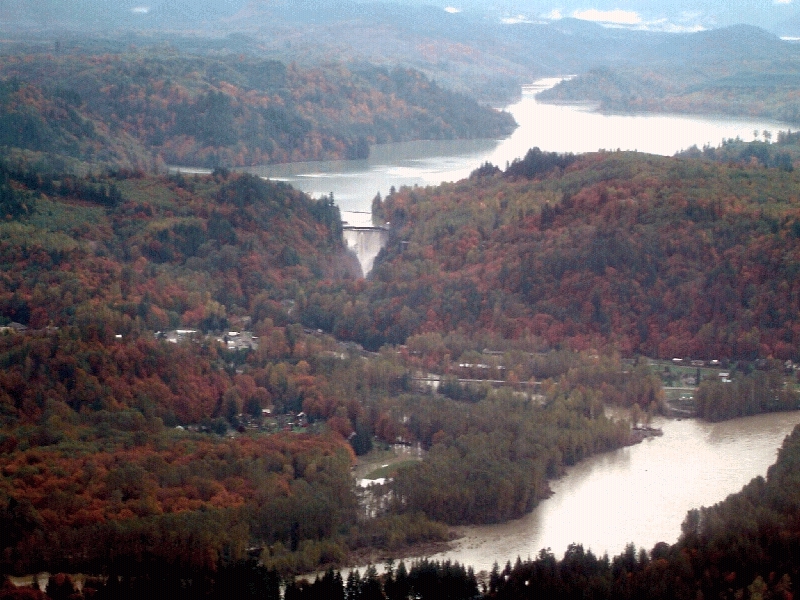 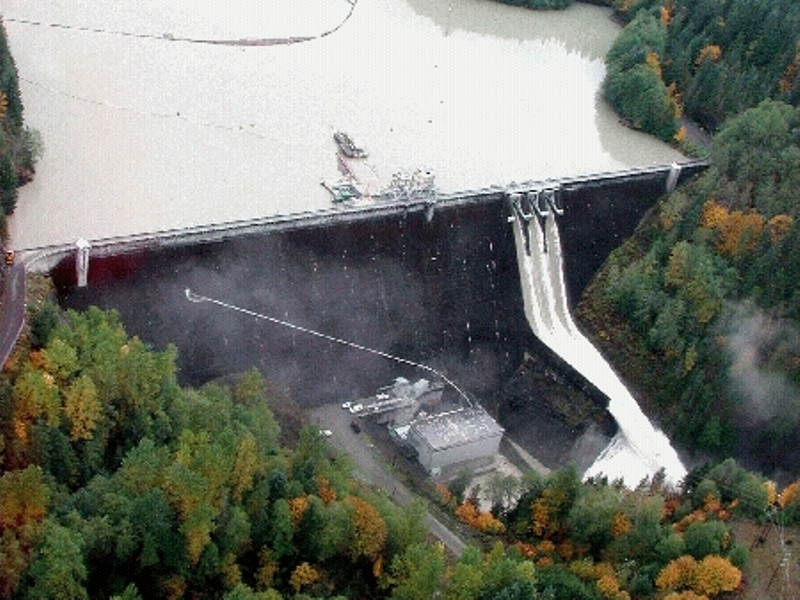 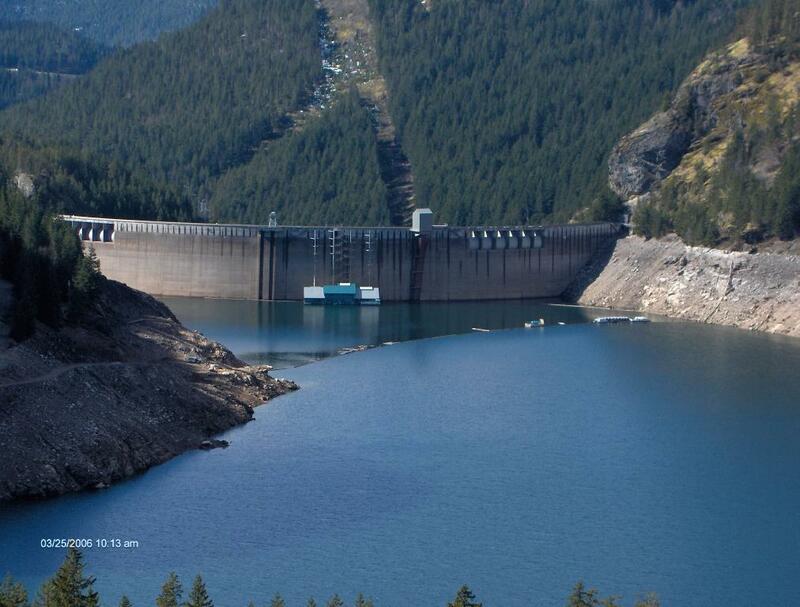 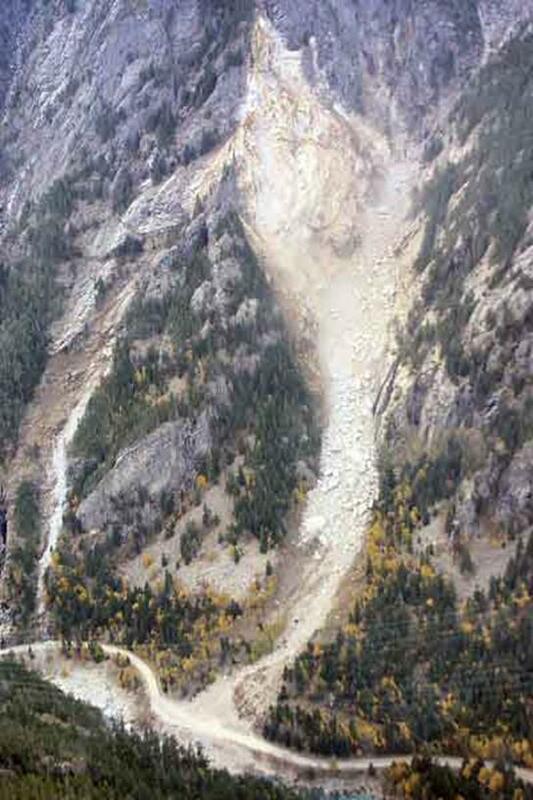 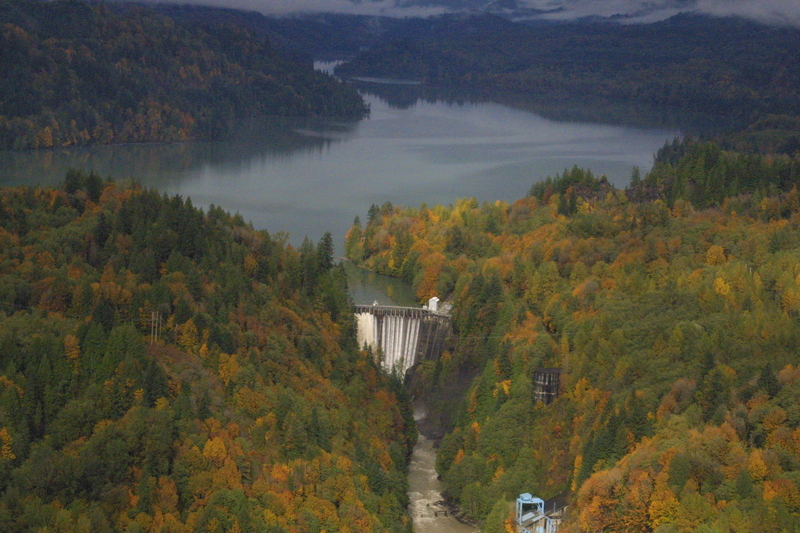 On October 1st, 2004 - the federal government and Puget Sound Energy (PSE) went to that datum for measuring elevations on the Baker River reservoirs. 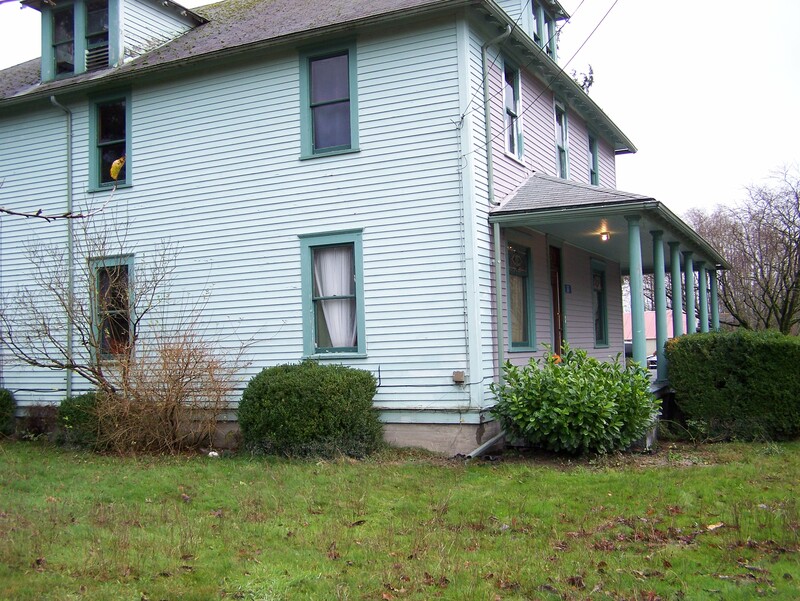 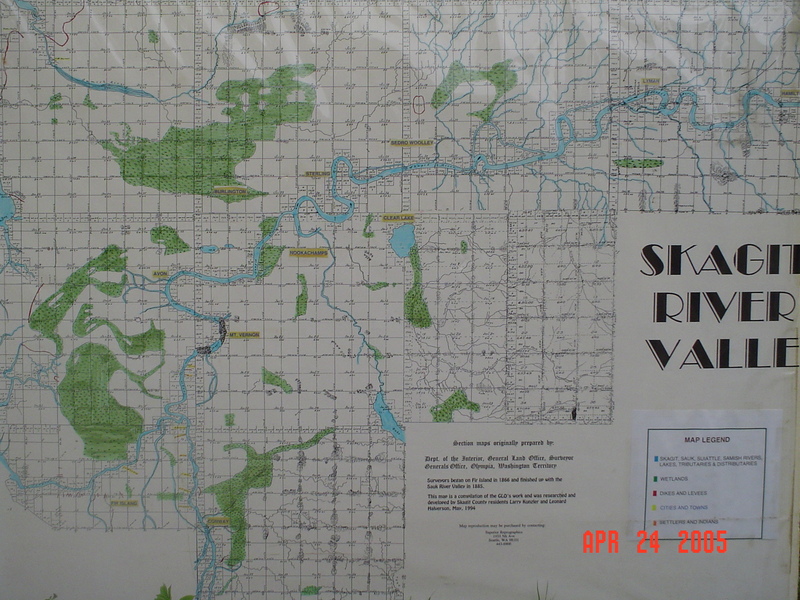 The old datum for elevations was NGVD 29. 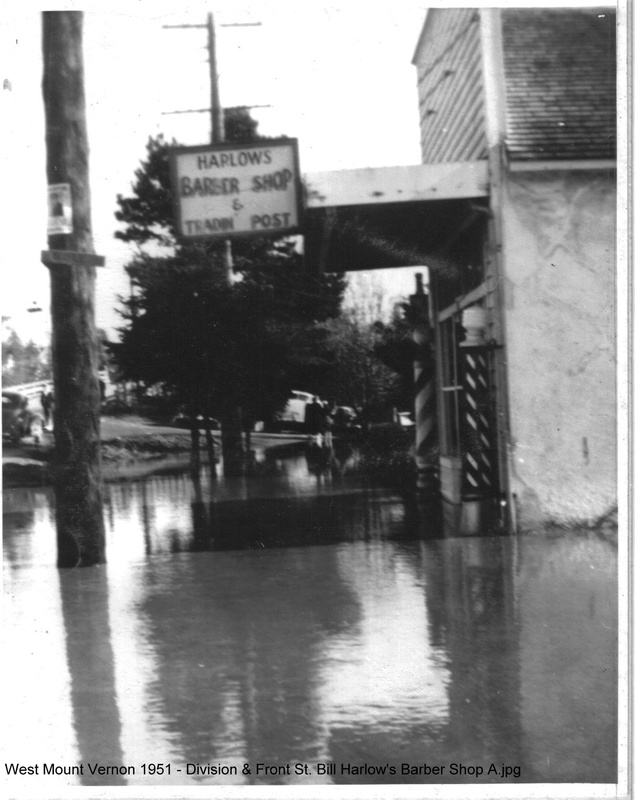 For the story behind these pictures - please go HERE and search our document & historical newspaper archives. 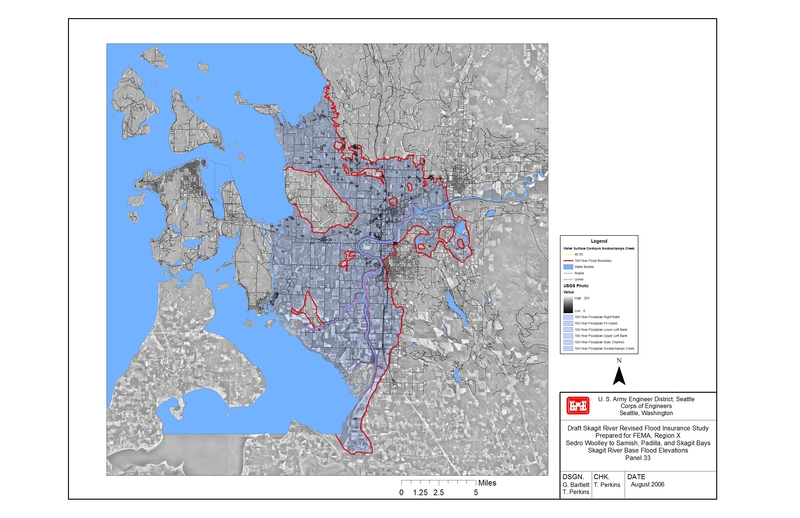 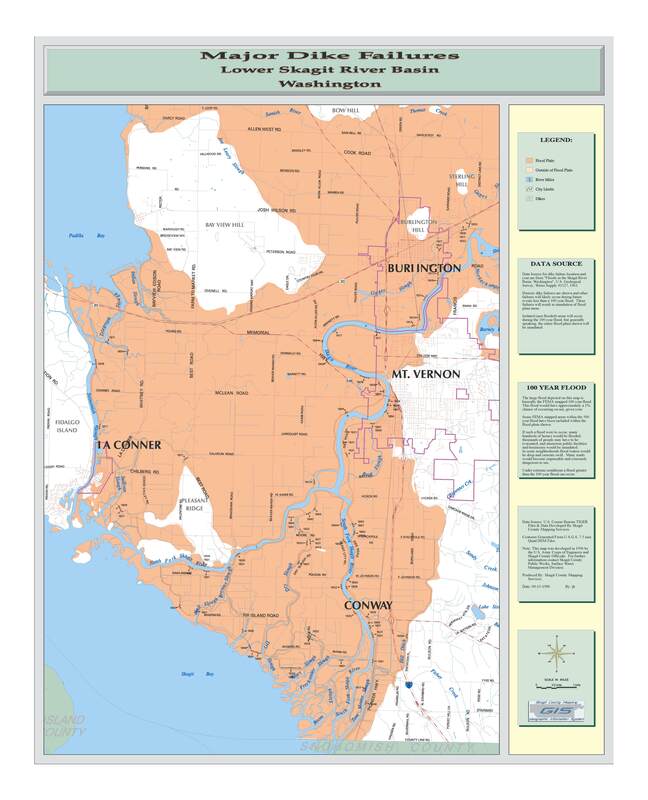 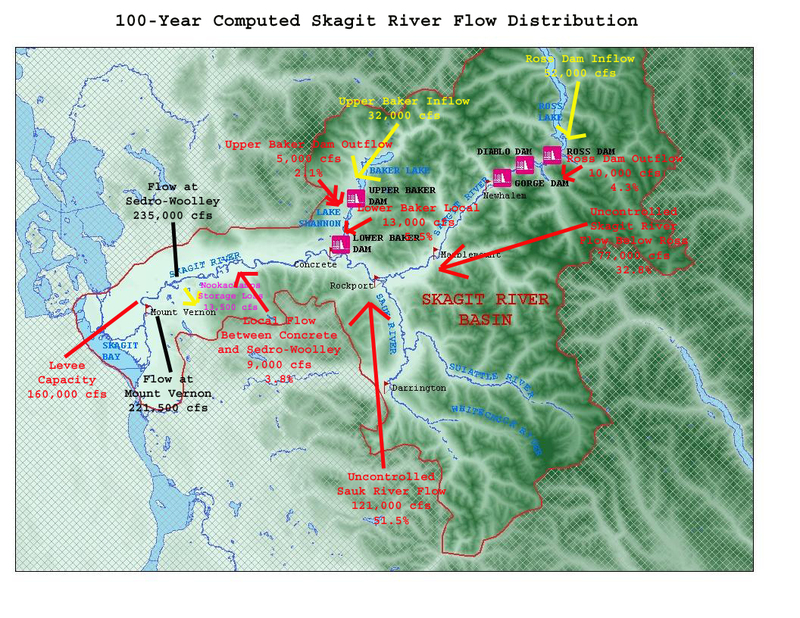 The green areas are Zone B’s, the purple area is Gages Slough (when in reality Gages Slough is high ground to high ground and the old river channel of the Skagit River 1,500 years ago). 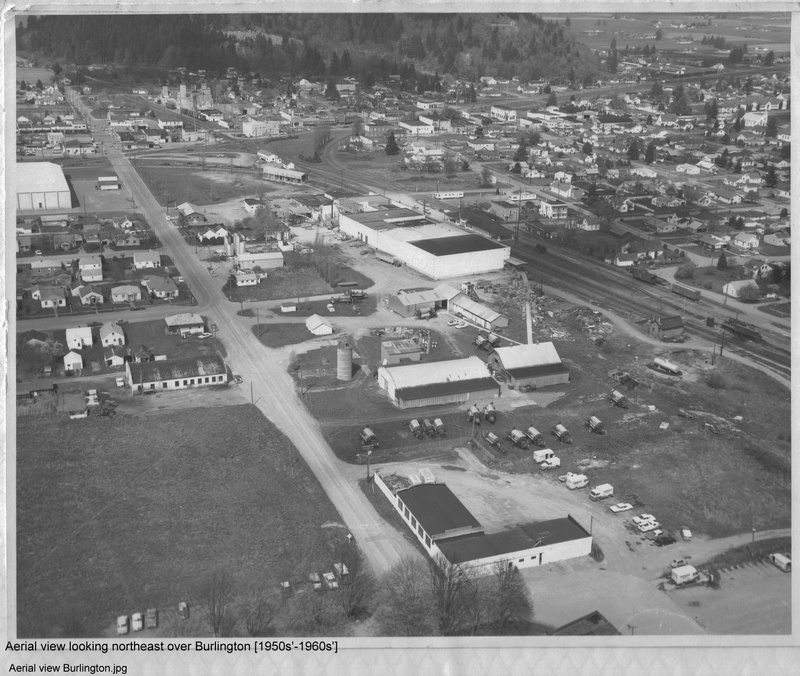 The handwriting on the map are figures that came from the much discredited Summary Report for DEIS - Hydraulic Investigations: Cascade Mall at Burlington of 7/12/1982. 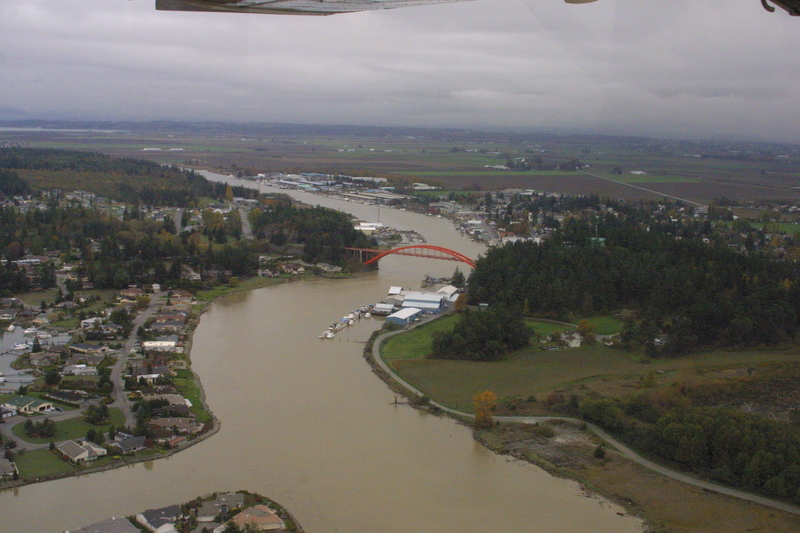 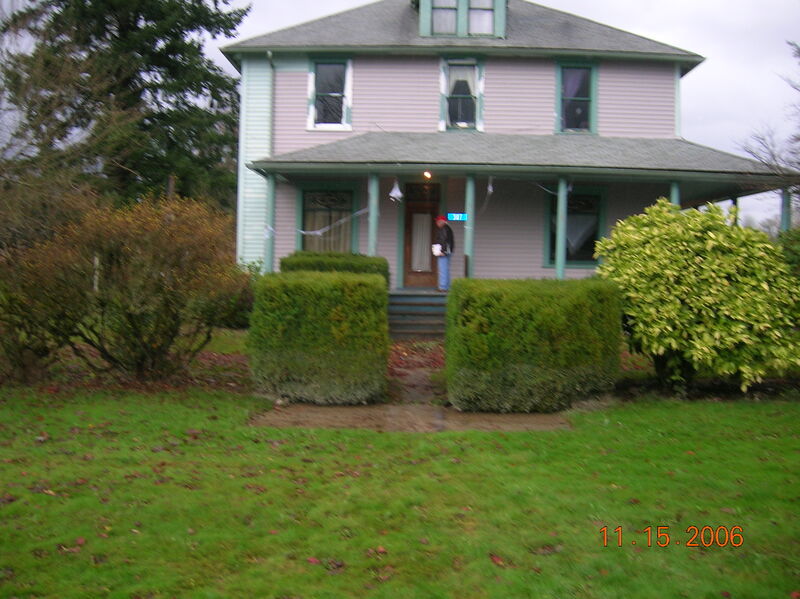 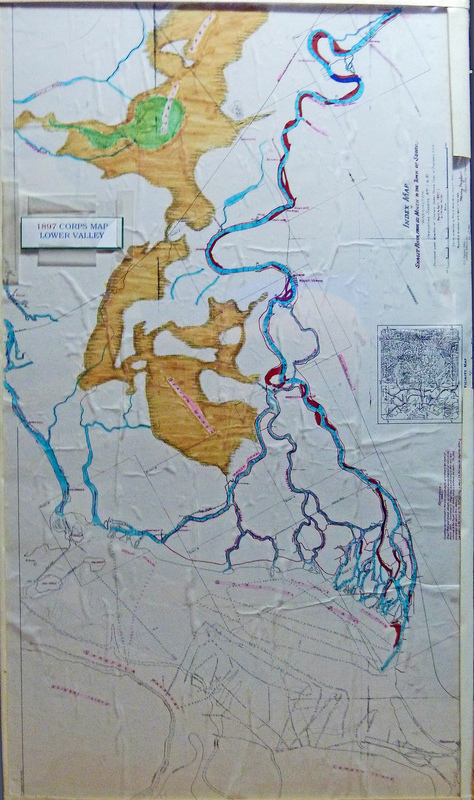 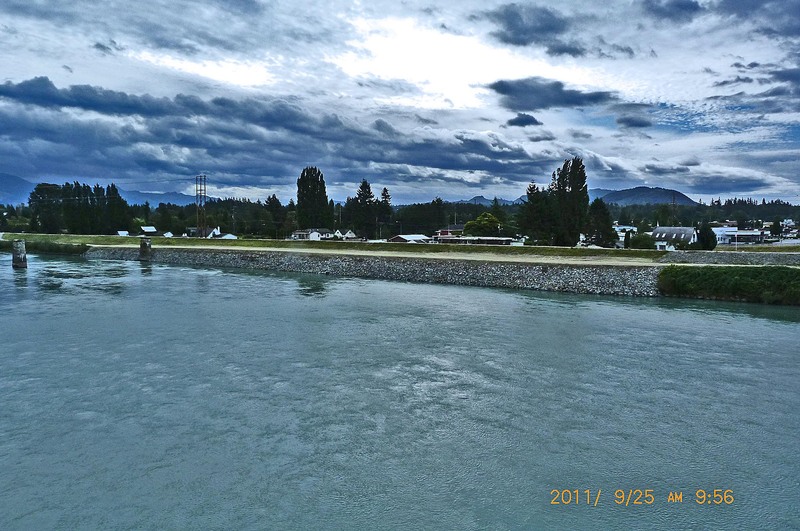 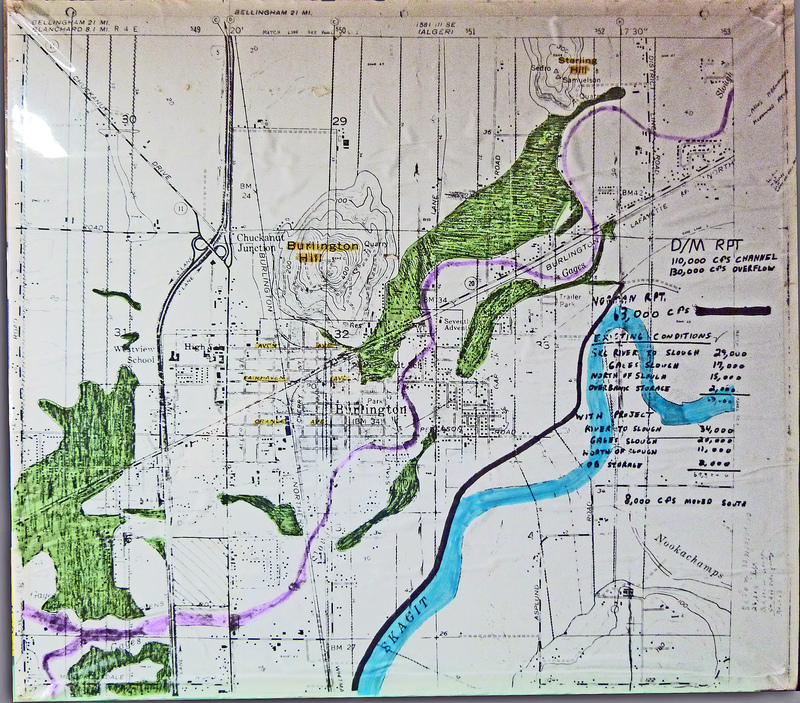 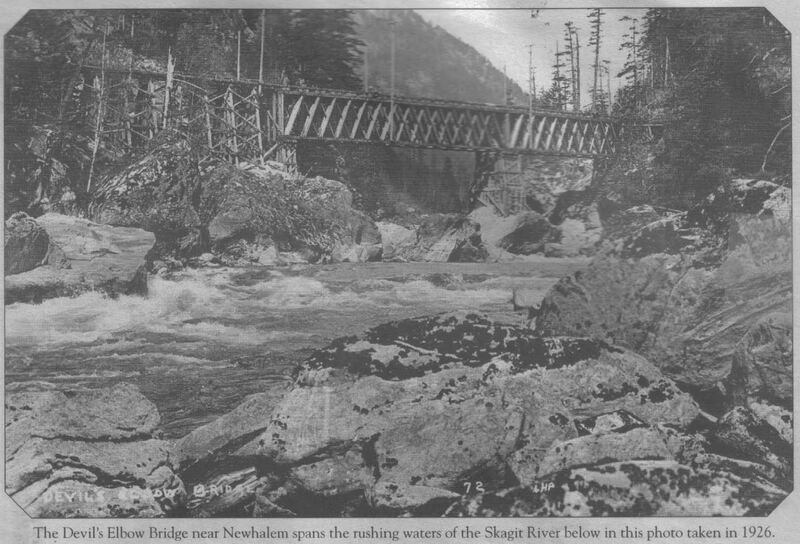 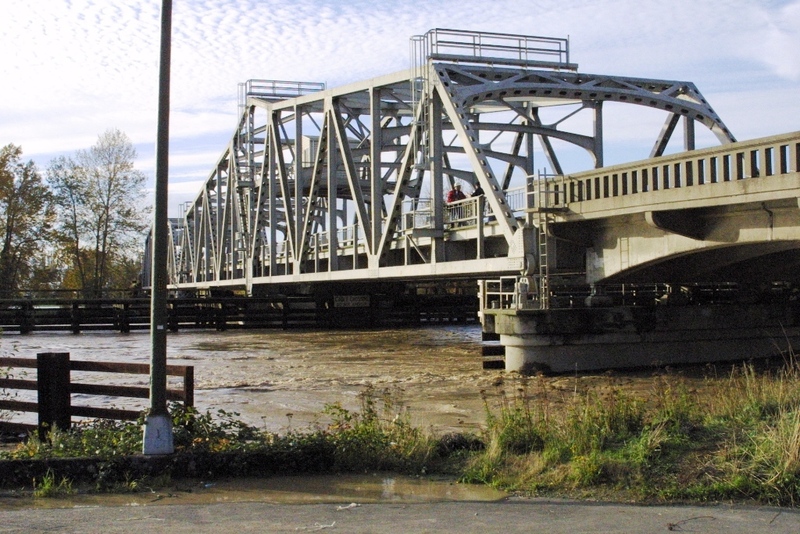 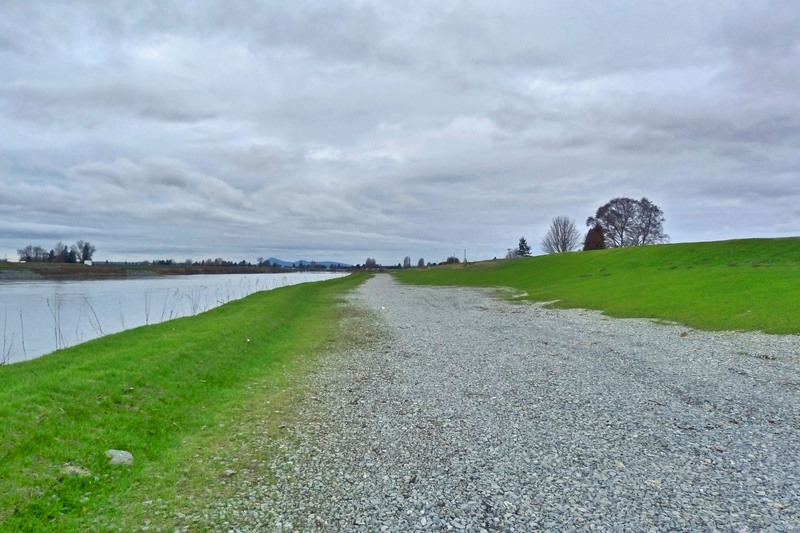 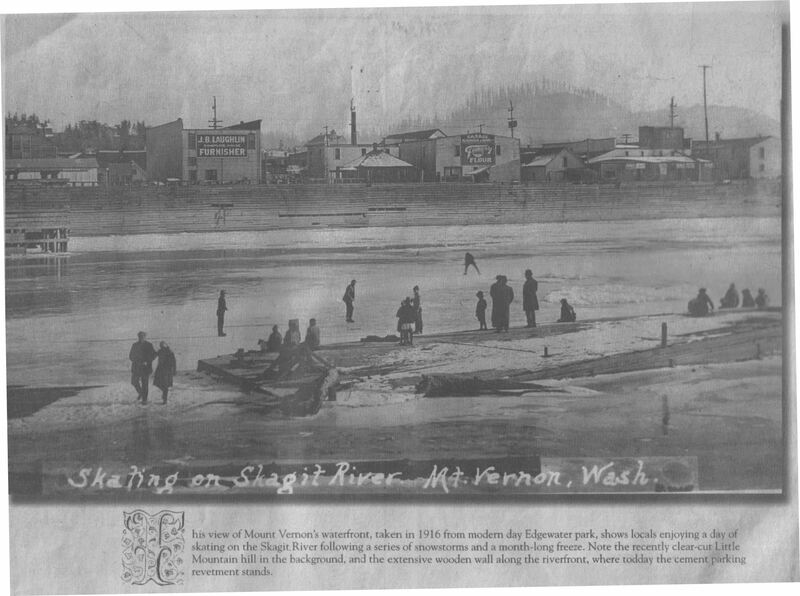 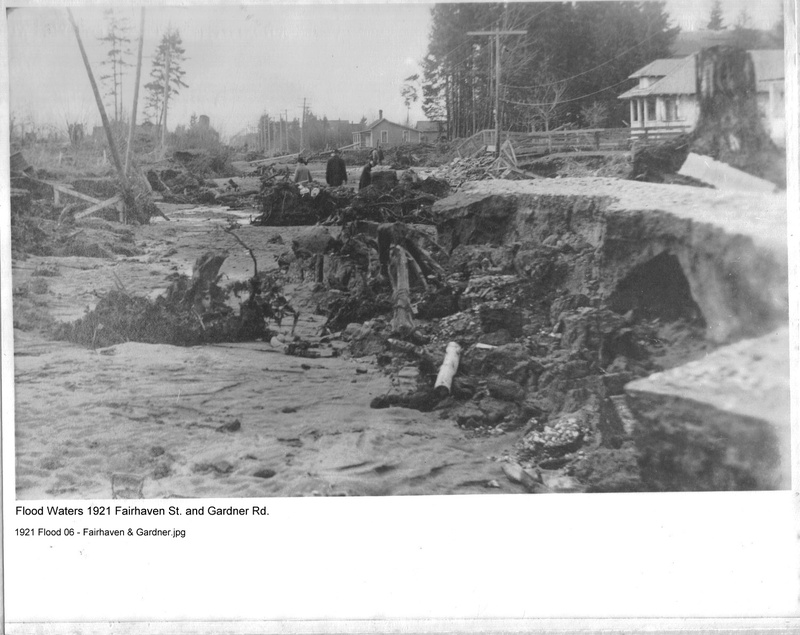 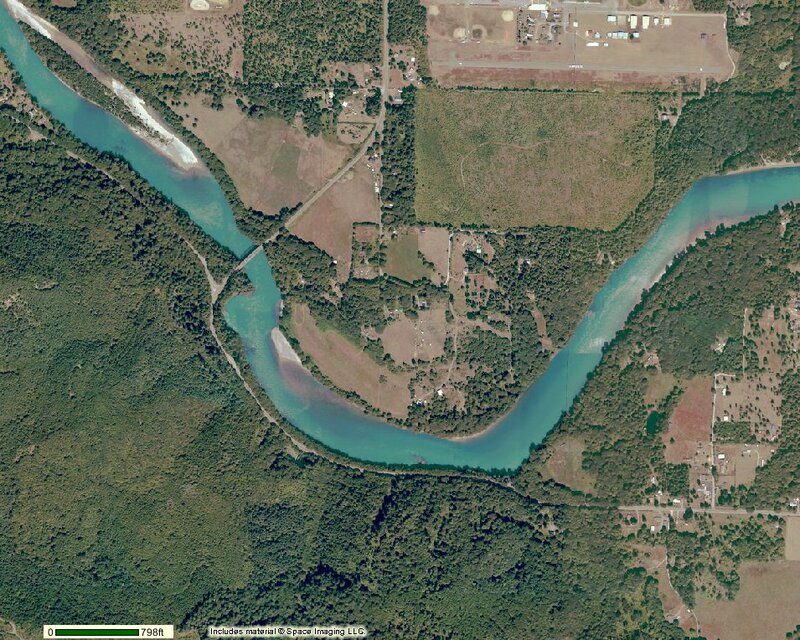 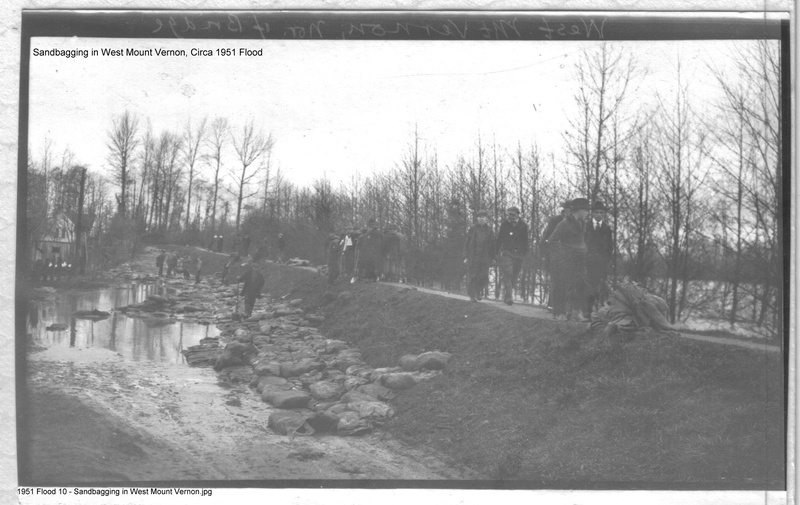 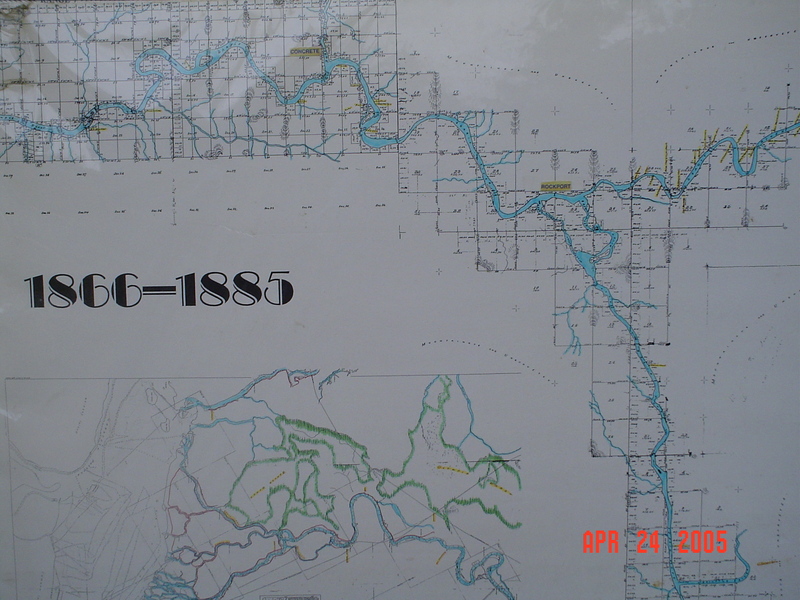 Shows the three historical paths of the Skagit River. 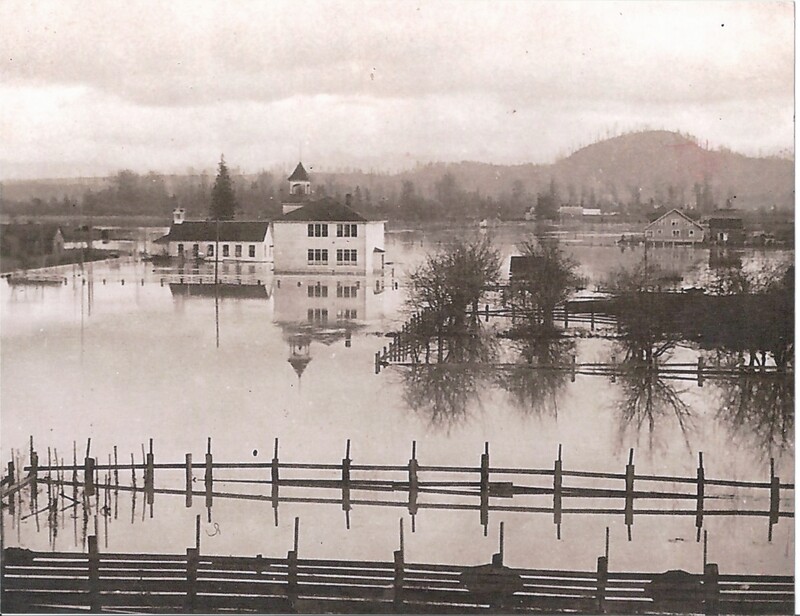 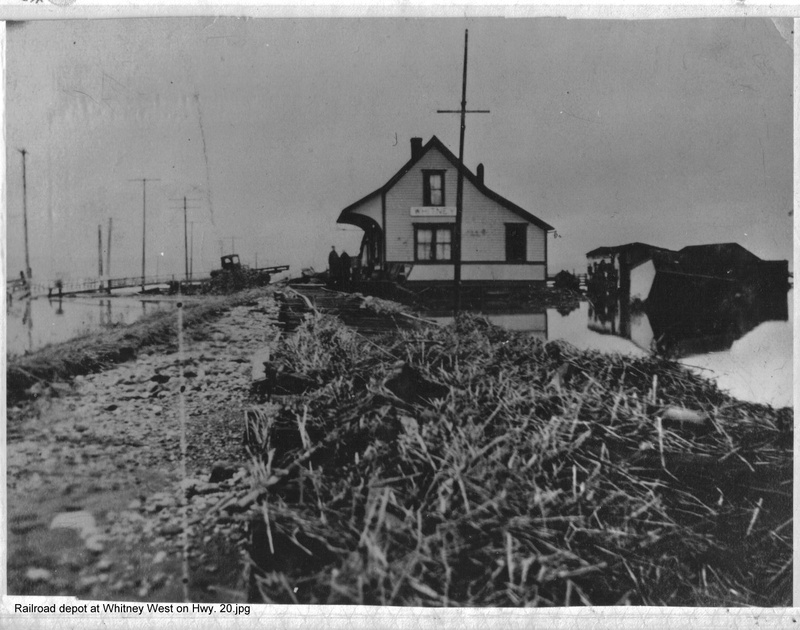 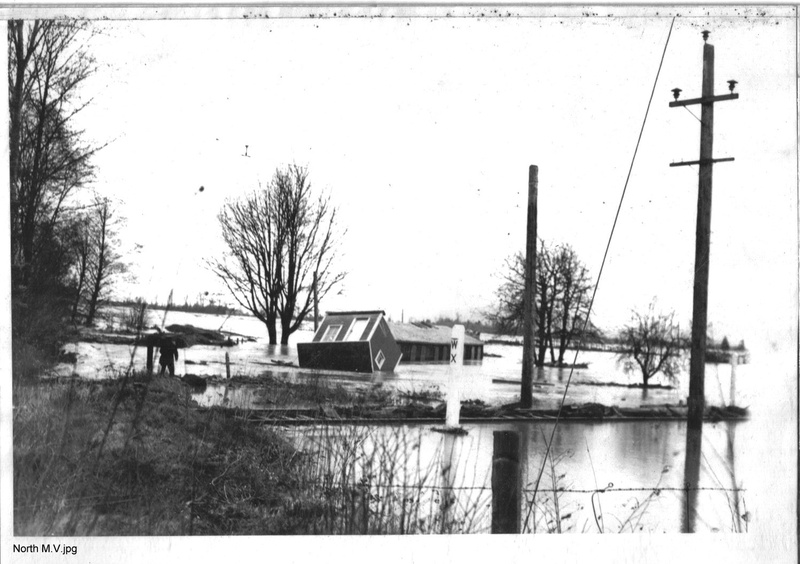 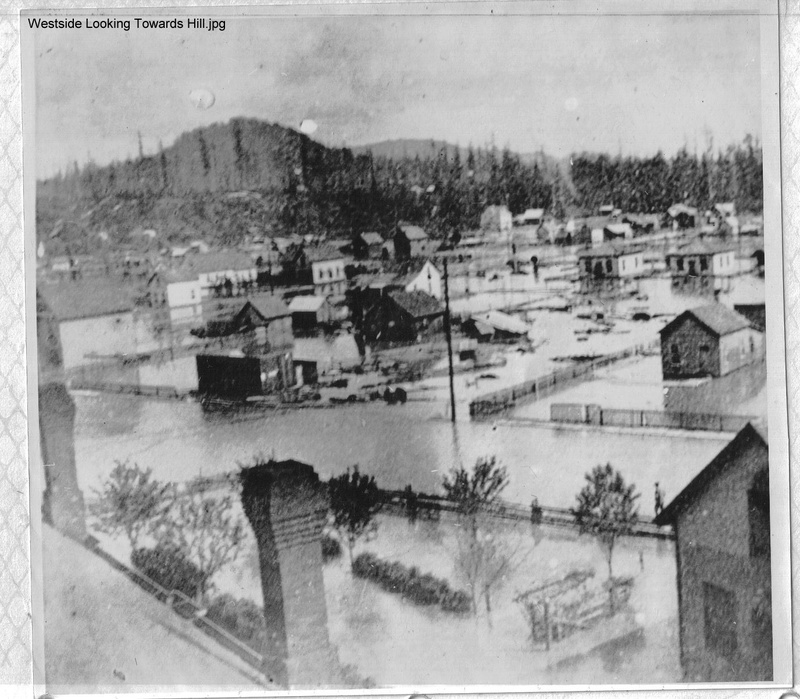 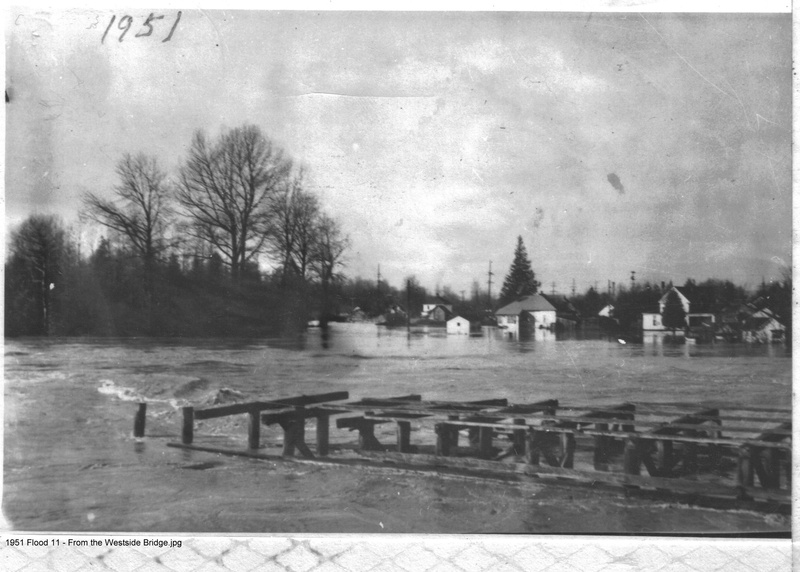 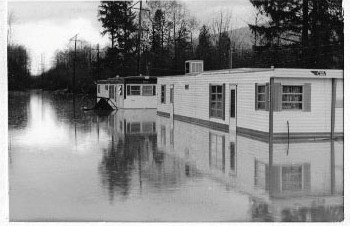 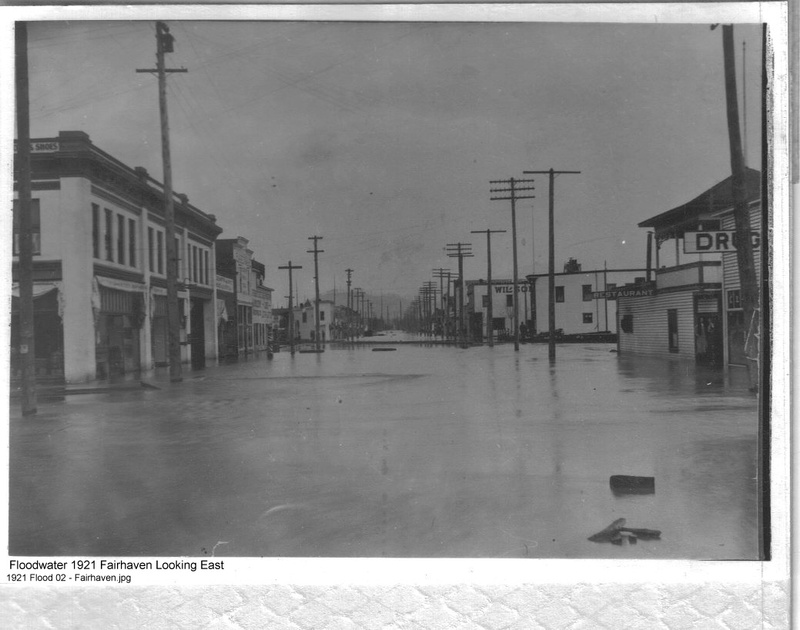 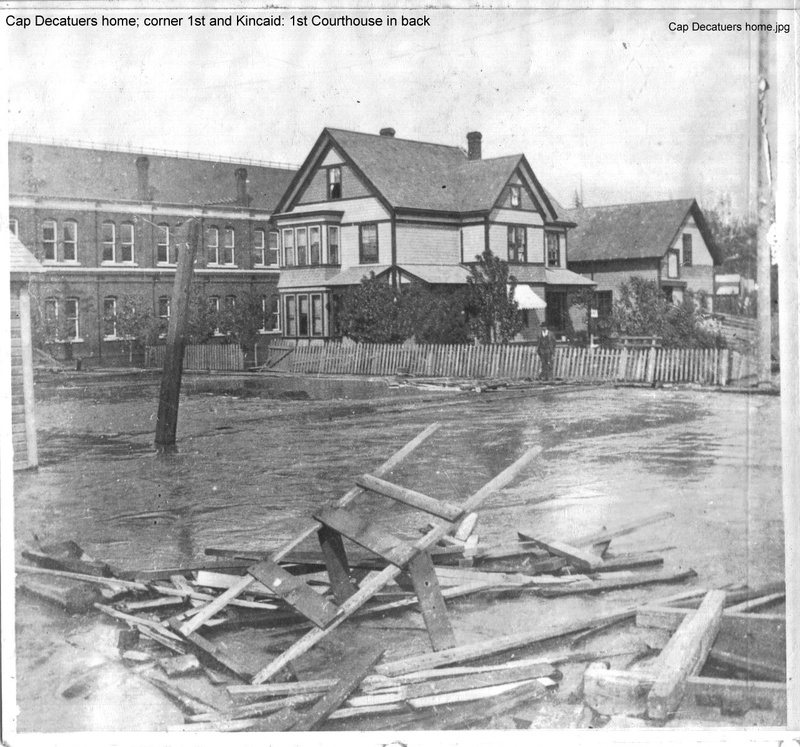 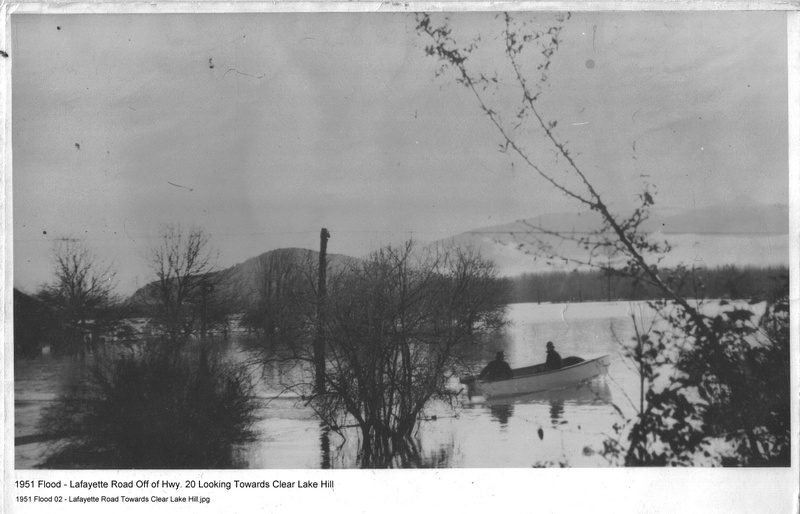 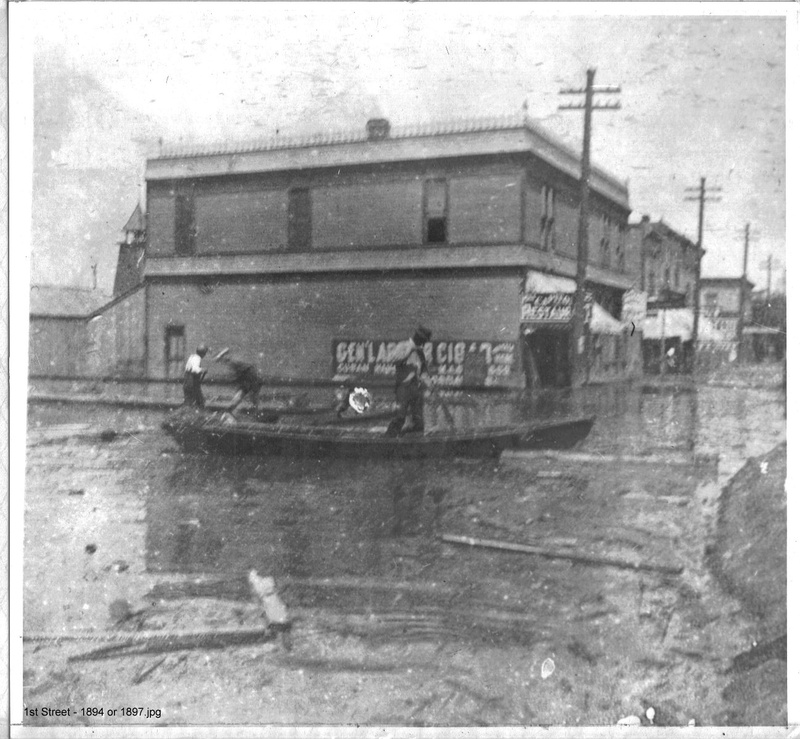 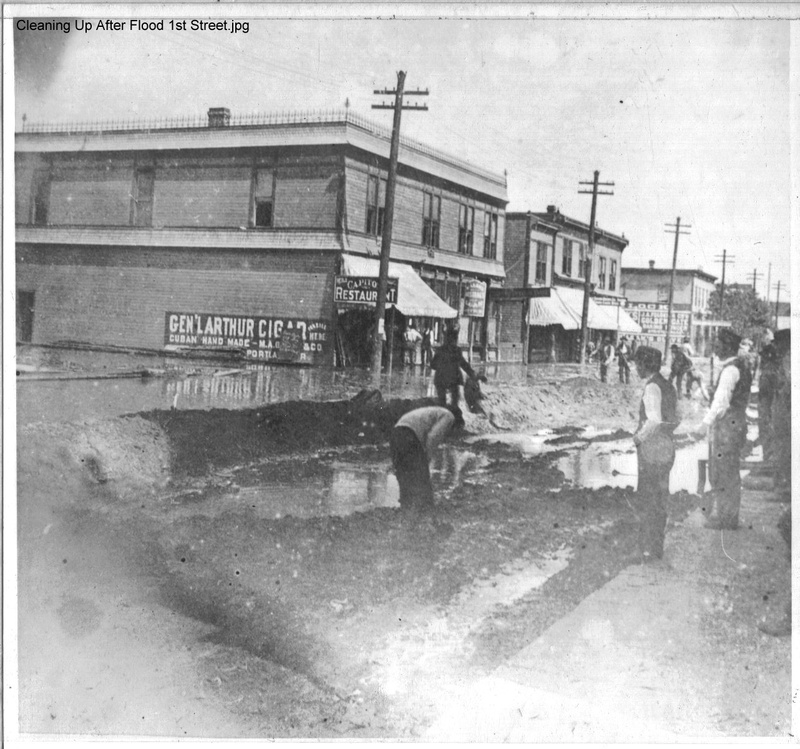 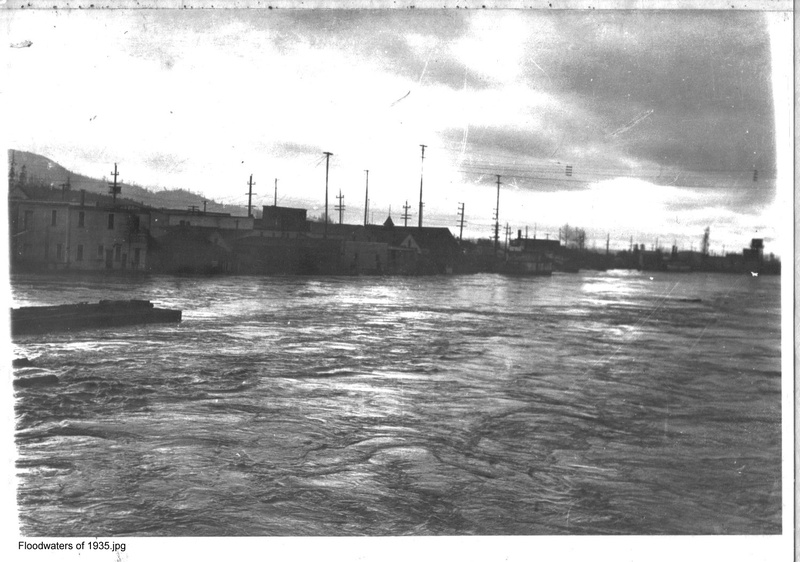 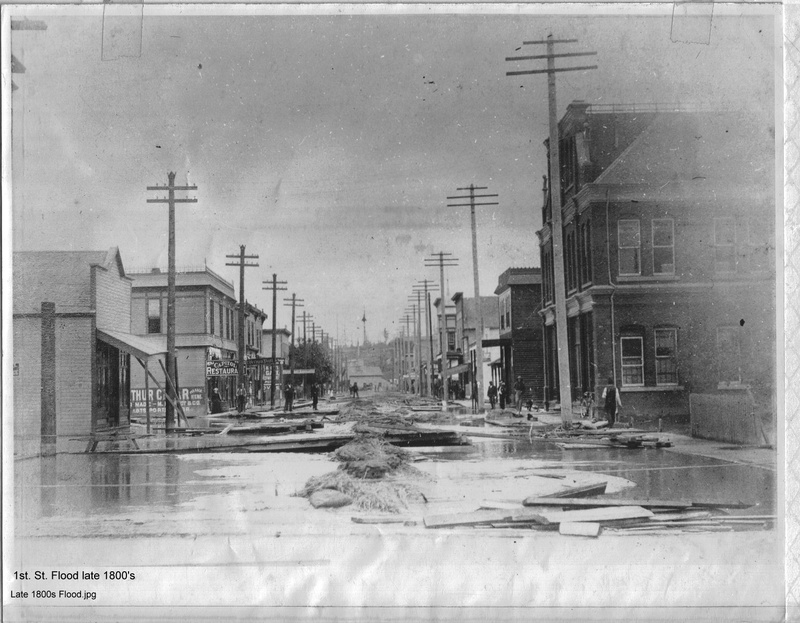 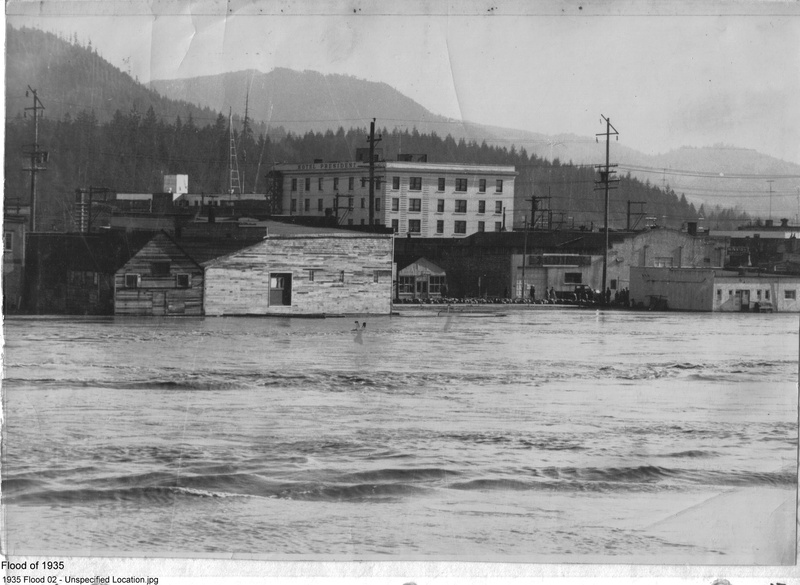 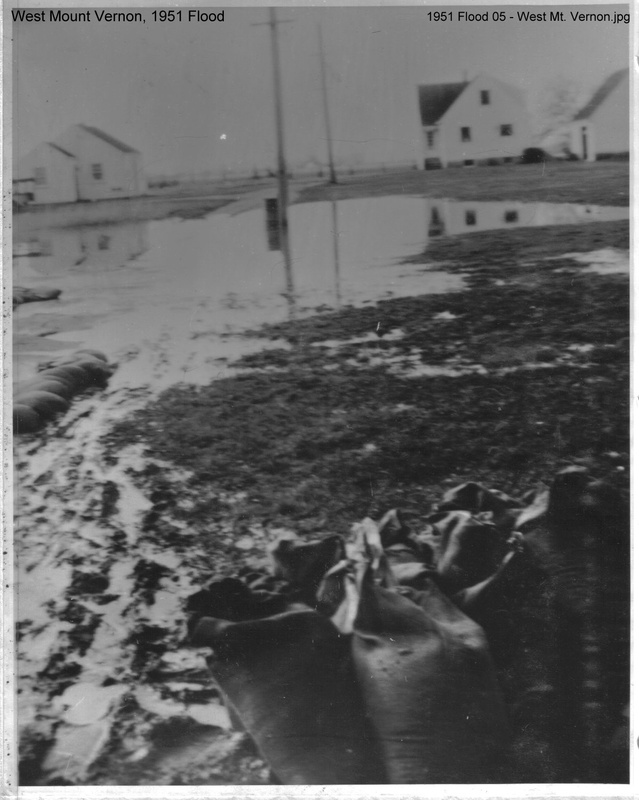 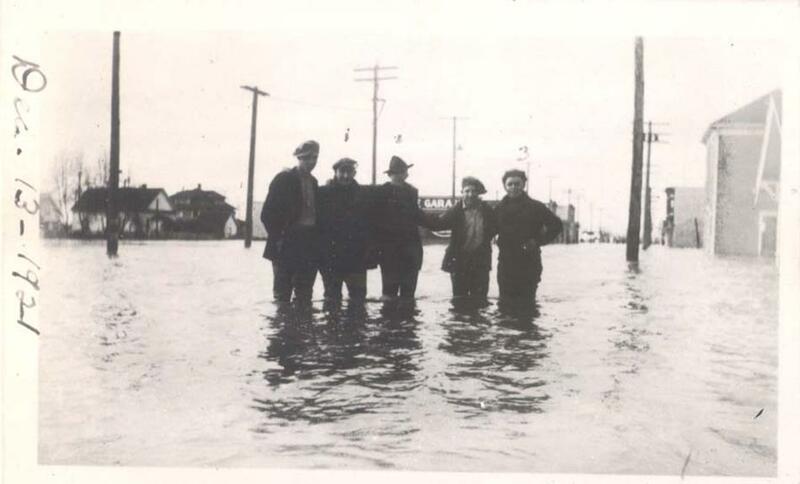 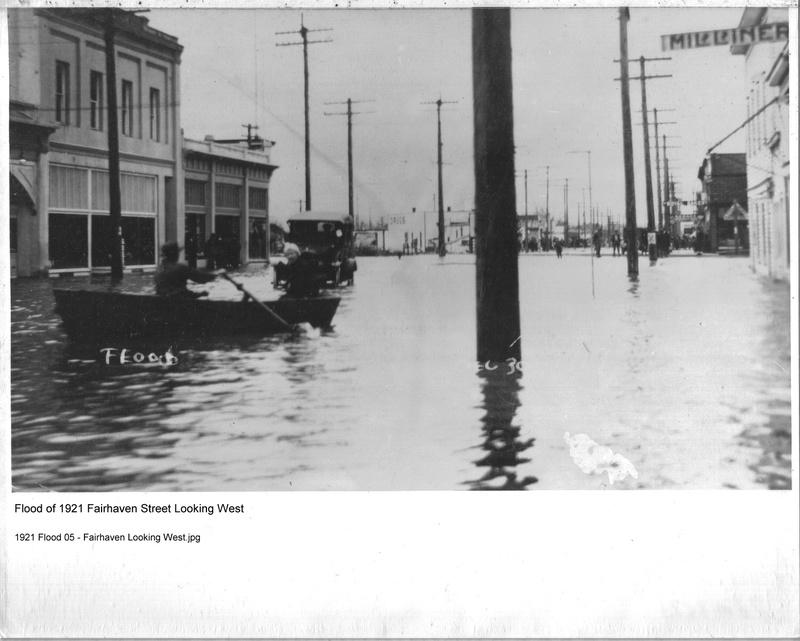 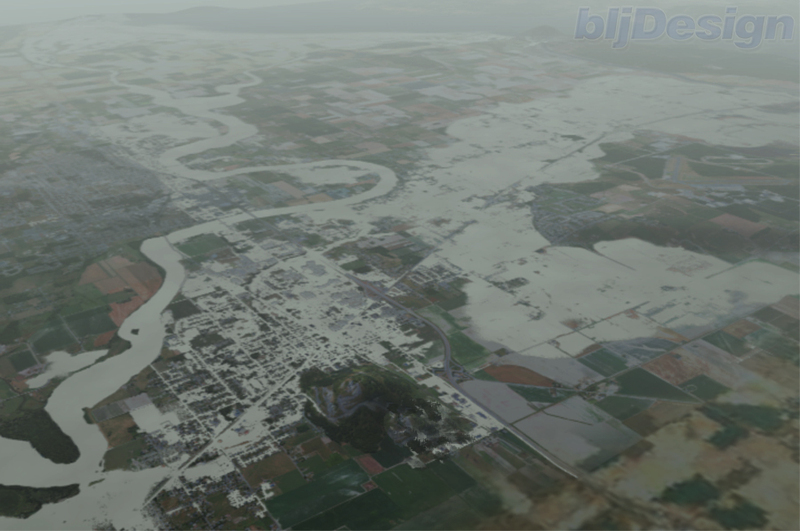 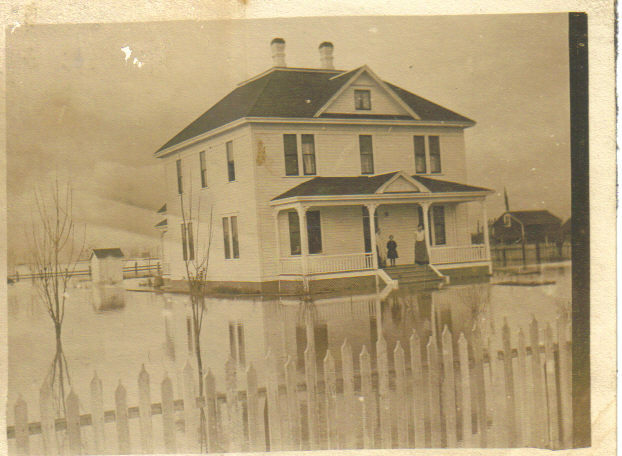 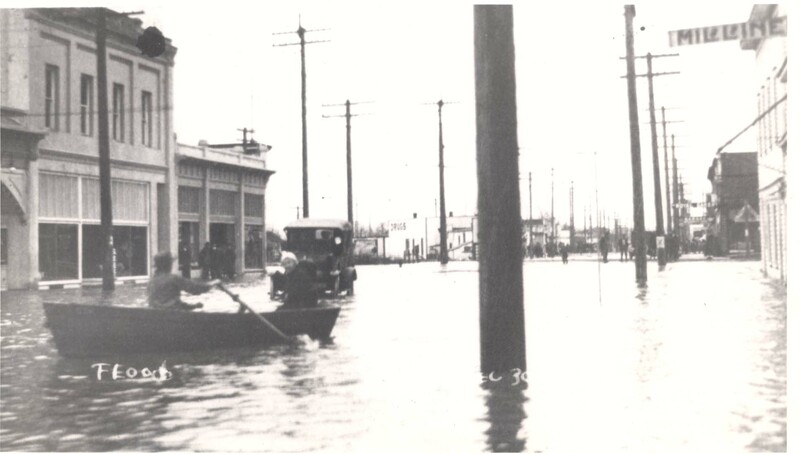 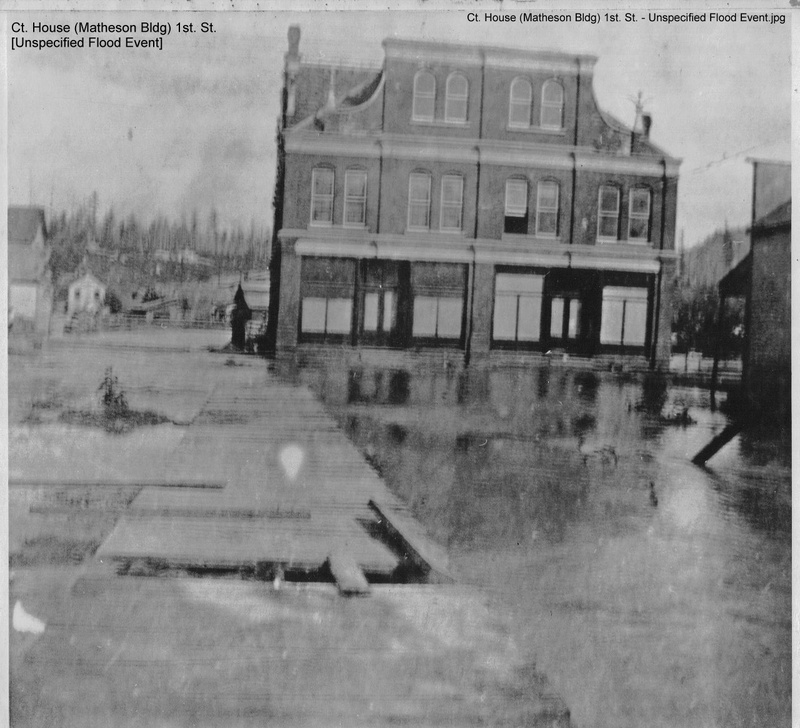 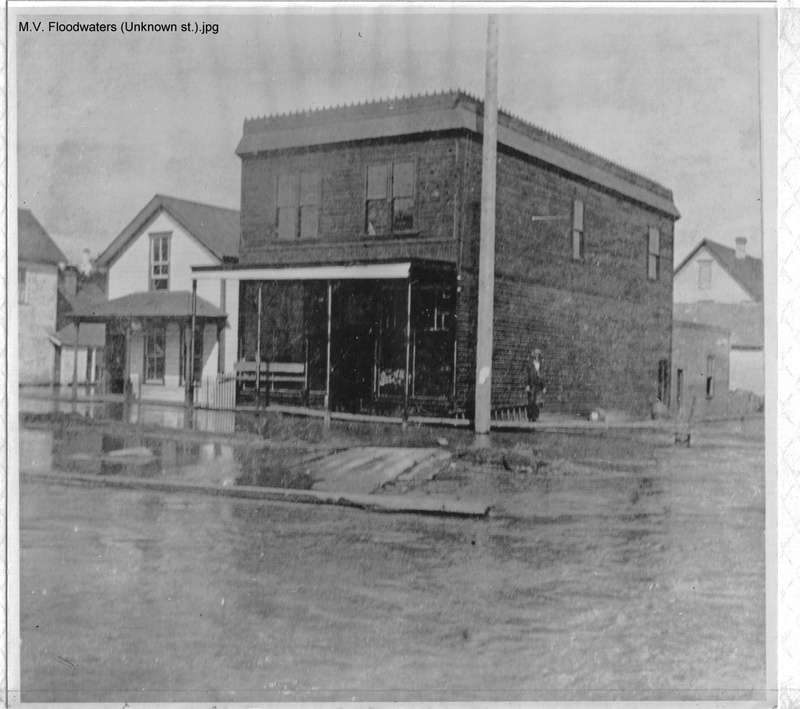 If you have any pictures of your own, especially of historic floods, electronic or not - please e-mail the webmaster so we can post them to the website. 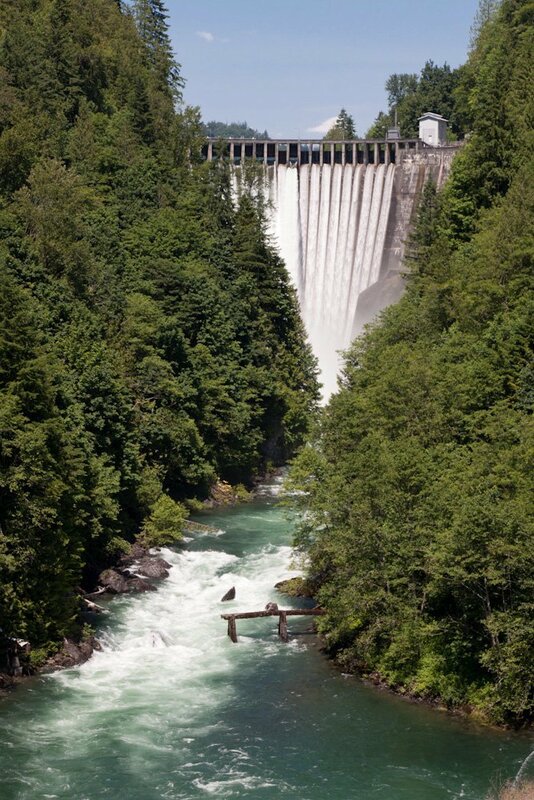 We will give credit to the donor, unless requested otherwise.